It’s not as apocalyptic as it sounds in Ushuaia. ‘El Fin del Mundo’, as Ushuaia likes to call itself, translates as ‘the end of the world’ but they’re using this title in a geographical sense as it’s the last city in the south of Argentina, closest to Antarctica. 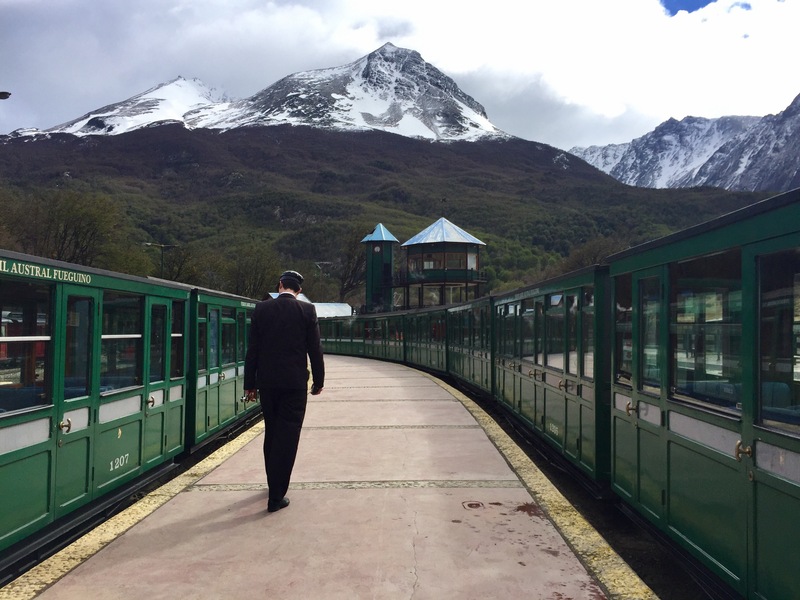 It’s also most travellers last (or first) stop in Patagonia. It rivals Torres del Paine for expensiveness and there’s a lot of attractions to spend your money on. Luckily, although maybe not for my bank balance, I had four full days to spend here so I had time to do all of them. I realised that I may never come back to Ushuaia so I should make the most of the opportunity and cough up some of my cash. 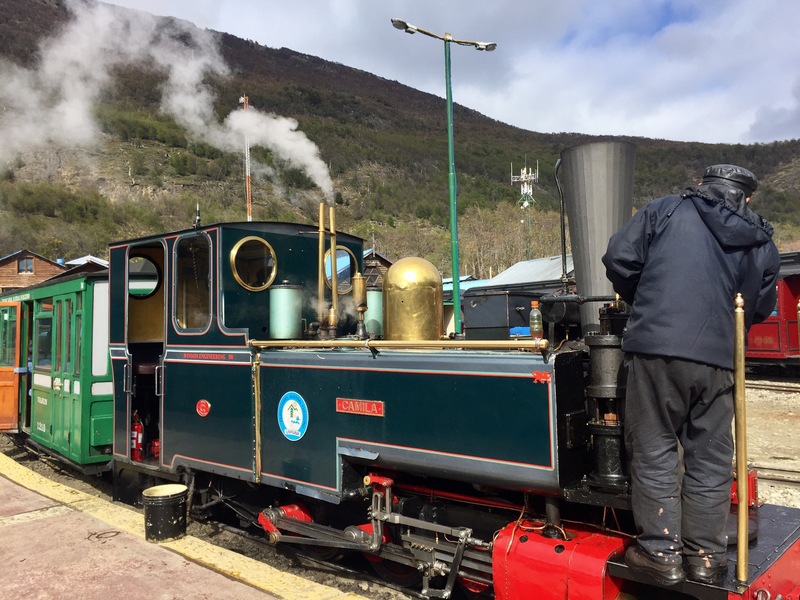 Most people consider the train at the end of the world an expensive gimmick but for someone who had never been on a steam train before, I was really excited to experience it. 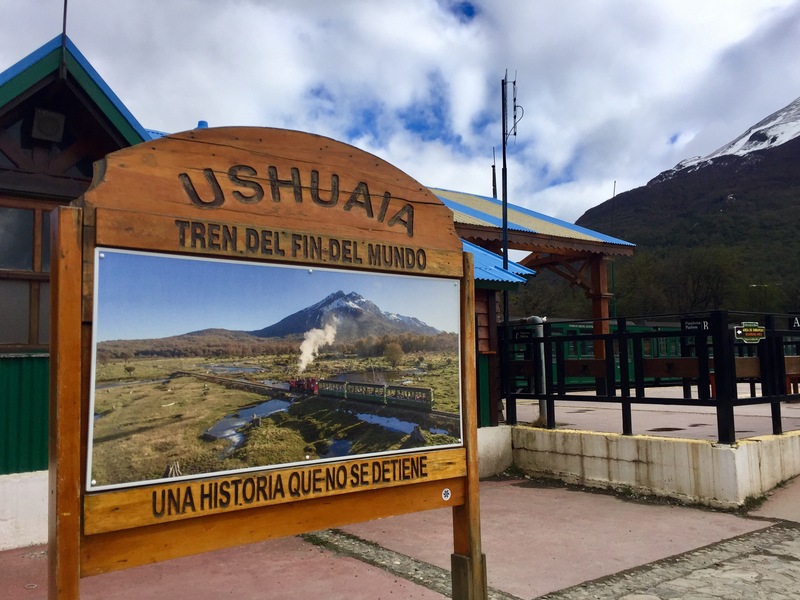 The train is an important part of the penal history of Ushuaia (more on that later) and takes you through parts of the Tierra del Fuego National Park which you couldn’t otherwise see. 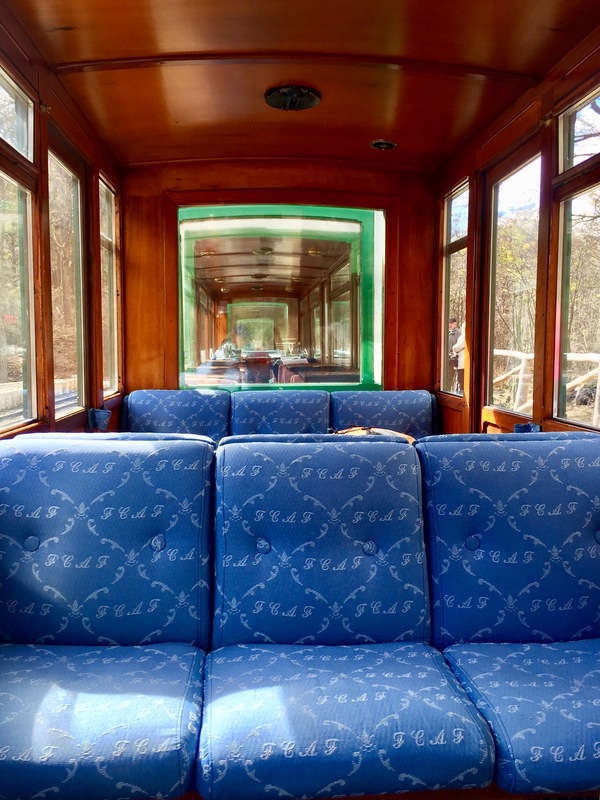 The carriages are little three-seater compartments which made me feel like I was on the set of the Hogwarts Express (another reason I wanted to take the train) and there is an interesting audio guide which is played during the journey. 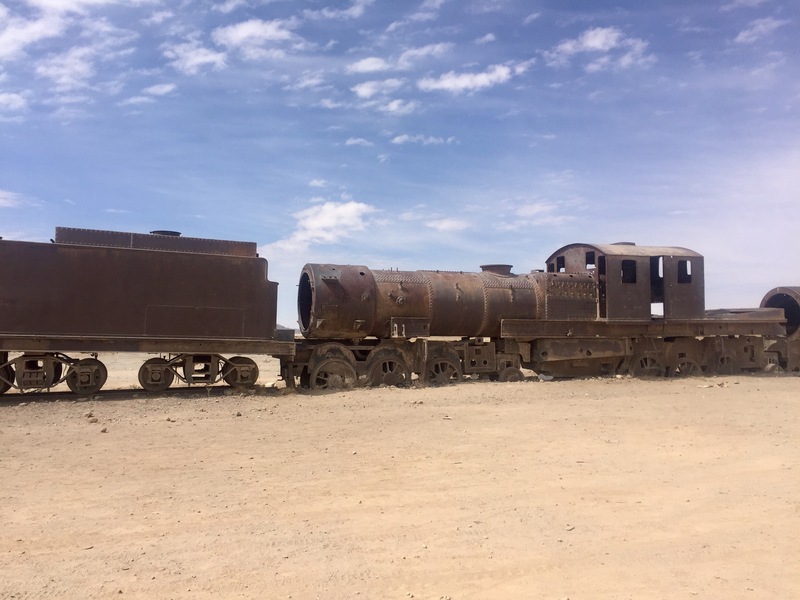 I had perfect weather for this day and halfway through the ride we were able to get out and take pictures of the train and amazing surrounding scenery – stamped by the clear impact of deforestation during the time the area was inhabited by the prison occupants. Instead of replanting, this area is left as an mark of the history of the city. 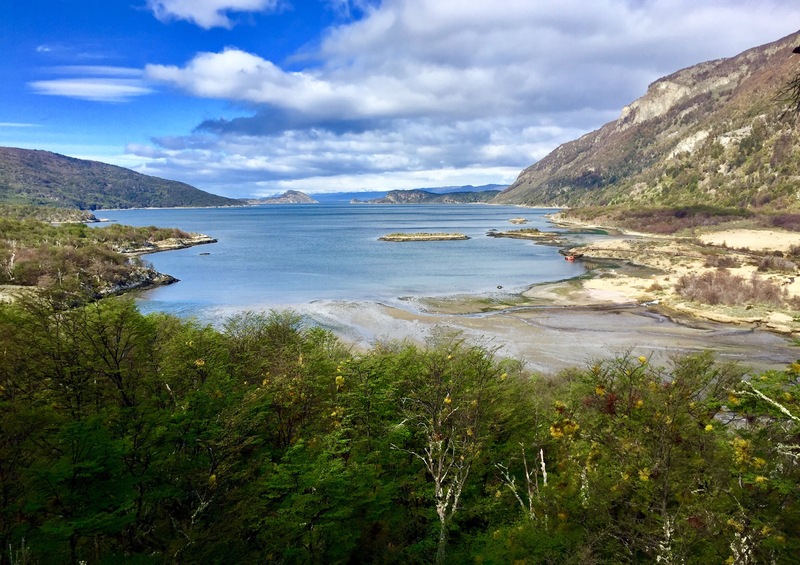 After the train ride, the minibus which had dropped me off at the train station picked me up and took me further into the Tierra del Fuego National Park. 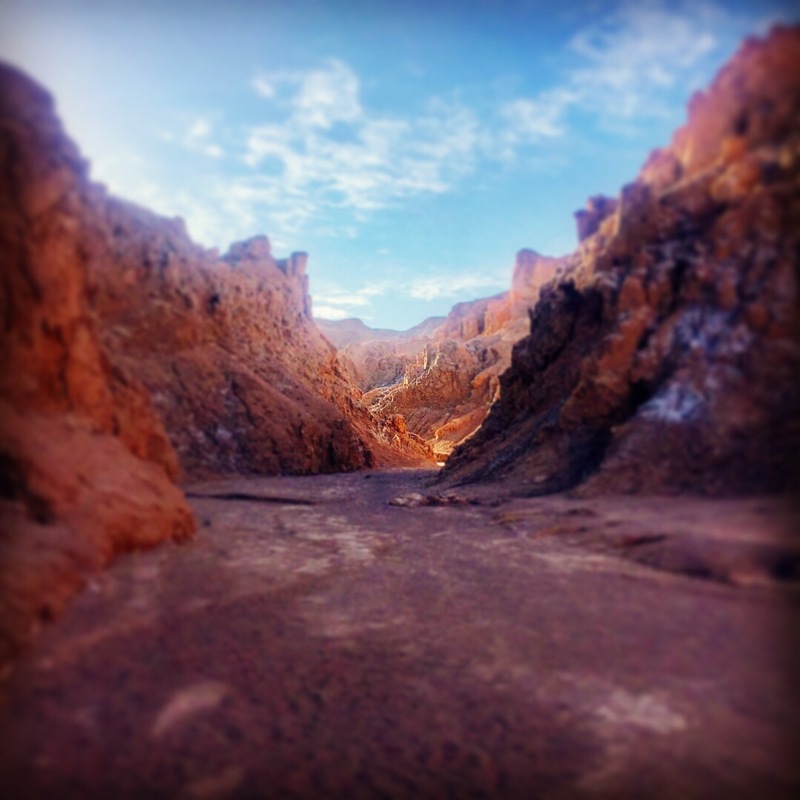 The bus dropped me off at the end of Route 3 – the most southern main road in Argentina. 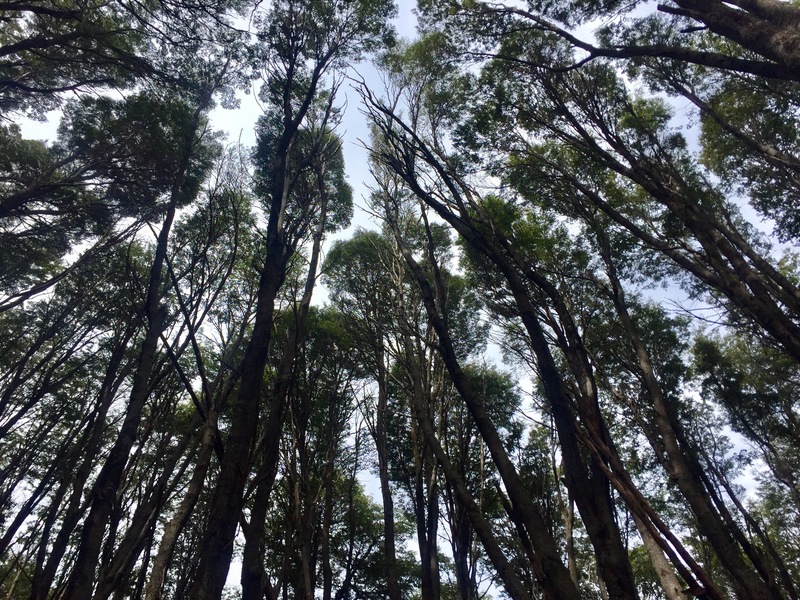 From there, there are a number of short walks you can do around the peat marshes and Lapataia Bay area. This is a beautiful place that you could easily spend the whole day strolling around. Annoyingly I only had a few hours so I couldn’t walk all the trails but the bits I saw were outstanding. 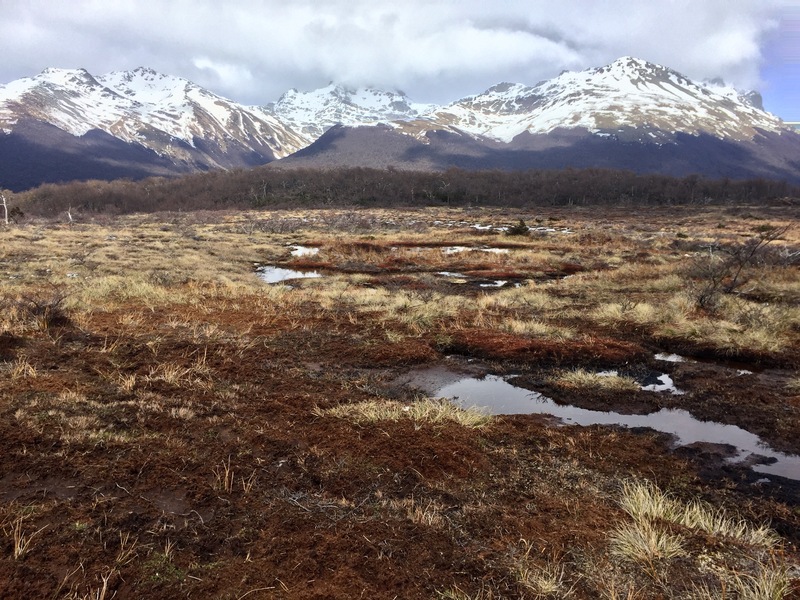 I didn’t know anything about peat before reaching Ushuaia but it has a lot of positive benefits and it changed the look of the landscape from the rest of Patagonia. 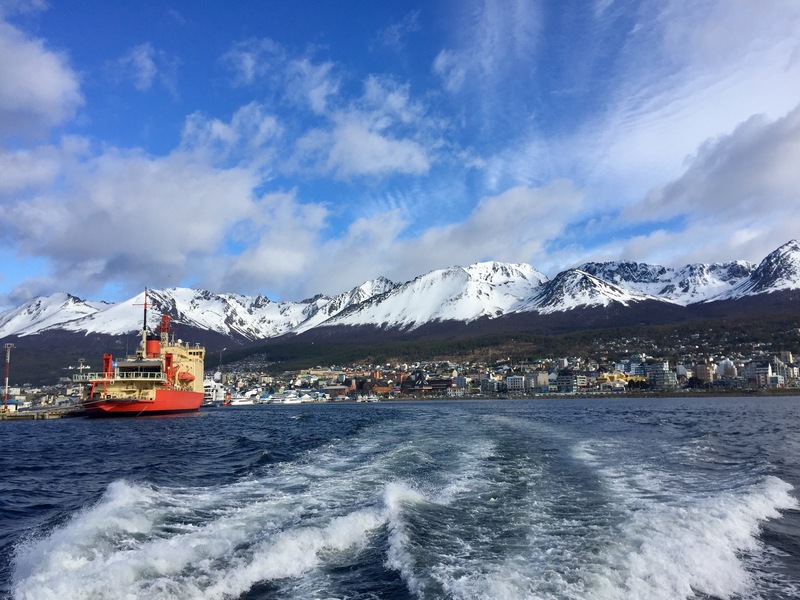 The next day I shelled out for the most expensive day trip of my time in Ushuaia – a cruise of the Beagle Canal. I don’t know a huge amount about the Antarctic expeditions and navigations of the south but I do know that the Beagle Canal was an important part of the history of this period. 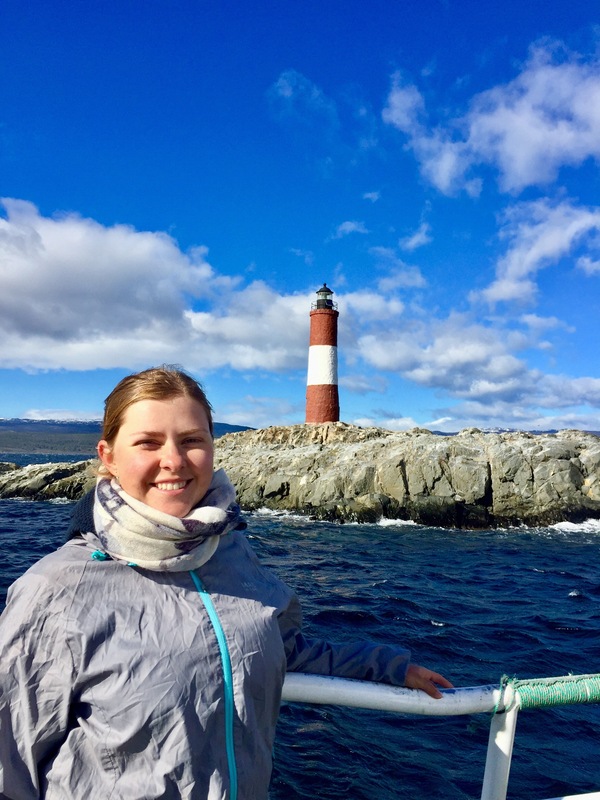 It’s the only passage through Argentina and Chile out to the Pacific Ocean and I felt very lucky to be able to afford a boat trip along this notary route. 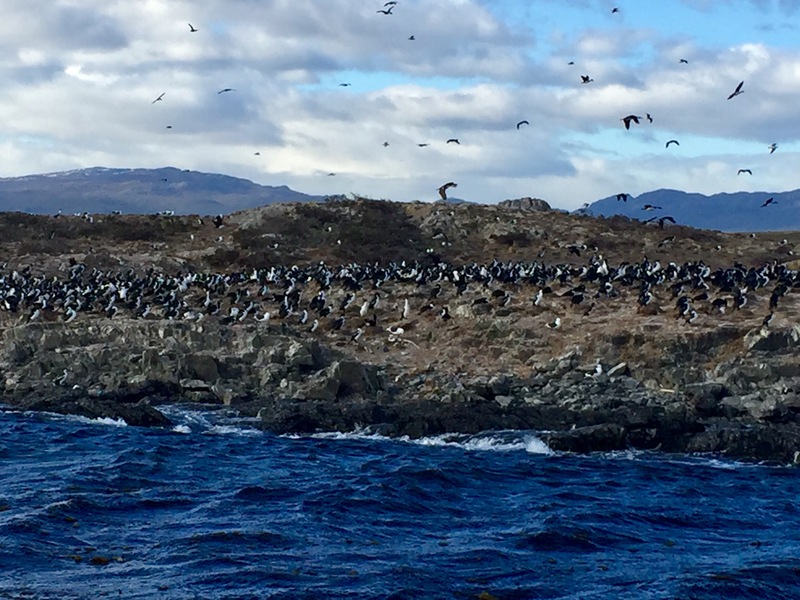 Most of the boat trips include a visit to the (weird) bird island, the sea lion island and the lighthouse at the end of the world. Only some include the penguin island (Isla Martillo), mostly because it’s the furthest away. These trips which include a chance to see the penguins are the most expensive but I decided that I hadn’t come all this way not to see them. It’s only just the start of the season where the penguins arrive so it was a bit of a gamble to go with this option but it was definitely worth it. The (weird) bird island was the first stop and it was jam-packed with these seagulls posing as penguins. I was momentarily deceived before I remembered penguins can’t fly (thanks Madagascar movie). They weren’t the main attraction of the trip but still pretty cool to see and they were much better than the plain old white seagulls we get in England. 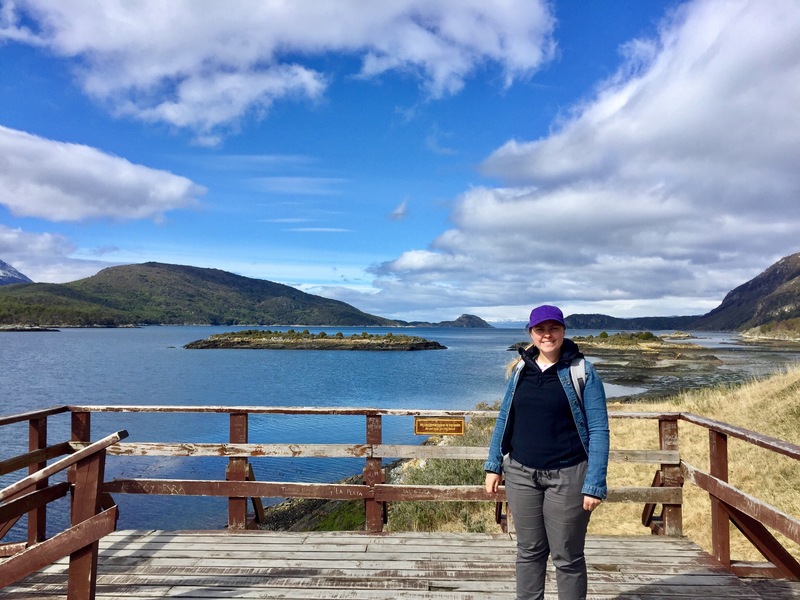 Next was the sea lion island which I thought was very impressive although quite quiet – only a handful of sea lions were perched on the rocky cliffs. They clearly don’t like the boats visiting them because they kept swimming away every time we got closer. It was the first time I had seen a sea lion not in a zoo (and I’m not even sure I’ve seen them in the zoo). They’re so much bigger than you would expect and their ‘lion-like’ qualities are interesting to watch. Les Eclaireurs lighthouse was the next stop and it really has an unstated beauty. It’s not technically the last lighthouse at the end of the world but that’s what it’s famous for. The distinct red and white against the blue of the sea stands out starkly adding to the meaningfulness of the remote location. I took so many picture of this simple lighthouse – it’s situation is just mesmerising. Finally we reached the penguins! 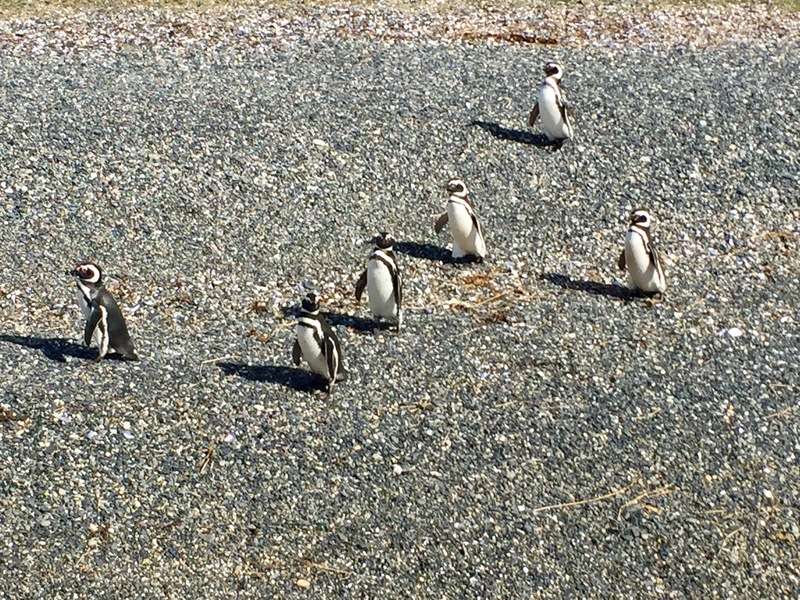 The gamble was worth it because there were a fair amount of penguins to see. The island housed two types of penguins the Magellanic penguins and Gentoo penguins (I had to look this up because I couldn’t remember their names so I’m sorry if they’re wrong). The Gentoo penguins are bigger and just stood still in the middle of the island. I couldn’t see them so well from the boat but it was nice to see two types of penguins and really I was just glad they were there. 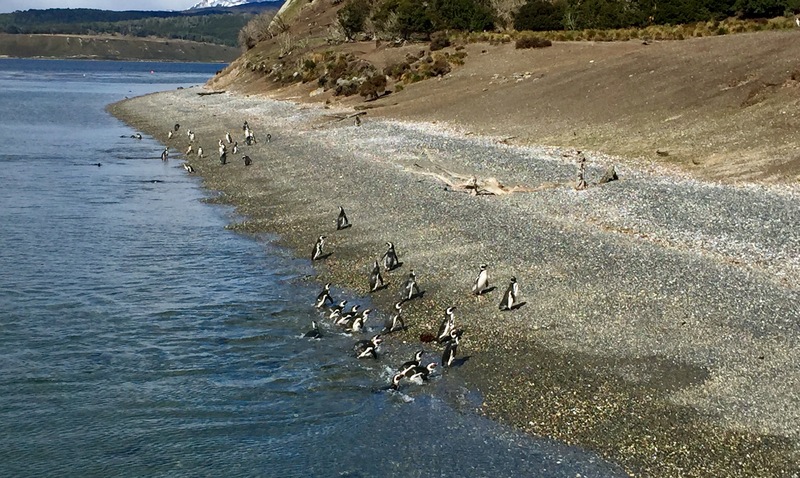 The Magellanic penguins were a lot more active and spent a lot of time on the shore. We were really close to them at one point and could observe their flock-like nature as the swam and walked in groups. As always I wanted more time to see them but they were amazing to see and worth spending the extra money on. 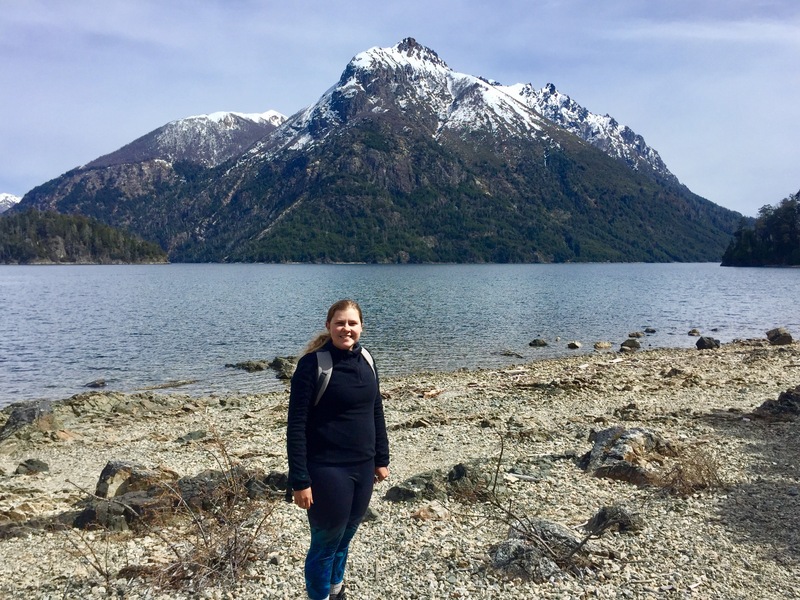 I thought I had finished my hiking days in Torres del Paine but no. 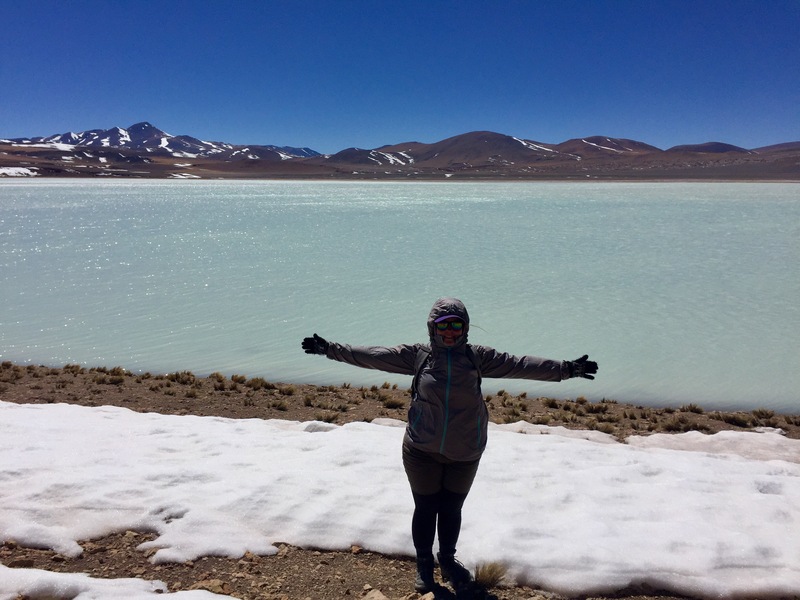 I heard about this popular and moderate difficulty hike to see Laguna Esmeralda – a blue-green lake surrounded by mountains. 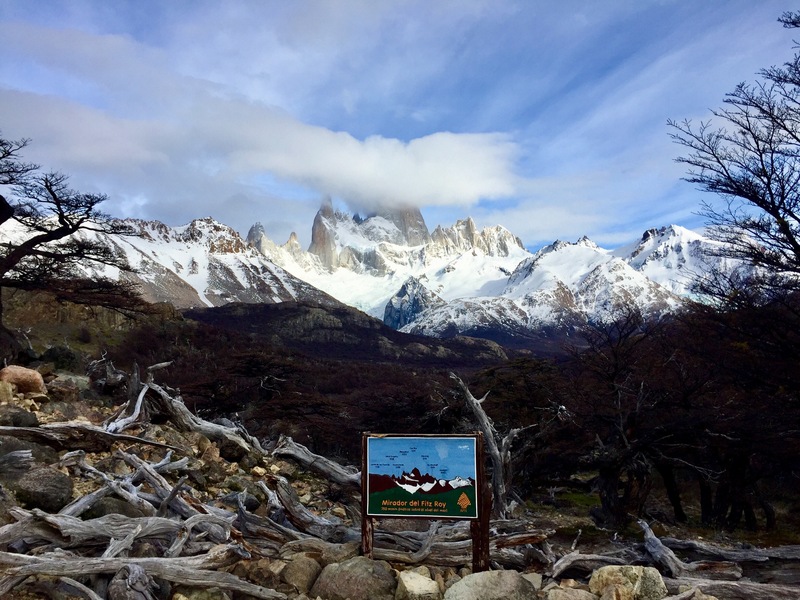 Although this sight is nothing new in my trip through Patagonia, I had heard a lot of people speak about this hike and I had time to spare so decided I would go to visit it. What I didn’t know was that the hike is a VERY muddy one through peat marches, bogs and through a very muddy woods. To us English, it was definitely an occasion for wellies but I didn’t have any so hiking boots had to do. Thankfully I picked up a large stick to hike with near the start because I had a number of sticky situations were I was stuck balancing on a stone in the middle of a peat bog. Even when a guide told me I had gone the wrong route I stubbornly persevered and managed to find a route out. After two hours of hiking through the mud, I eventually reached the lagoon and it was completely free from other hikers. I must have had the perfect timing because I could take all the pictures I wanted without obstruction. The lake was half-frozen and this made it stand out against the others I have seen. The surrounding mountains were clearly visible despite the clouds sitting behind them and I felt lucky to get such good weather. On my last day I had to check out of the hostel at 10am which was quite annoying considering my flight to Buenos Aires wasn’t until 8:30pm. But the hostel did let me leave my big pack there during the day even if I wasn’t allowed to stay. This meant I had time to visit all the museums in Ushuaia and learn about the history of the city. 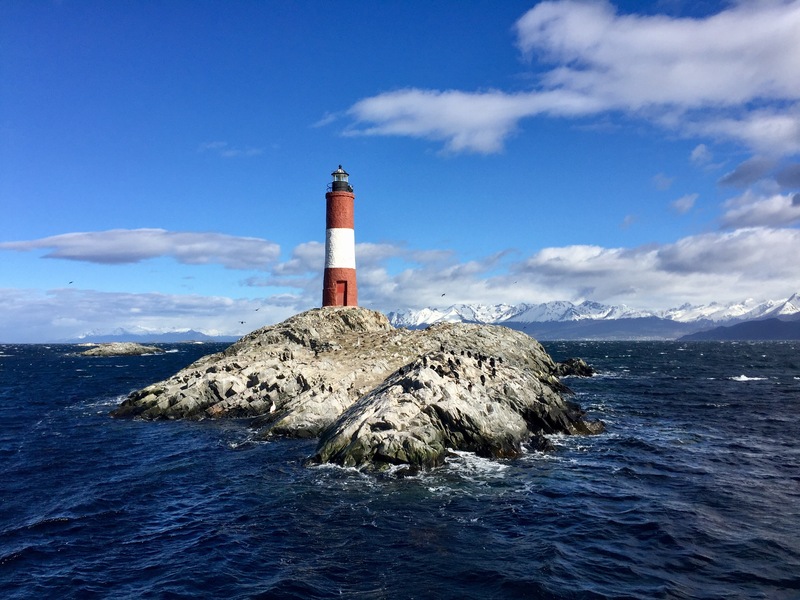 The best place to learn about Ushuaia is the famous Museo Maritimo y del Presidio (the maritime and prison museum) housed in the original prison. This is a huge museum and after spending two hours there I did start to lose concentration so I definitely could have learnt more about the maritime heritage and Antarctic expeditions but I focused on the prison section of the museum as I’d learn about this on the train trip. 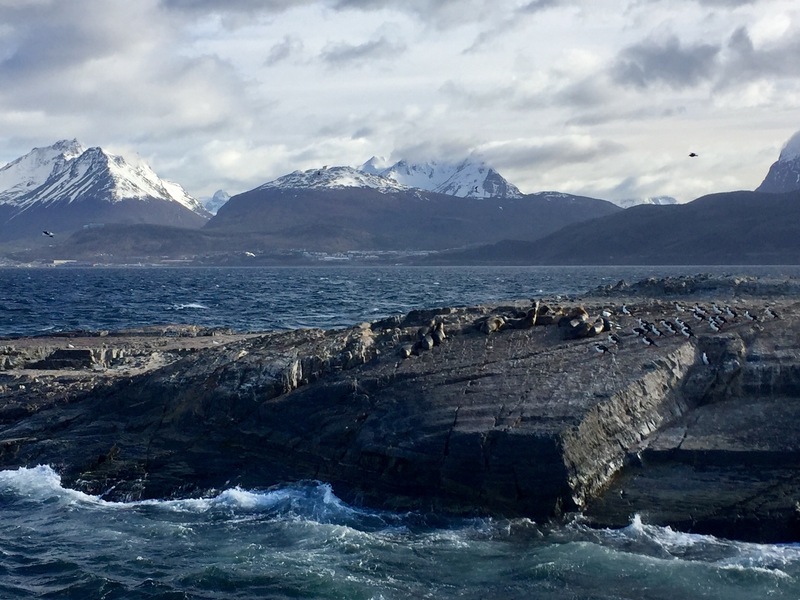 In the start of the 1900s, the Argentinean government set up a penal colony in Ushuaia that was built by the prisoners themselves. It was modelled on other successful colonies such as the UK had started in Australia. 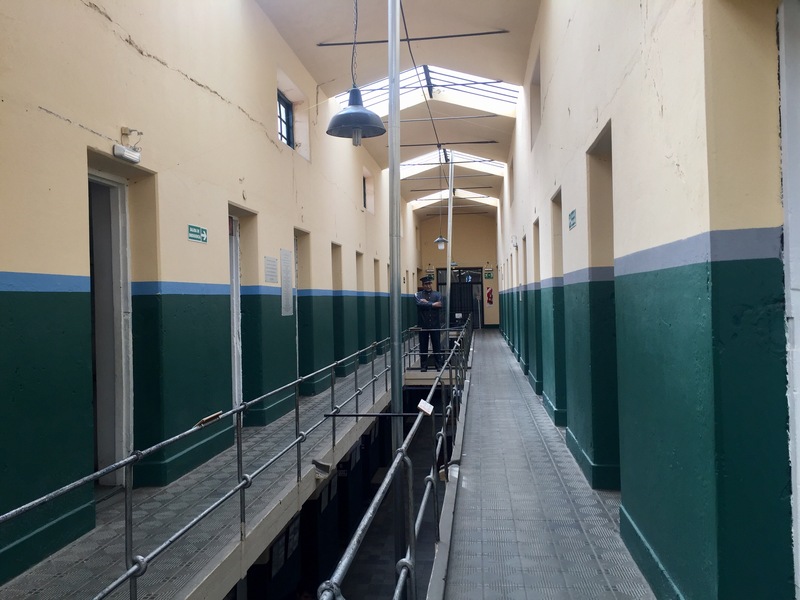 I’ve never been inside a prison before and it was really interesting and eerie to visit. The building itself is amazing with five pillars of cells that convene on a circular space used for gatherings. 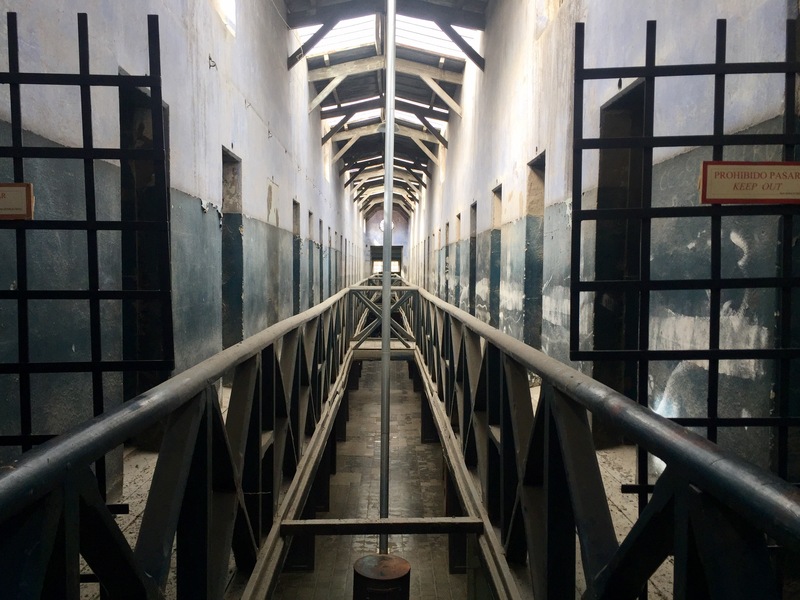 One pillar has been repainted and holds the exhibition about the prison and other is left completely as the prisoners would have experienced it. In the first I didn’t think the place would be too bad to stay, in the latter I quickly changed my opinion. It was freezing and bleak and depressing. The hard manual labour in the forest cutting down firewood for the prison, reached by the train, seemed like a nice escape from this confined existence. In the afternoon I also visited the small Fin del Mundo Museo which didn’t have much worth seeing expect a large stuffed bird exhibition which was very interesting. I also went to Historia Fueguina (a thematic gallery that’s a bit like Madame Tussaud’s). It was a really interactive way to learn about the history of the southern tip of South America and the cultures that existed before today. 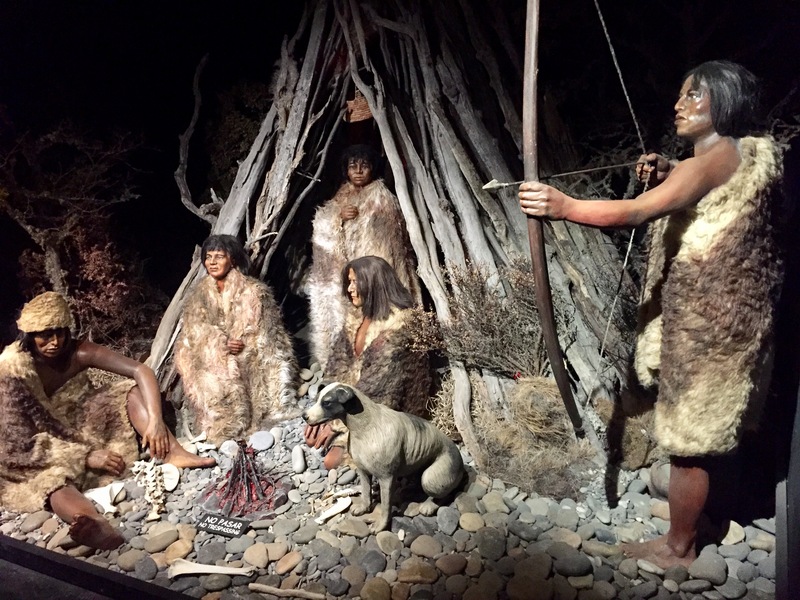 I would definitely recommend visiting it for the story of the native cultures and the exploration of the 19th century that brought Charles Darwin to the continent and helped to establish his Origin of Species. And that’s it, before I knew it my time in Patagonia was over. I had amazing time with all types of weather and landscapes. I wasn’t sad to return to metropolitan civilisation as I really am a city-girl but I will look back on the adventures all the time and hopefully return in the future! Torres del Paine is undoubtedly the most famous national park for hiking in Patagonia and probably the whole of South America. Don’t feel embarrassed if you’ve never heard of it, I hadn’t before I started researching for this trip. What I didn’t know is that Torres del Paine is probably one of the most expensive national parks in South America, if not the most expensive. It’s not just the entry fees and transport, but you also have to decide between camping or staying in refugios (kind of like mountain lodges with dorm rooms). Food is expensive too unless you’re willing to carry five days worth of meals on your back for the whole trip. With all these different things to think about as well as route variations – you can go east-west or west-east and you can spend four or five days hiking – there’s a lot of preparation and planning that needs to go into doing this trek, even at the very start of the season in October. 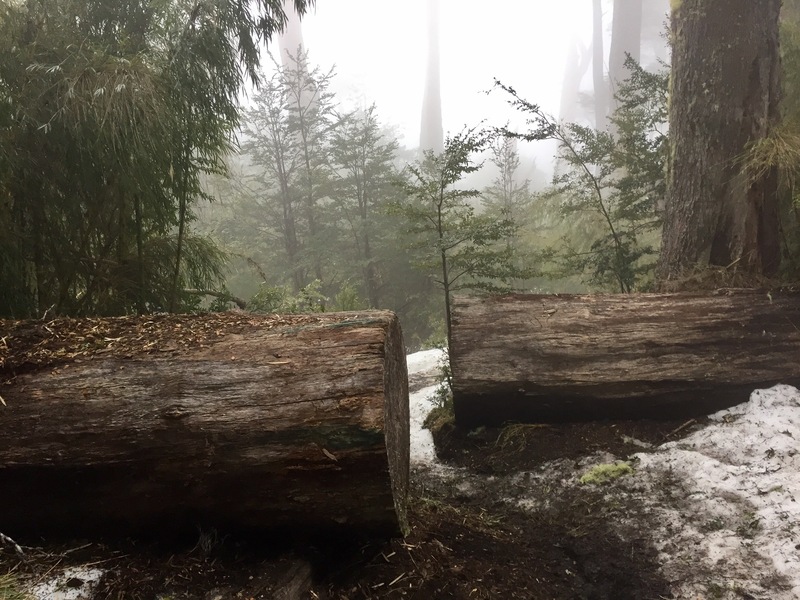 I’m going share my experience of the ‘W’ from preparation to advice, including my favourite parts of the hike and some adventures along the way. As a spoiler now I’ll let you know it didn’t all go to plan but I did manage the whole route without getting lost once. 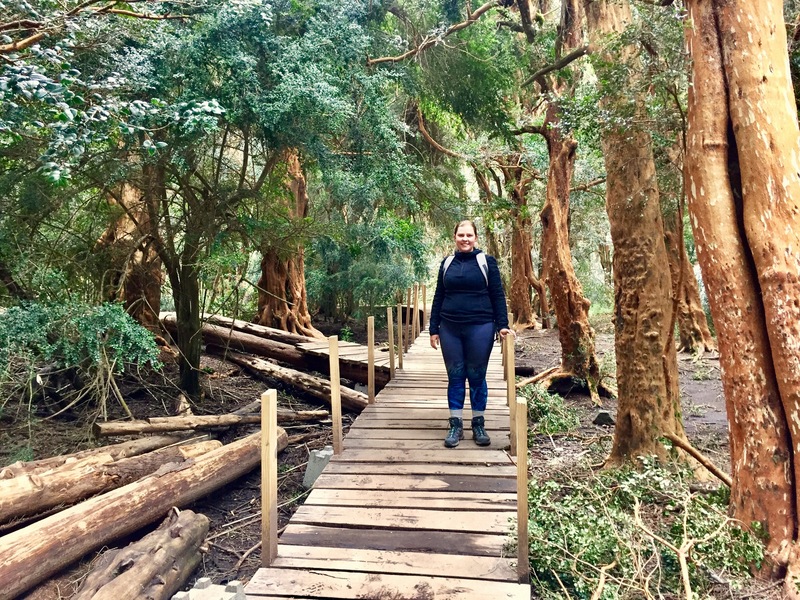 However this blog could not be more aptly named for this post as throughout the five days hiking I lost more things than I think I have lost in my whole trip! Do book your refugios or camping spots more than two weeks in advance. I only started booking 10 days in advance and this caused me a few issues. The companies that own all the accommodation, Vertice and Fantastico Sur, can be very slow to respond to emails so it’s best to give them as much time as possible. Don’t pay extra at the refugios for bedding (or other equipment unless you only need it for one night). You can rent a sleeping bag in Puerto Natales, the closest town to the park, for $3,000 pesos a day (£3.60). 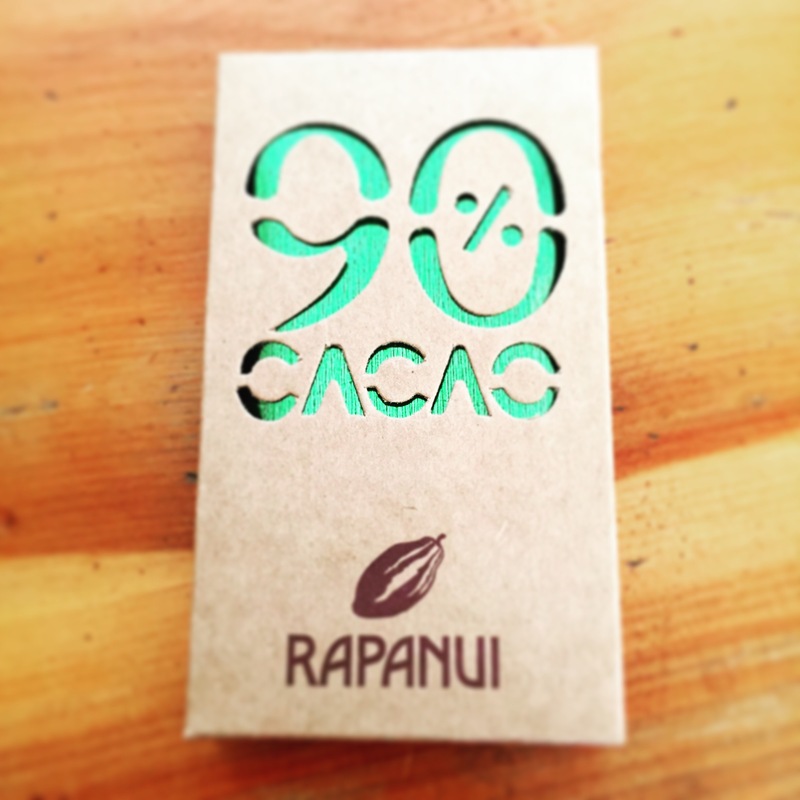 It might add weight to your bag but it saves a fair amount of money. The same goes for tents, hiking poles and any other equipment you might need. Do the route in four days instead of five. Most guides will tell you that the route takes five days and should go left to right. But unless you are extremely unfit, have a serious injury or have time to waste, then it wont take you five days. Save yourself one night of accommodation and do it in four. The park map has estimates for the time it takes to do the route so this can help with planning your stops. Don’t pack more things than you need. Before you reach the park you should know if you are eating in the refugios or bringing your own food. The same goes for clothes, you’ll know how many days of hiking clothes you need. Any thing extra in your bag just adds weight to your pack and more weight means less fun. It also means more things to lose. Also, keep any miscellaneous items in bags within your pack as it’s easy to drop things along the way without noticing (headphones, padlocks etc…). Do bring your passport. The refugios and campsites will ask to see and take a photocopy of your passport and travel card for tax purposes so make sure you bring it with you. Put it in a safe part of your pack, inside a zip-lock bag if you have one. Also you can get a free passport stamp at the ranger office when you pay your park entry fees and as there’s not much for free here, take it when you can. Don’t arrive in Puerto Natales on the weekend. This small town is ghostly most of the time but especially during the weekends. If you arrive during the week you can visit the offices for Vertice and Fantastico Sur to complete your accommodation bookings or ask any questions in person. The supermarket also gets very empty on a Sunday so the selection of snacks is very low. Do go to the Erratic Rock briefing in town before the hike. A hostel and hiking rental shop called Erratic Rock in Puerto Natales give free briefings daily at 3pm in their hostel. These guys are experts and they gave me loads of great advice. They’ll answer all your questions. So highly recommend this! Don’t lose your bus ticket before you’ve even left the town. This is just one for me probably but if you’re buying a bus ticket to Torres del Paine in advance from your hostel (recommended) then don’t lose it. Or panic and think you’ve lost it, run all the way back to hostel when it was in your bag all along. Put it in a safe place that you’ll remember (not inside your passport). Do make friends with the people on your route. On your first night, find out who is going in the same direction through the park as you and which campsites or refugios they are staying at. You’ll see them everyday for the next four or five so it’s much nicer if you get to know them. Don’t forget to pack a day bag. 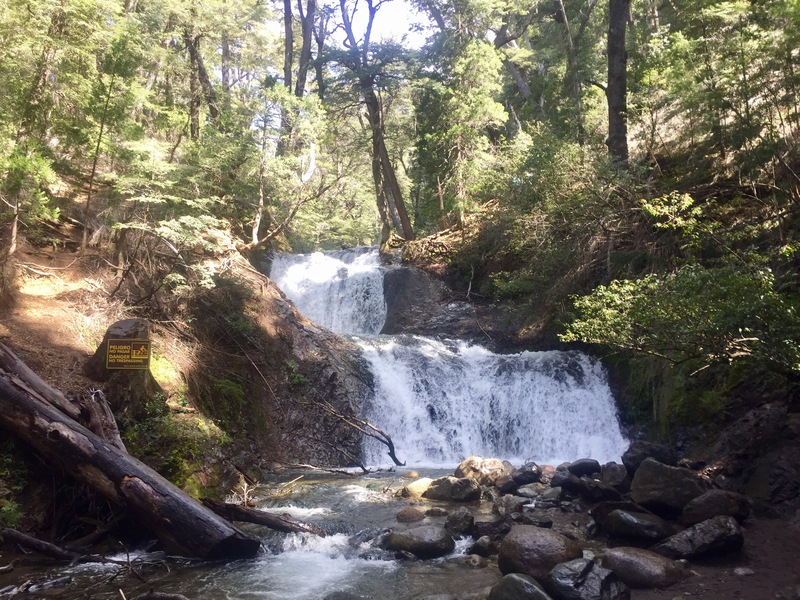 There will be at least three times when you can drop off your big bag at a refugio or ranger lodge and hike with a smaller pack for the day. I forgot to pack a smaller bag so I had to carry my packed lunch in a plastic bag. Hiking hands free is much easier and I was already carrying a huge water bottle around with me. One lady even asked me if I was hiking because I seemed so relaxed with my equipment (none of the gear but some idea). Don’t go crazy and eat a whole box of powdered potatoes if your reservations don’t work out. 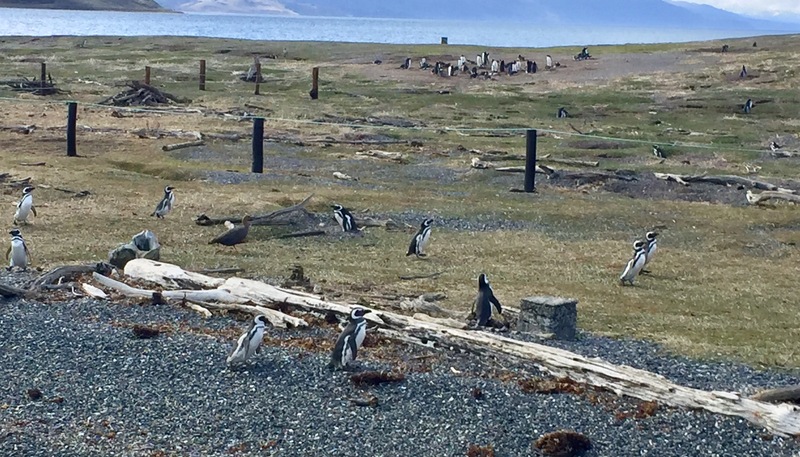 Because I arrived in Puerto Natales on a Sunday and didn’t managed to finalise my booking with Vertice – their refugios weren’t aware of my reservations. This meant on my second night of accommodation, where I had intended to have dinner, there wasn’t enough food for me. So instead of acting rationally, I bought a box of powered potatoes with a packet of cheese and salami from the mini market and ate the whole box as their only ‘hot’ option. Do set off early on your Frances Valley day. Depending on what route your doing this could be your second or third day, but whatever direction, it will be a long day. For most people the views of the Frances valley and from the Britanico viewpoint (in the middle of the W-shape) are the best. If you set off early then you’ll have plenty of time to enjoy the views and rather than rushing to make it to you next camp before sunset. Don’t miss any opportunity to climb up to the Torres base. I know that regrets are futile when you’re travelling but I regret not going up to the Torres base twice. It’s meant to be the hardest part of the whole route to hike but it’s also the hardest part to see clearly as it’s notorious for changeable weather. If you have time, go up twice to see the Torres because you never know when it will be clear enough to see the mountain tops. We rested when we arrived to the camp, ready to go up the next morning but in the morning there was a snow storm and we couldn’t see much more than an outline. Annoyingly it completely cleared up in the afternoon as we were leaving the park. Do wear hiking boots. This sounds like obvious advice but I did actually see two people hiking up to the Torres in the snow with slipper-style pumps on. Just crazy. Don’t fall into the mud. At some points the route is very muddy and boggy, especially if you take the Chilenos shortcut. I managed to get a little stuck in middle of a bog and while jumping with my big bag, fell flat into the mud. Thankfully I had my coat and water-cover on my bag otherwise I would have been very wet and muddy. Also don’t try to dry your muddy alpaca gloves by the fire and burn them so that you have to throw them away. Do make time to really enjoy in the views and take as many pictures as possible. While you’re hiking to a schedule and you want to have enough time to get to all the sights each day, make sure you leave time to just sit and enjoy the views. There’s no point paying all that money to rush around the park and not enjoy the amazing landscape. Even if you don’t need the break physically, you’ll appreciate the time just to relax and stop as often as you like to take as many pictures as you want. 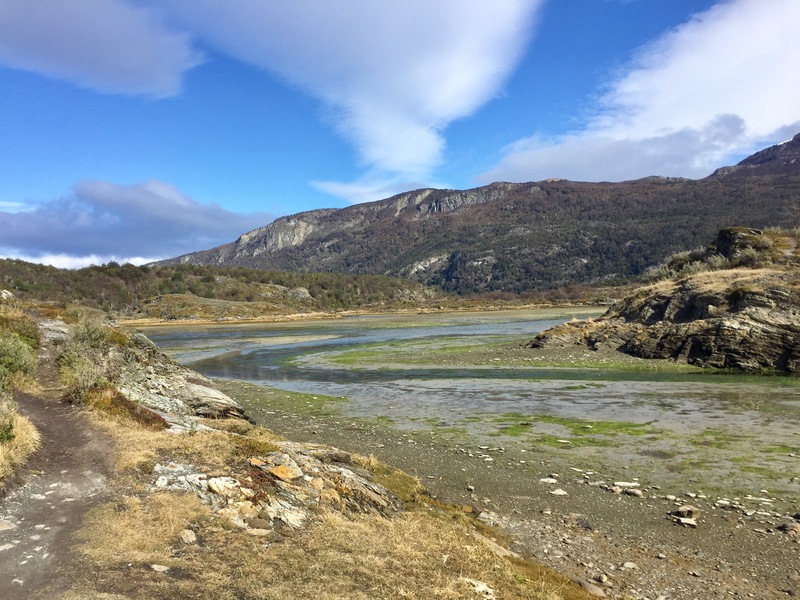 Geographically central between the Lake District and Ushuaia, El Calafate is a very popular stop for travellers and has always been part of my itinerary from the beginning of my planning back in 2016. 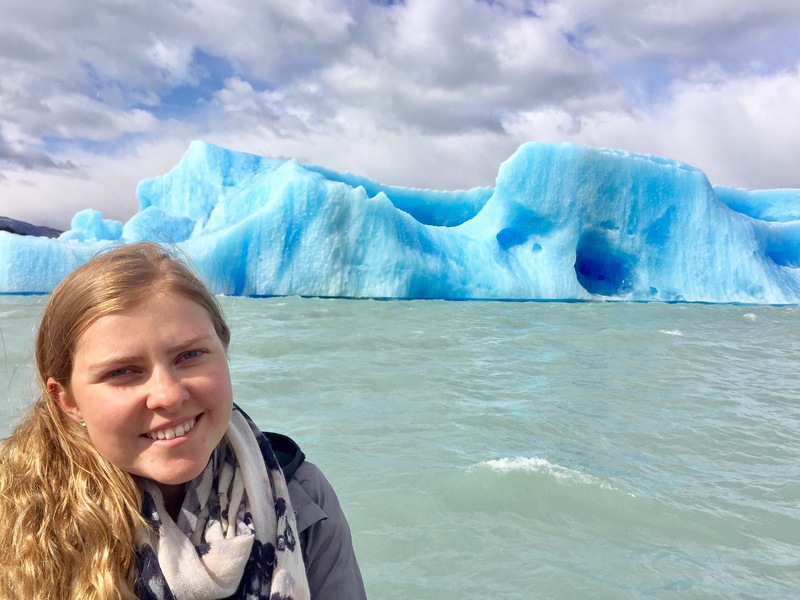 When I first saw a picture of the Perito Moreno glacier in my LP bible (Lonely Planet guidebook) I knew I had to make time in my trip to see it. 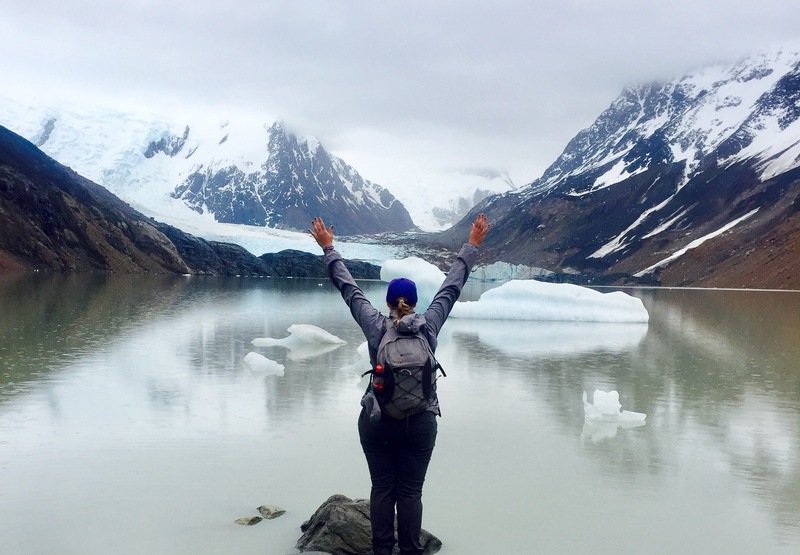 If I’m honest I didn’t even know it was in Patagonia at the start, it’s famous in it’s own right and travellers come from around the world just to see it, but combined with the nearby town of El Chalten, it’s actually the frozen heart of Patagonia. 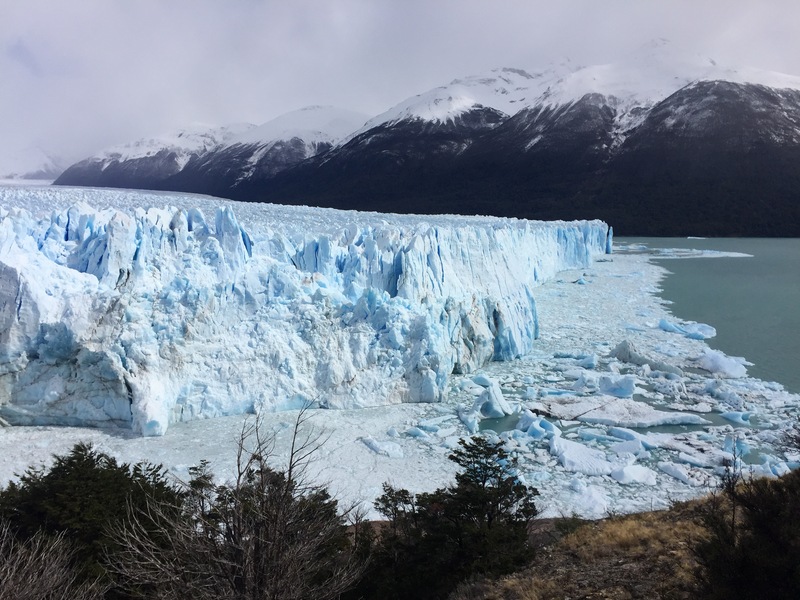 The famous Perito Moreno glacier sits within Parque National Los Glaciares – a large area of glaciers, mountains and woodlands. In total there are 47 glaciers and it’s the biggest area of ice outside of Antarctica – that’s pretty impressive. The only downside about these amazing glaciers is they are very expensive to visit. Even just an unguided bus journey there and back costs £19.40 plus a park fee of £21.55. 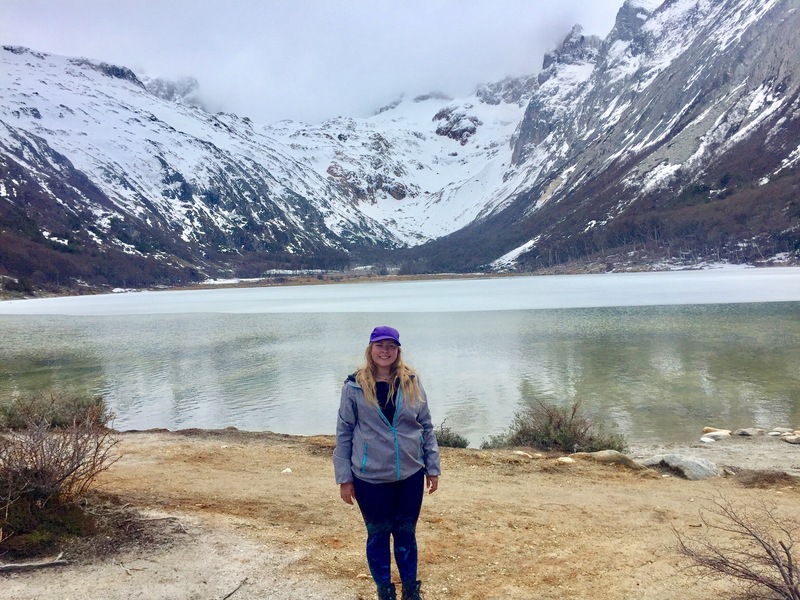 There are all kinds of activities you can do like trekking on the glacier and kayaking in the icy lake but seeing as my budget wasn’t able to stretch that far, I went with the regular bus. 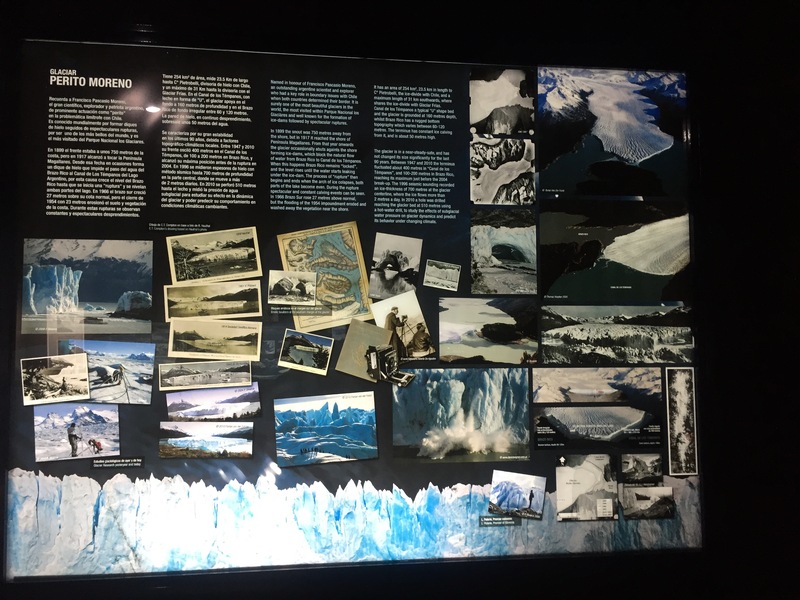 You also get the longest amount time to see the glacier if you choose the bus option and after some pretty crappy guides so far on this trip, I decided a quick visit to the Glaciarium (glacier museum) the day before would give me all the information I would need. 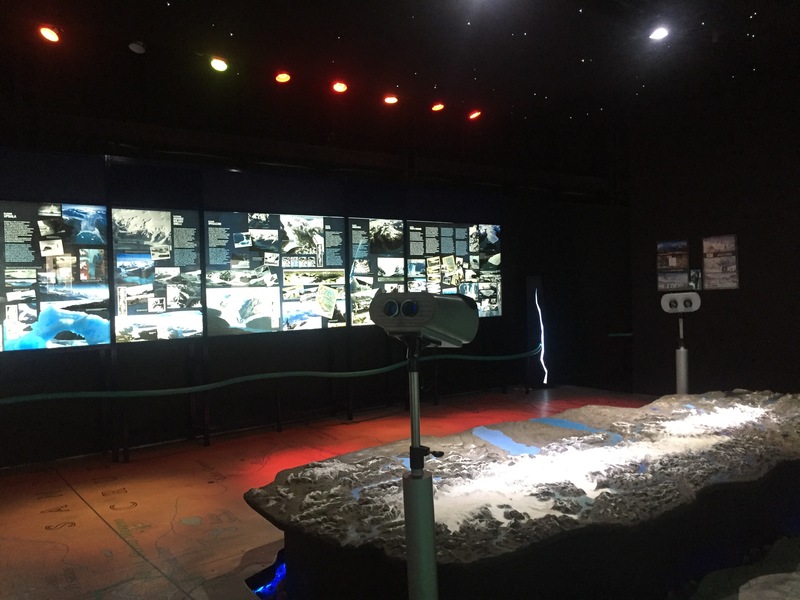 It even had a cool 3D cinema where you get to see real footage of lots of different glaciers in the national park as well as learning how they’re formed. 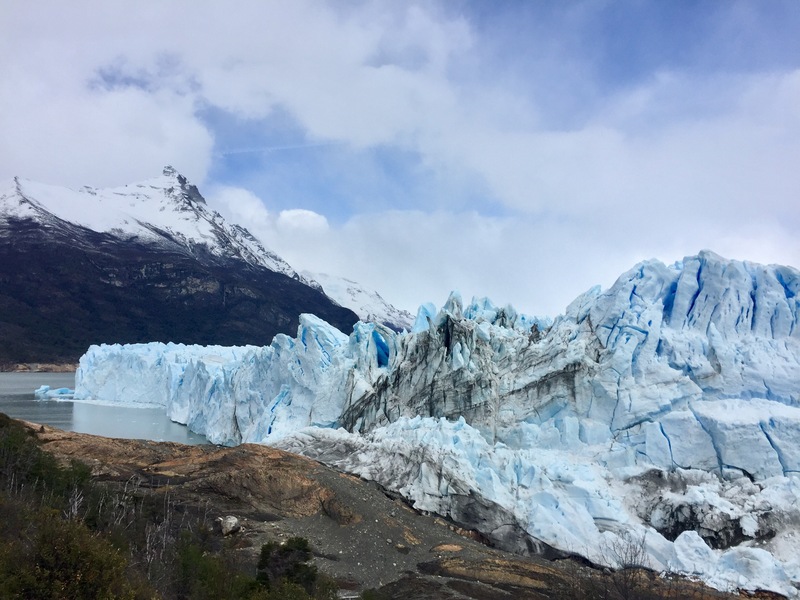 Perito Moreno is the most famous glacier in the national park and one of the few glaciers in the world that isn’t shirking due to climate change (it has a cyclical movement instead). The museum has a great time-lapse video of the glacier breaking off and reforming through winter to summer that explains this really well. This movement cycle has allowed a great network of viewing platforms to be built around the glacier’s peninsula, so that you can take in it’s colossal size and shape from all angles year in, year out. I had five hours to wander around these platforms and take nearly 200 pictures of the impressive blue-looking glacier and it didn’t disappoint. It is just as spectacular in real life as it is in the pictures and even without blue skies it’s still stunning. I even managed to see a few chunks of ice break off – you can hear them crack and crash into the lake from most parts of the platform area. It’s a bit a strange to think I spent five hours watching a big ice sheet but unless you see it for yourself, you won’t understand its magnificence. 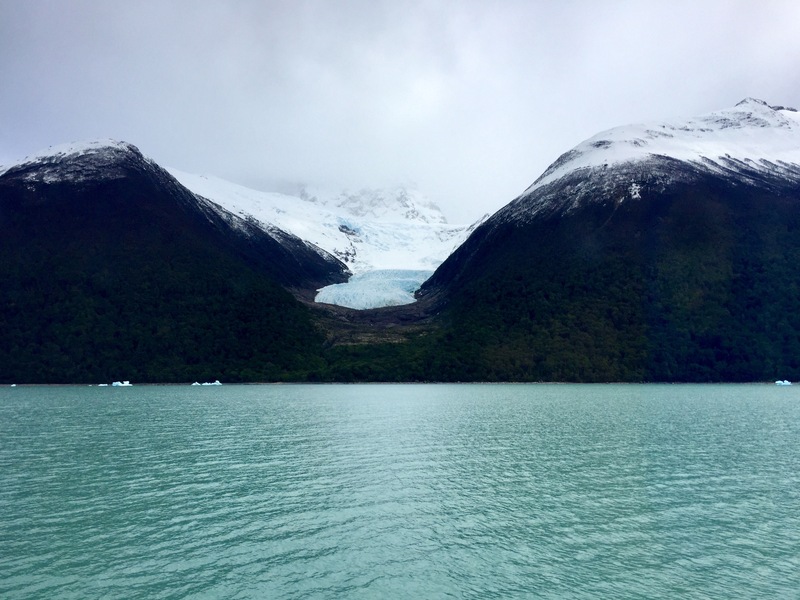 Although I couldn’t afford to do the ice trekking, I could just about afford the boat trip Rios de Hielos (rivers of ice) where you get to see two other glaciers only accessible by boat (£86.22 + £21.55 park fees). It’s still pricey but there’s not much point in flying to El Calafate, paying to stay in hostels and not see what you’ve come to see. 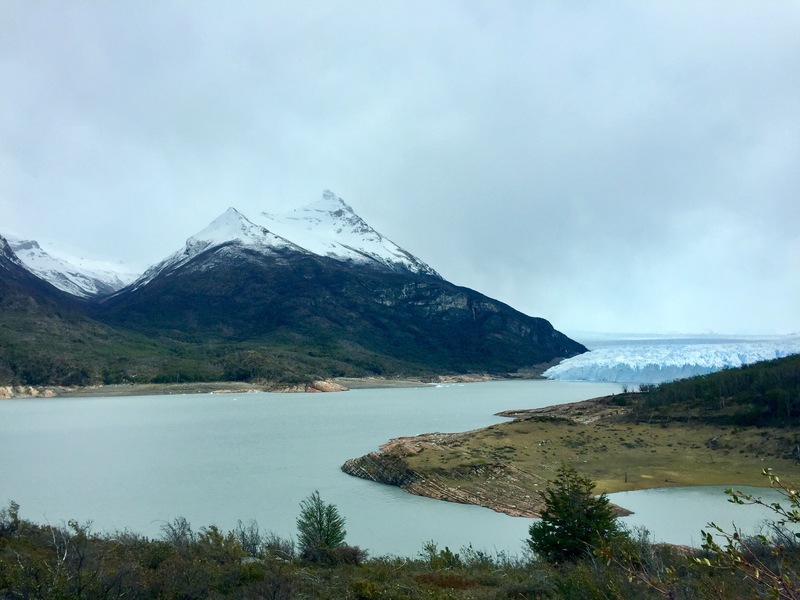 I booked the boat trip through my hostel (America del Sur – hugely recommend them) and although no one else had signed but for this trip, I was excited to see something a bit extra to the Perito Moreno glacier. 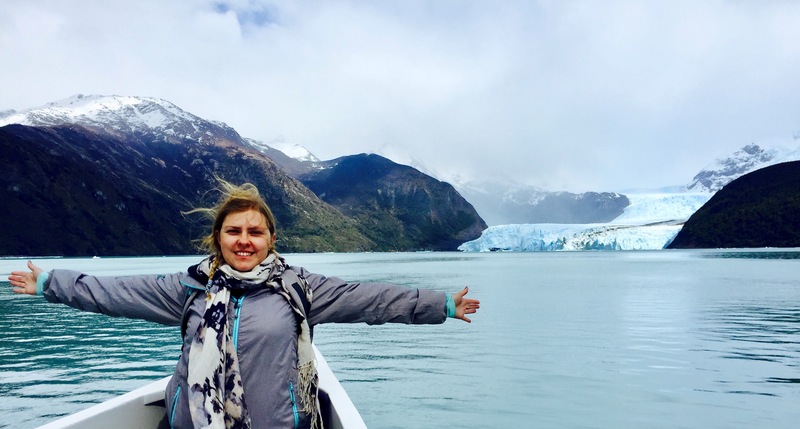 The trip includes a five hour boat ride through the Lago Argentina (Argentina’s largest lake) up to the Upsala and Spegazzini glaciers. The Upsala glacier is a very large glacier that frequently breaks off so you can’t get very close to its face. It does have the advantage of producing lots of icebergs which float towards the lake. Our boat stopped by one huge iceberg (remember you only see about 10% of its surface area above the water) which looked so blue. It was quite an amusing tussle to get past other tourists to take pictures but anyone who is used to commuting in London can handle it. With the glaciers and snowcapped mountains reflecting the light from all angles, it can be quite hard to get good quality pictures but with just an iPhone 6, I did the best I could and almost dropped the phone into the water multiple times. Next the boat goes to see the Spegazzini glacier (named after an Italian botanist, I think) which it’s safe to get very close to. The boat was so close it was actually a bit nerve-wracking but it was amazing to see the glacier’s pathway from the top of the mountain range curve down the mountainside to join the river. At this point it started to rain or snow but I tried my best to get to decent pictures. In the end I settled on a video panorama as the best way to really capture its immense size. The boat trip was worth the high cost to see these amazing glaciers which are otherwise inaccessible. It was definitely worth the hostel-cooked pasta diet I’ve been on for the last two weeks to afford it. Near to El Calafate is a small town called El Chalten in the northern sector of Parque National Los Glaciares. It has loads of great hiking trails and thankfully you don’t have to pay the expensive park fees to hike there. It’s also home to the world-famous Mount Fitz Roy which stars on the American Patagonia clothing company’s logo. 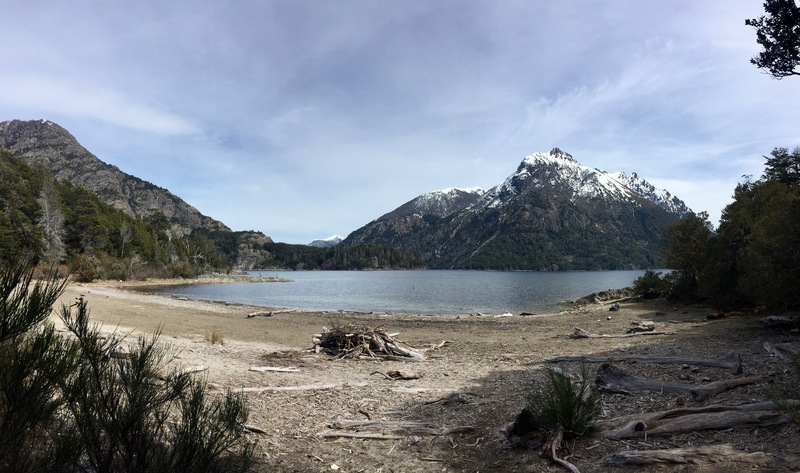 I only had two days set side for El Chalten so I knew I would have to make the most of my time there. 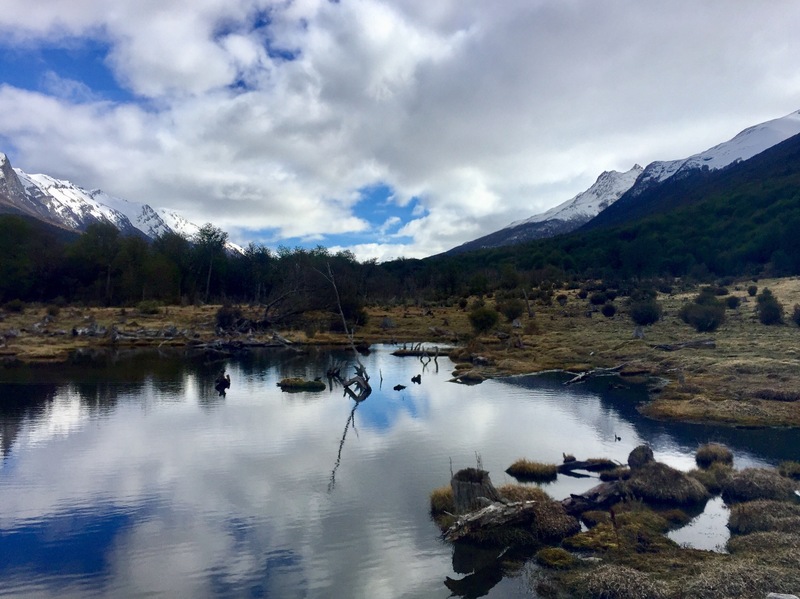 I had already researched the routes and planned out which hikes I wanted to do – I decided on Laguna de los Tres to the base of Mount Fitz Roy and Laguna Torre to base of the Torre mountains. The first is the most popular and supposedly the most challenging so I planned to tackle this on my first day, leaving the slightly less challenging for second when I would be a bit more tired and stiff. It turned out the weather was much better on my first day so I’m really glad I did do the routes this way around. I set off early on the first day, reaching the start of the trail around 8:20am and having already joined forces with a couple from the hostel. They were a really nice American couple who had already been to my next stops in Patagonia so we spent a lot of time talking about those destinations. We chatted most of the way and before we knew it we’d reached 9km out of 10km without much difficulty. But this is where it started to get steeper and snowy. Except some of the snow was melting so it was quite slippy. I tried to find climbing routes through the rocks instead of the snow but this did make me quite tired. It was another hour before we reached the top but it was so worth all the hard work. 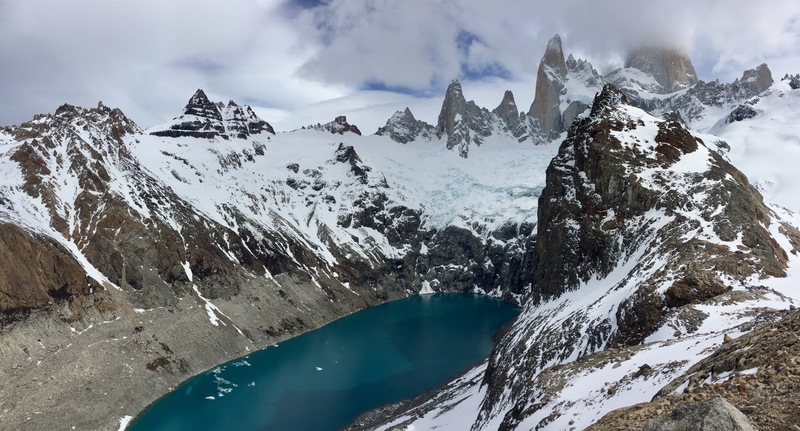 The views were amazing, even with misty clouds hugging to the peak of Fitz Roy. In front of us was a big white bowl of snow which we later decided must be one of the lakes. We enjoyed our packed lunches and rested for a bit after four hours of walking without any real breaks. At this point a few other travellers reached the top, including one Brit who said there was another lagoon just the otherwise of a rocky mound in front of us. We had decided we’d skip this lagoon and started back down the way we’d come before changing our minds. I cannot describe how glad I am we did change our minds. The lagoon was so picturesque – a clear, turquoise pool that stood out beautifully against the white and brown surroundings. It just enhanced the beauty of mountains and it’s certainly a gem that shouldn’t be missed if you walk all that way. On the way down three more people joined our group and so we were quite a chatty hiking party on the way back, despite tired legs. It was really nice to walk with company instead of on my own and I really enjoyed the 20km without thinking about the distance for most of the day. The next day the weather really wasn’t as good and although I felt really tired, I still went out to hike to the Laguna Torre. I’d seen some pictures of the lagoon before but they were clearly on a sunny day in the middle of summer because when I did reach it, it couldn’t have looked more different. I met two German girls I knew after the first 2km and joined their group for the rest of the way. 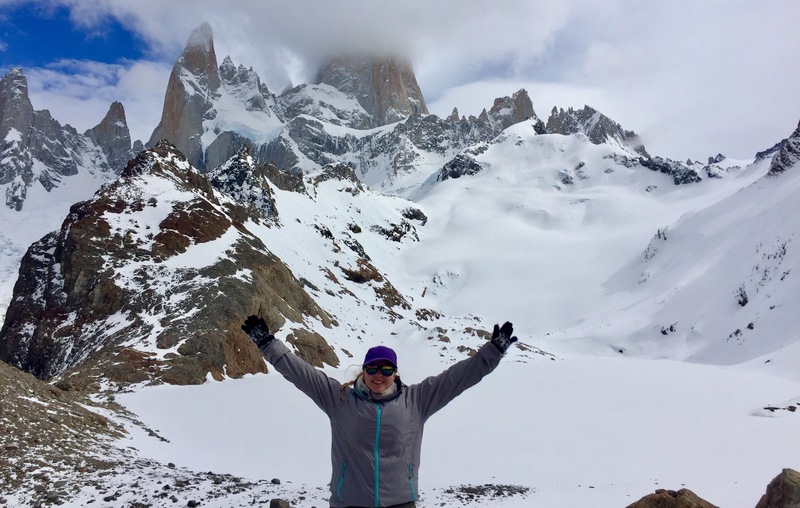 We were quite upbeat but it was hard to shake my disappointment about the weather – I was definitely grateful I’d had a sunny day previously to see Fitz Roy. On the way to the lagoon there is a tree graveyard of burnt trees from a recent fire that devastated parts of the woodland – caused by a careless trekker who didn’t put out a cigarette properly. It was eerie and sad to walk through and the thought that someone could be so thoughtless only makes my personal hate of smoking stronger. 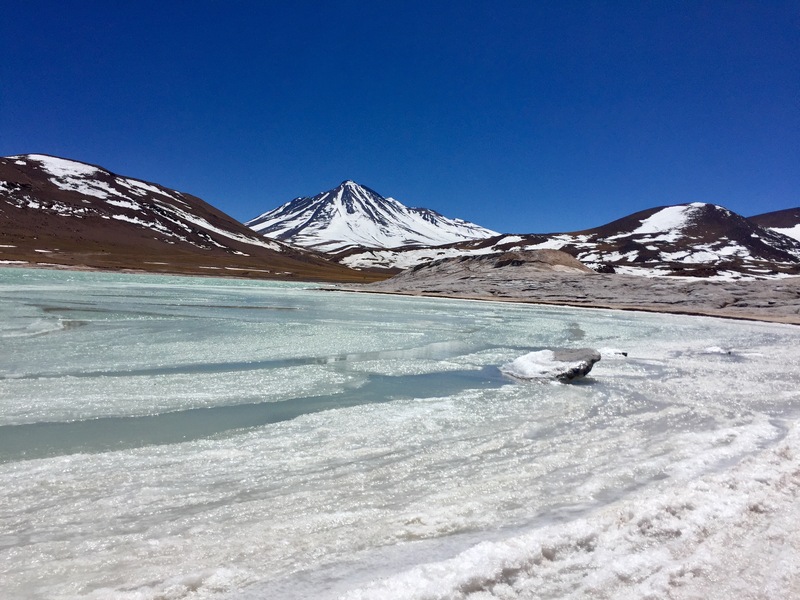 The lagoon itself has a glacier feeding into it and when we reached it there were large chunks of ice floating in it. The water was dark and murky, and clouds covered the Cerro Torres which was supposed to be the main attraction of the hike. Despondent, our lunch was eaten in the rain and after taking all our pictures we quickly walked back to town. The 18km were definitely felt more keenly on the second day and I was very glad to reach the hostel at the end. One good day out of two is pretty good weather-wise so I’m happy. El Chalten is a great warm-up for Torres del Paine, my next stop on my trip and Patagonia’s most famous (and expensive) hiking area. This is the start of my Patagonia hiking adventure. Until this point I’ve felt like an authentic backpacker travelling around South America: getting an impression of the local culture, tasting the traditional food and learning about the history of each country. For the next month in Patagonia I feel like my trip will be more of a hiking adventure than a cultural one. Patagonia is very highly influenced by European settlers and in the ‘Lake District’ (where I am now) I feel like I’m staying in alpine resort – they cost almost as much too. To continue a logical path for my trip, I’m travelling through Patagonia from north to south, exploring both the Chilean and Argentinean sides. Three weeks isn’t a ton of time to spend here and thankfully I’ve managed to find some competitively priced flights as days can be lost here catching buses between destinations. Still, I’ll be missing out a lot of really nice places to visit and go hiking. The best way to see Patagonia, I think, is to hire a car. It’s not cheap but you have the freedom to see a lot more of the area than you do if you are constricted to public transport. Hopefully at some point in the future I’ll be able to come back to do just that. But for now, I’ll just be doing a highlights of Patagonia or you could call it a best bits trip. 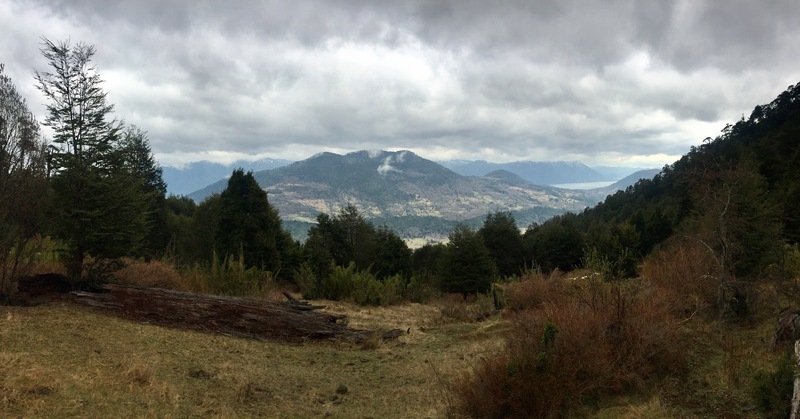 Pucón was the first stop on my Patagonia adventure and, despite the difficulty of getting a bus ticket there before the Chilean Independence Day holiday, it was worth the wait. 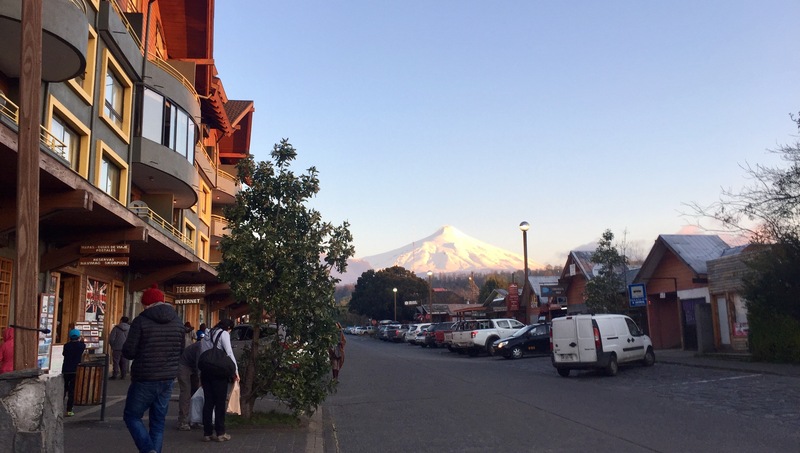 It’s a small to medium sized mountain town in the north of the Lake District which sits by the Villarrica lake and the spectacular snowcapped Villarrica volcano. The Lake District area in Patagonia is nothing like the Lake District of Cumbria in England. The rugged mountainous and volcanic countryside covered with a blanket of snow is so peaceful and natural; it looks like it aught to be taken from a remote ski holiday catalogue. People do come to ski and snowboard in Patagonia but much of the quality snow is back country skiing and a very difficult level. One of the main attractions for adventure-seekers in Pucón is climbing the Villarrica volcano. But once again penalised by the national holiday, the hike wasn’t taking place during the two days while I was in town (just my luck). This was mostly a safety precaution to ensure drunk guides weren’t taking people up an active and potentially dangerous volcano but it was disappointing all the same. On my first day, after a 12 hour night bus, I decided I would take the day to relax in the luxury hot springs situated an hour from the town. I know I’ve been to a lot of different hot springs on this trip but I’d been assured by the hostel staff that these were really worth it and I was keen to do something with the half day. The Termas Geometricas are the nicest hot springs I have ever seen or could even imagine. The trip costed £37 (entry and transport included) and although this is a hefty price tag, especially for a backpacker budget, I am so glad it did it. 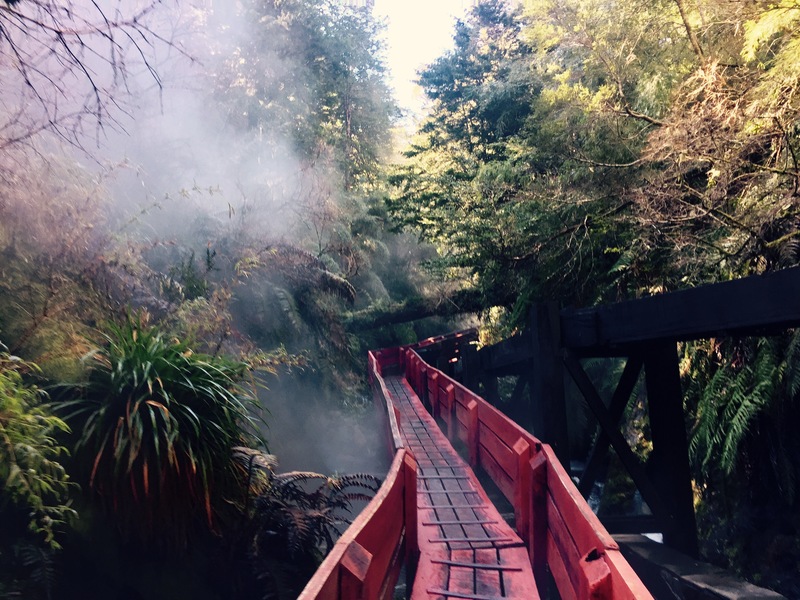 The beautiful setting of the hot springs is a mountain crevice surrounded by a misty forest with lot of different waterfalls. There are 20 man-made steaming pools heated between 35 and 43 degrees centigrade, lined with slate tiles and cute little changing huts. There is also a cosy, modern lodge with an open fire and restaurant where I got a quick cheese and ham toastie. We had three hours to relax here and I made the most of this time by trying out five of the pools. I had planned to try out more but I got talking with a girl from the hostel and so ended up just relaxing. 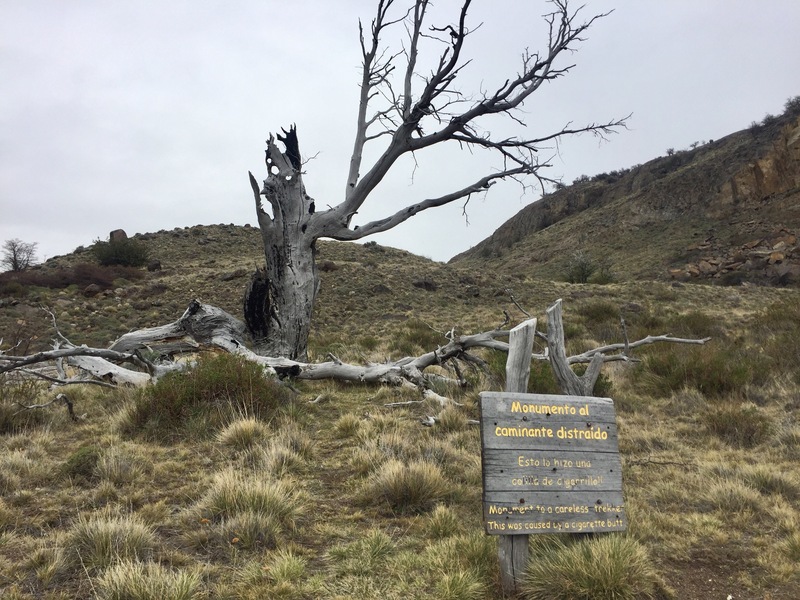 After a lot of discussion with other travellers at the hostel the night before, I set off the next day to visit El Cañi Reserve and hike the trail. This would be my first solo hiking adventure and I was quite nervous of getting lost or being attacked by a puma. The park ranger at the entrance gave me a map and explained the route. Unfortunately it would be too cloudy to go up to the mirador (viewpoint) but I could go the rest of the way. It’s meant to be a three to four hike to the top and it was certainly a steep walk for the first two hours. I was going slow and steady but listening to a travel podcast the whole way up (The World Wanderers – highly recommended) made time pass without me noticing. The views were good on the way up but I had a feeling without the clouds they would have been much more impressive. After about two and a half hours I reached the snow and from this point on it was hard to tell where I was going or where I had come from. 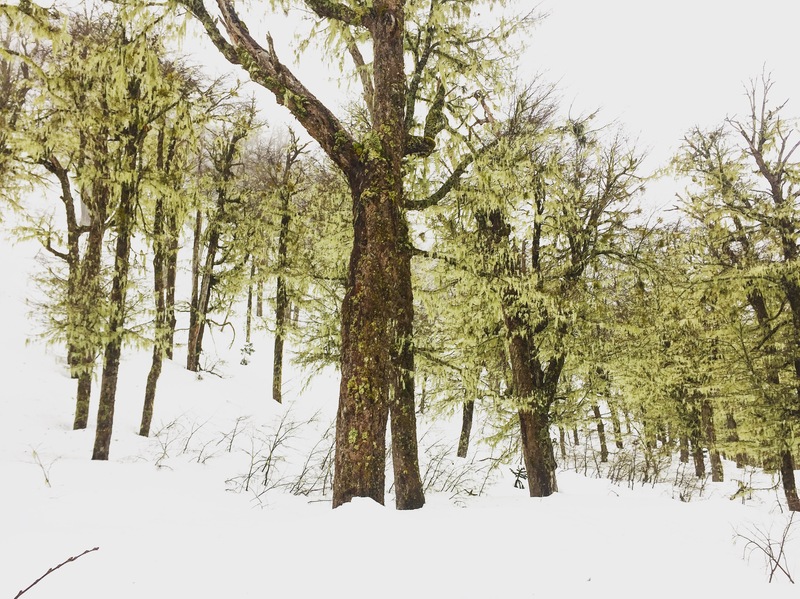 The white has a magical way of making everything else disappear; each of the trees looked so similar and I wasn’t even sure if I was walking uphill or down anymore. At three hours I saw my first other hiker, a 60-something American I later found out was called Kevin. He was on his way back from the furtherest point and told me there wasn’t far to go. It was kind of nice to know I wasn’t entirely alone – just in case I did get lost. 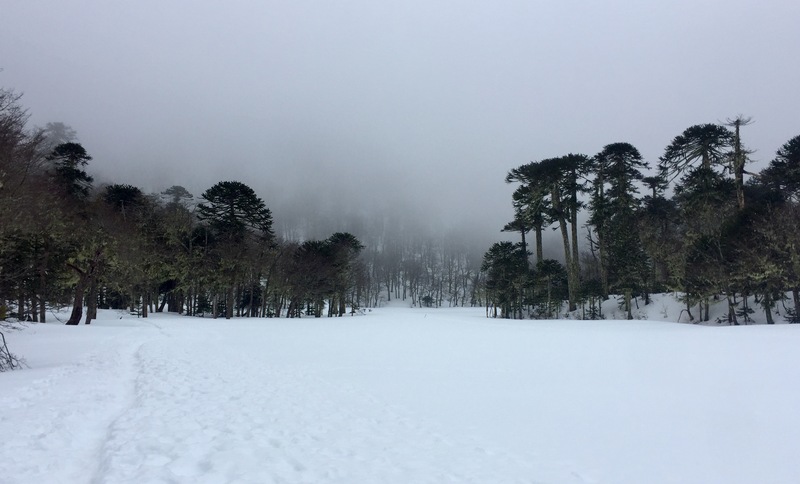 I continued to follow the path to the frozen lake and up to the bottom of the mirador where the footprints ended. By this point fog was setting in and I decided it wasn’t worth hanging about. I quickly ate the empanada I had brought in my backpack for lunch and started the return journey. Not paying close attention to where I was walking, I managed to stumble onto a side trail at one point. It wasn’t until my boot fell through the snow leaving me with one leg buried to the hip and the other bent crouching above the snow that I realised I had gone the wrong way. Luckily this has happened a couple of times snowing before so I wasn’t scared, I just knew it would be wise to climb out of the whole as soon as possible. Back on the main trail, I started to speed up my decent as it was starting to rain and I didn’t want to get stuck at the top of the mountain if the weather turned. Once I lost the snow, I started jogging my way down through the mud, now very damp and slippy. I caught up with Kevin and walked the rest of the way back with him. We were even lucky enough to catch a return bus after only 10 minutes of waiting. In total it took me six hours: four up and two down, so I was quite happy with that. 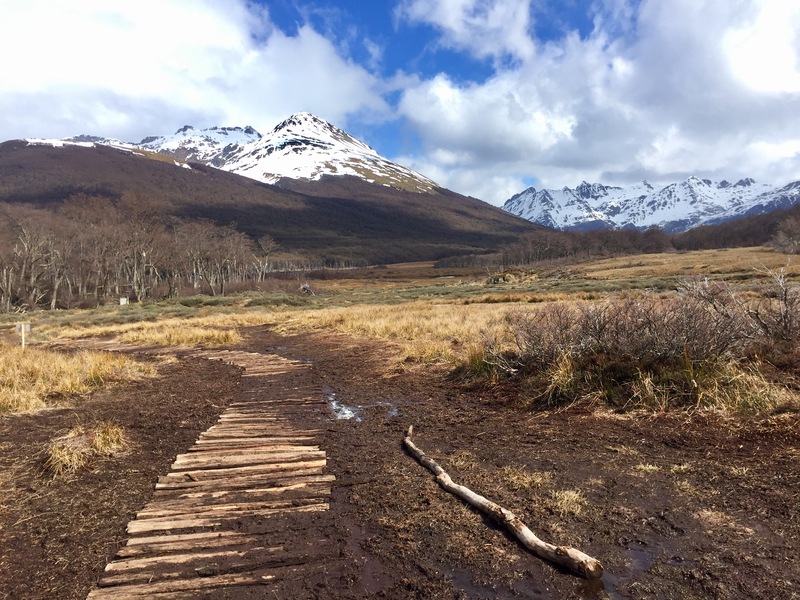 The walk was challenging and peaceful – a great introduction to Patagonia. 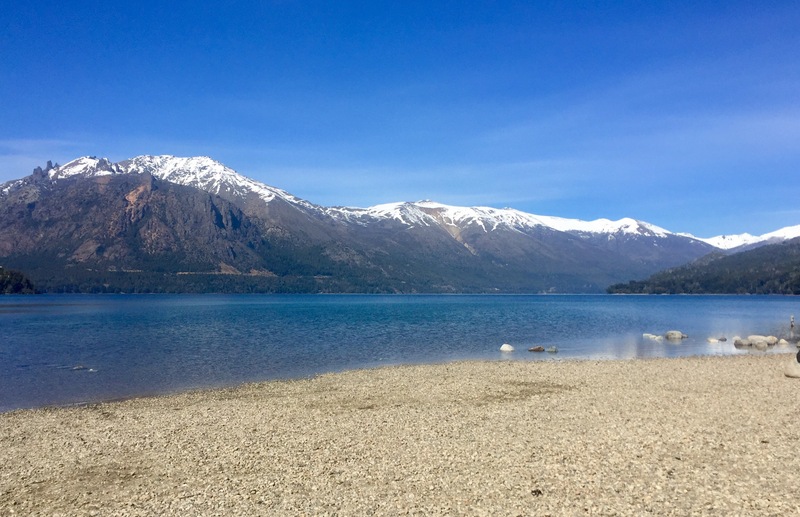 My next day was spent catching two buses across to San Carlos de Bariloche in the Argentinean Lake District. 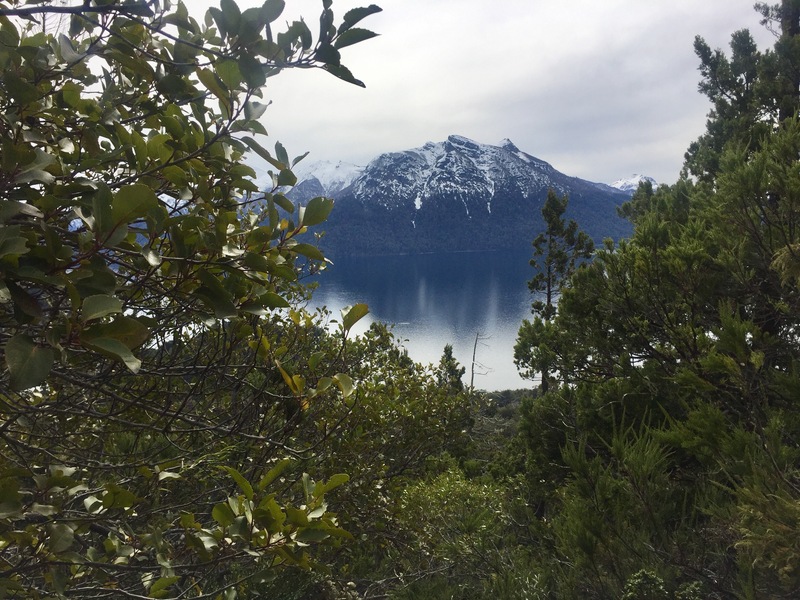 Bariloche is a well-known stop on the Patagonia traveller route and a great starting place to hike from. It’s a medium sized city and loses some of the alpine charm in its bustling centre but I stayed in a wooden lodge-style hostel (41 Below) so it still felt outdoorsy and relaxing. In fact without realising it I had selected a vegan hostel. I don’t particularly believe in the idea of being a vegan but it was nice to stay somewhere that was at least trying to be eco-friendly and the other travellers were really friendly. On my first day I joined a group from the hostel doing a short walk to some waterfalls nearby. This gave me a chance to experience the local buses system that uses contactless ‘sube’ cards which are very similar to Oyster cards in London. The walk wasn’t challenging but it was nice to chat to some new people and enjoy the countryside. 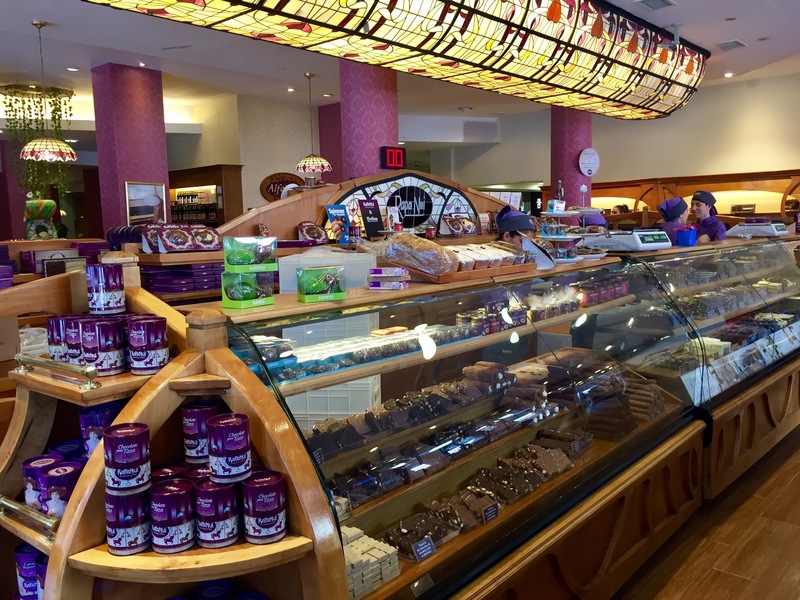 I spent the next day trying out the famous Bariloche chocolate in Rupa Nui, a chocolate shop version of Harrods. 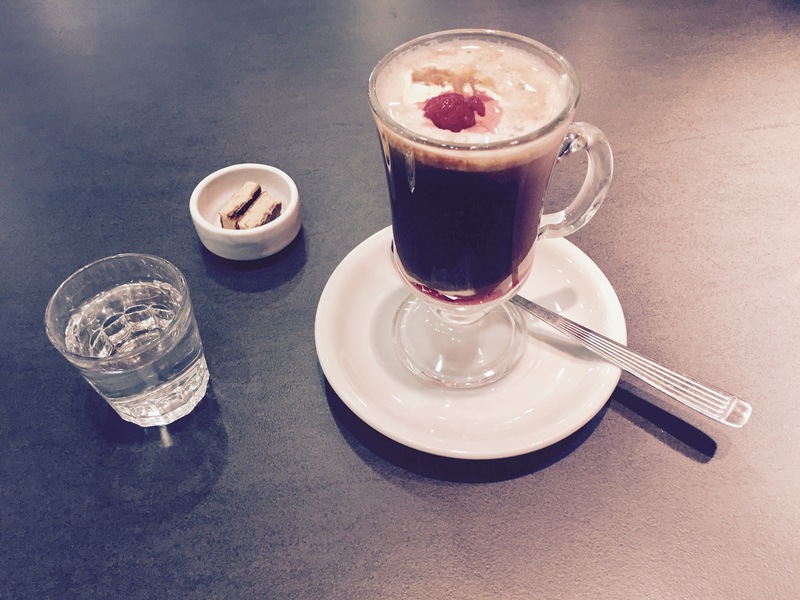 It had a very nice cafe which served delicious raspberry hot chocolates and they let me sit there for a few hours typing away to update this blog. This doesn’t sound like much for a whole day’s work but with the quality of the WiFi in Patagonia and a fair amount of travel planning to do, it took up most of my day. Finally a full day of hiking came after this. 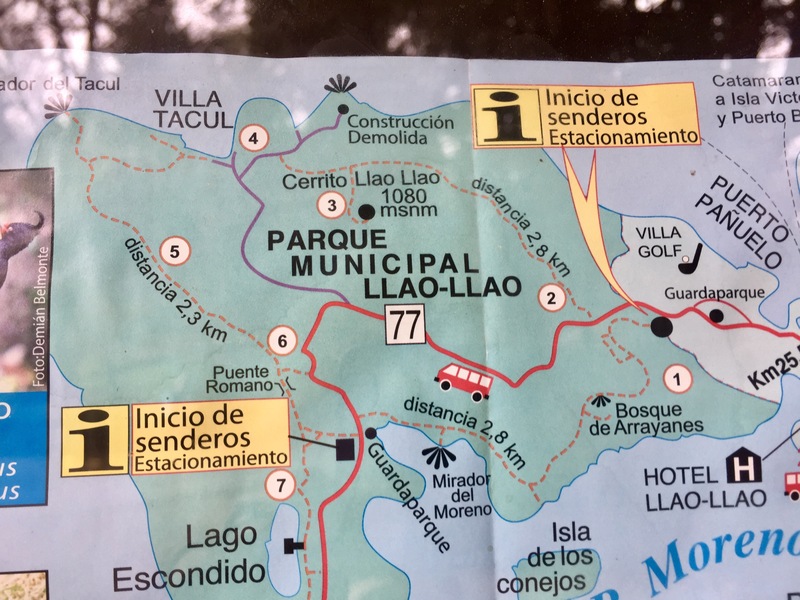 I asked around the hostel about nice hikes and decided that the route in El Parque Municipal Llao Llao (pronounced like Jao Jao) would be a good circuit that is well-signposted and had the added bonus of no park fees. Well lucky it was well-signposted because I brought the wrong map and had no clue where I was going. I took a picture of the map in the window of the closed tourist office and used this as my guide for the whole route. To be honest I’m not sure how long the route was in total and I wasn’t walking very fast, but it took me about five hours. It was a shame I’d forgotten to take lunch because there were loads of great picnic spots. Instead I ate the rest of my packet of biscuits and thought of the sandwich I would get from the bakery once back in town. 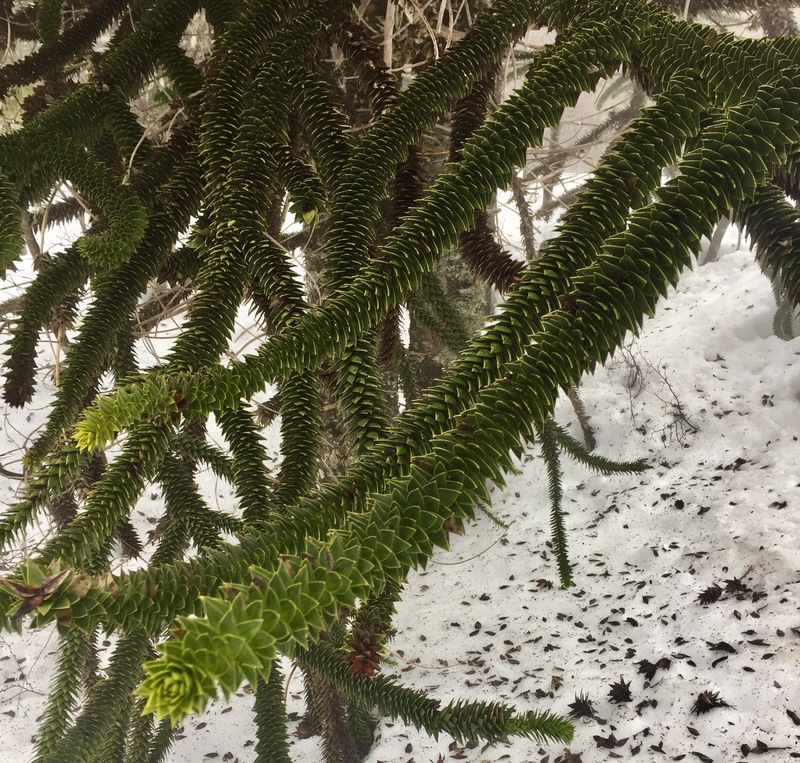 I started by walking through the forest to a clearing with some Arrayan trees which were sandy yellow colour that waved and wound in strange directions. 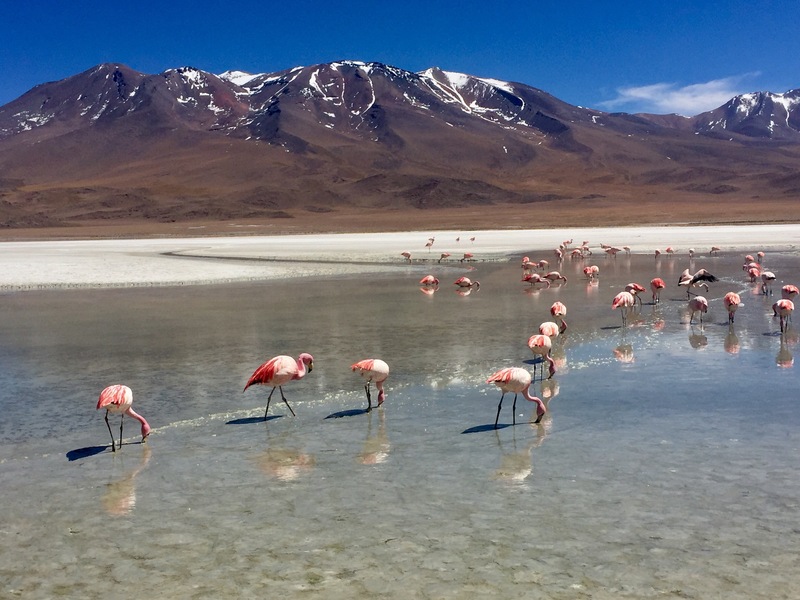 These are special in Argentina and you can see why because they are quite unusual. After this the path continues on to the beach of the lake with a number of different viewpoints. 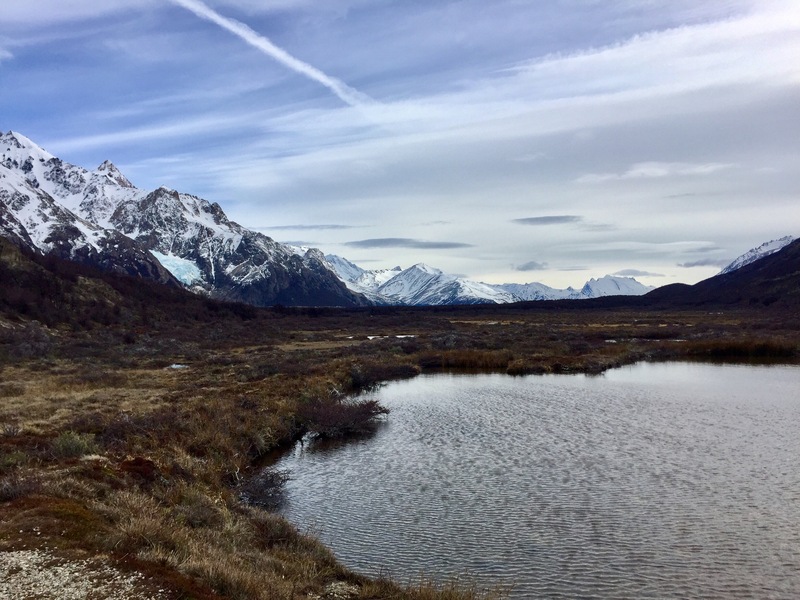 The beautiful snowcapped mountains surrounding the lakes have a real sense of calm and the route for this hike brought you close to lots of the different peaks. 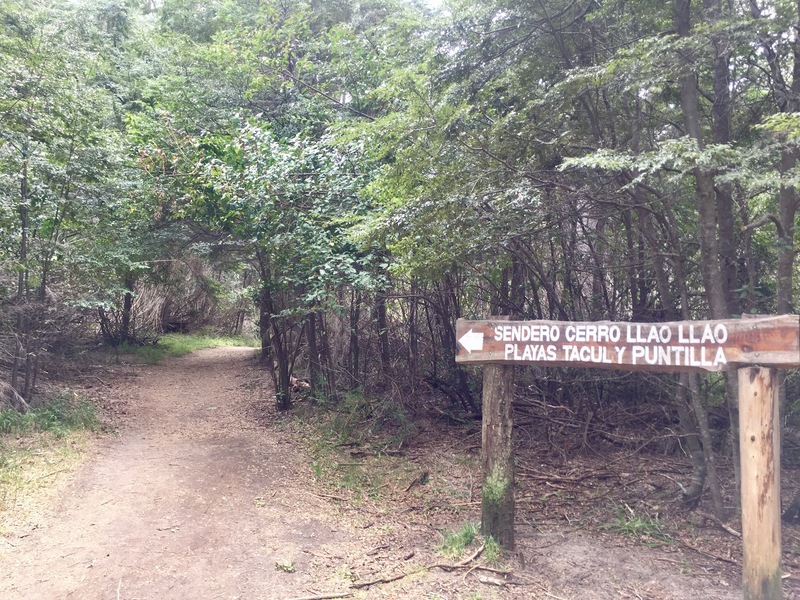 Towards the end of the circuit, the path leads off steeply to climb the Cerrito Llao Llao. It’s not a difficult path to climb and I was surprised that it was so quiet (I only saw two ladies on the hill) because the views were truly spectacular. 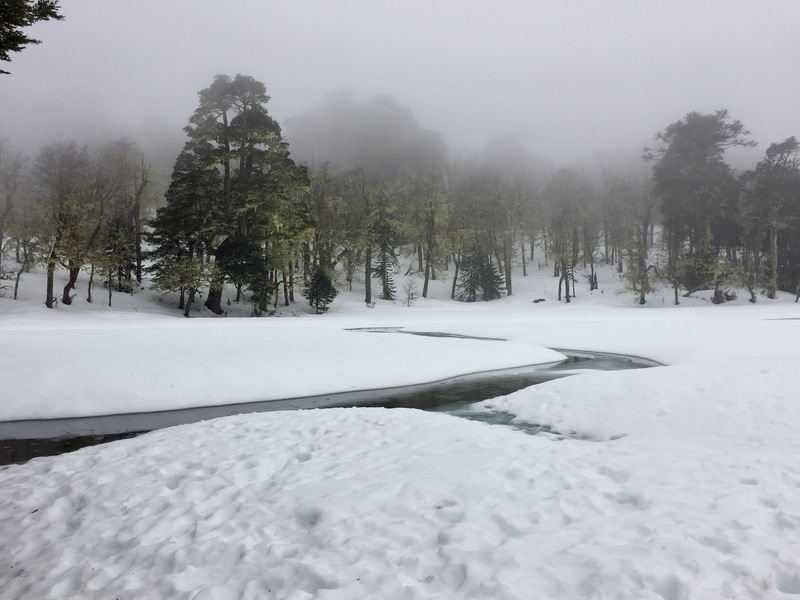 You could see a long way across the Nahuel Huapl National Park and little islands were dotted across the lake like a sprinkling of floating trees. The green of the surrounding forests against the dark blue of the lake and the white of the snowy mountains was mesmerising and I’m not sure there is a better view of the area. Even without the sunshine, I couldn’t have imagined a more perfect sight. 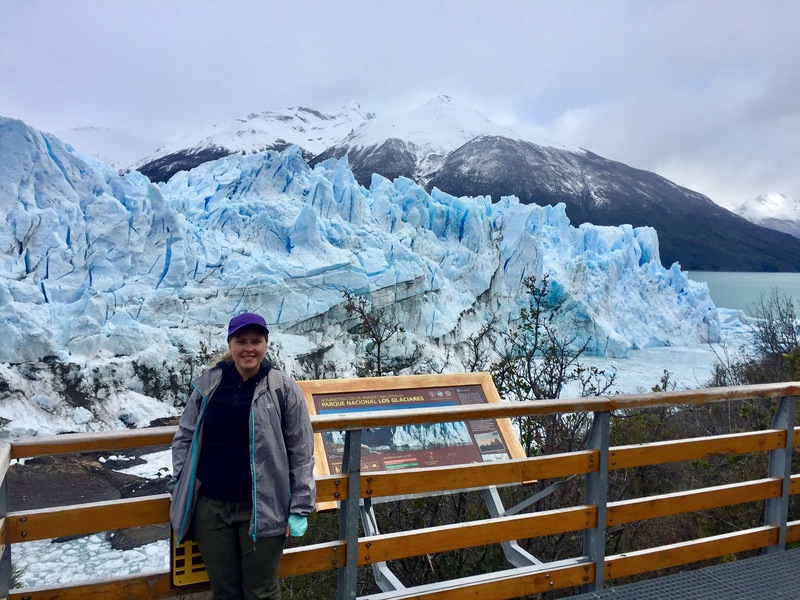 From Bariloche I’m skipping out a chunk of Patagonia to fly to El Calafate and visit the world famous Los Glaciares National Park. Expect ice, ice and more ice for the next post! 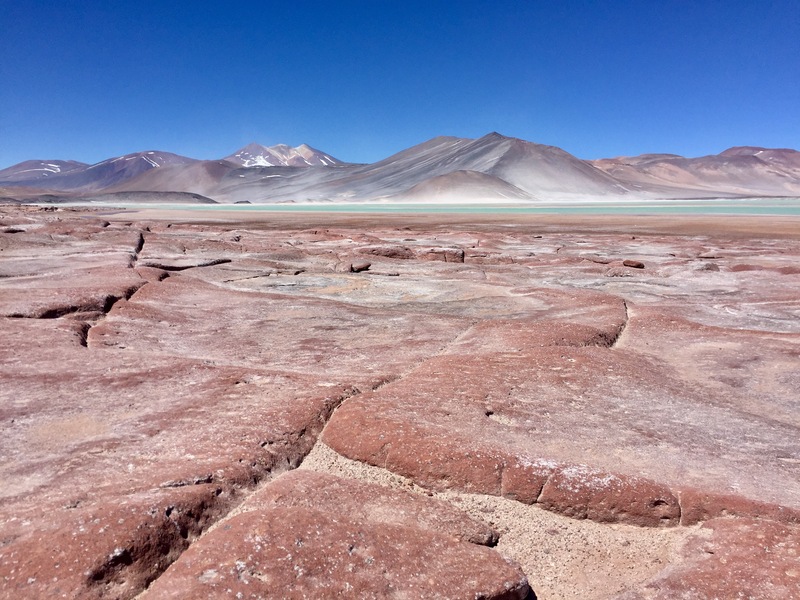 Having spent a more than a week away from civilisation in the Bolivian salt flats and the Atacama desert, arriving in Santiago and later moving to Valparaiso felt like a cultural explosion I hadn’t experienced so far in my trip. 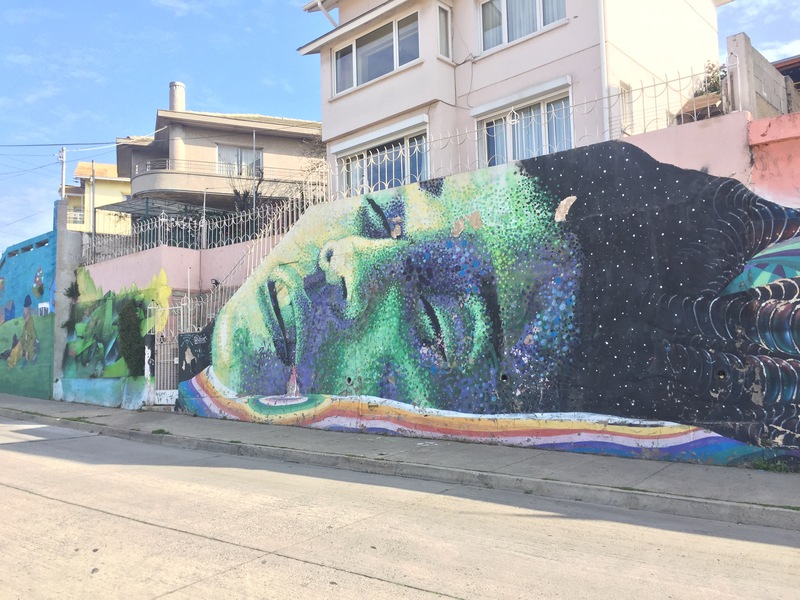 I had intended to only spend a day or two in Valparaiso but due to the Chilean Independence Day celebrations, I was unable to buy an earlier bus ticket so ended up staying four days in total. Instead of writing about the eight days in full, I’ll focus on the highlights and similarities between these two colourful cities side by side. 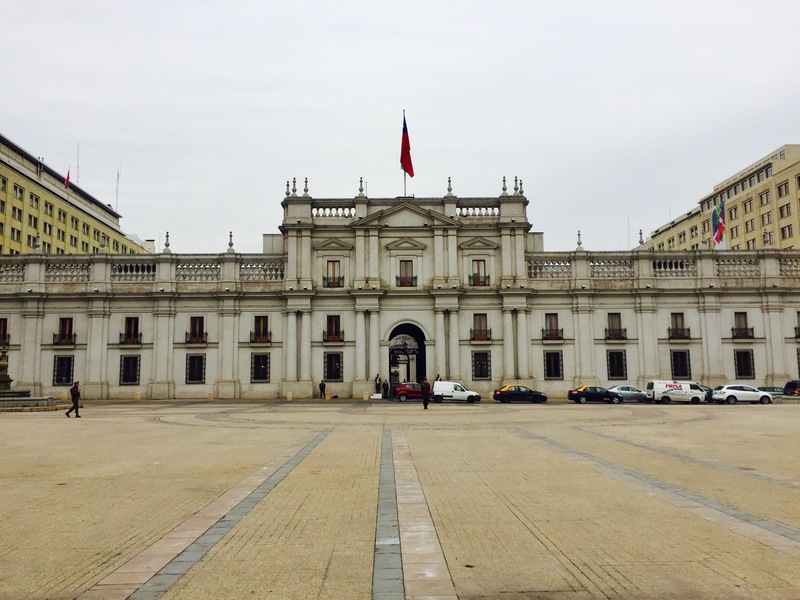 My second day in Santiago was marked by a well-known turning point in Chile’s history. September 11th has a different meaning for most western countries, but for Chile this is the day that marks the beginning of the military coup and the Pinochet dictatorship in which 50,000 people went missing or were exiled from their country. I had read about the history of Chile in my LP Bible (Lonely Planet guidebook) and so I knew the basics of the history but visiting the huge cemetery of Santiago (the size of 200 football pitches) and taking a historical walking tour on this special day brought extra significance to this history. Chile was torn between communist and socialist ideas, and a capitalist economic approach led by the military. I found it very interesting to hear the different sides of the argument. In Valparaiso I met the son of the butler to Pinochet (the dictator and president of Chile) and he told us another side to the story; how in private he had been a good man. 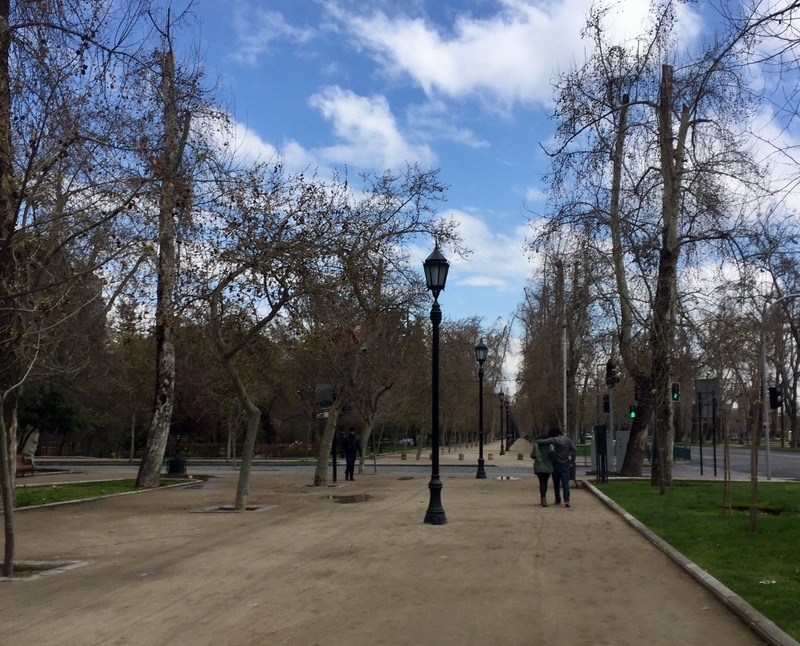 The country is clearly still divided and although not a nice topic to discuss, Chileans are happy share their opinions on this controversial chapter in their history. On my last day in Santiago I visited the Human Rights Museum which explains the violations the Junta (the military group in charge during the dictatorship) committed including torturing, abduction and imprisonment. Many thousands of people who went missing from Chile at this time have never been found. This museum is a must-see in my opinion and despite most of the exhibits being in Spanish, the free audio guide does a great job of documenting the turbulent period. I am no expert in architecture, in fact I know very little about it but it does interest me and it’s always one of the first things I notice about a new place. The architecture of these two cities is very different but still striking. 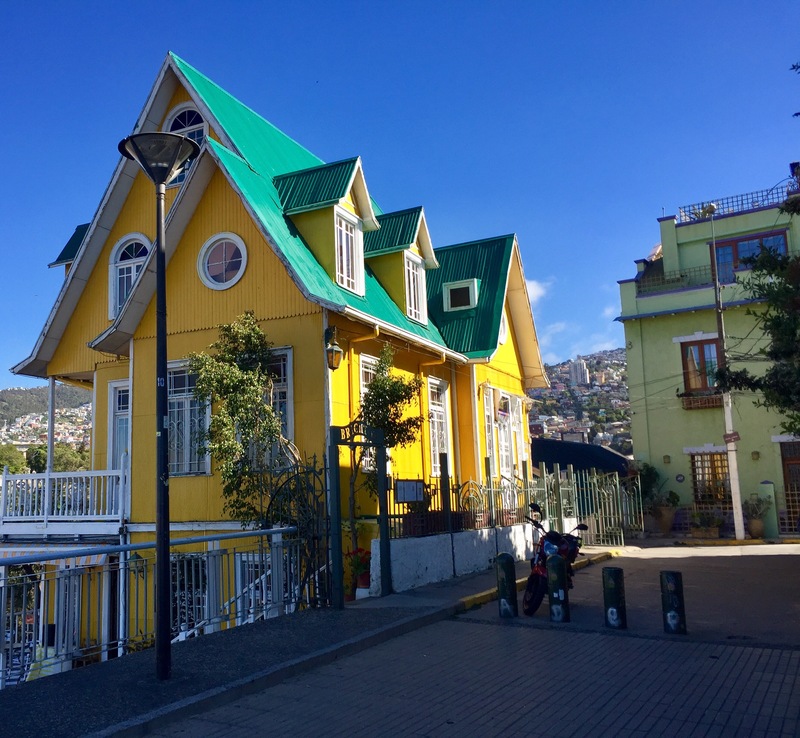 I preferred the variety of Santiago to the famous colourful and distinct buildings of Valparaiso. 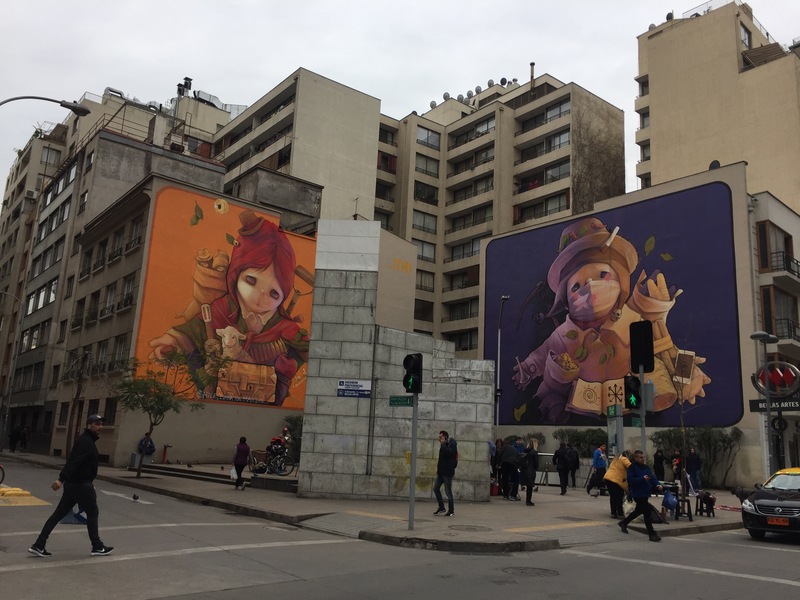 In Santiago you can walk down a street and see 10 different styles of buildings all lined up next to one another, modern glass structures followed by colonial designs followed by ugly concrete flats. 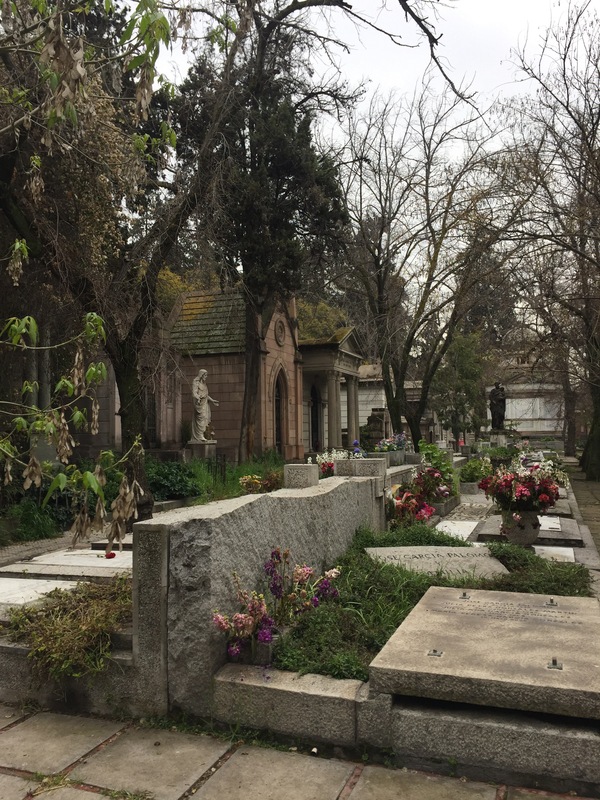 The same goes for Santiago’s beautiful and eerie cemetery. I only spent a short time walking around this quiet and peaceful place but the differences between each tomb and memorial was fascinating. To begin with I felt very uncomfortable walking around and I didn’t want to be considered disrespectful to the mourners by taking hundreds of pictures. It was very easy to get lost in the maze of graves and memorials but this was part of the beauty and I left feeling that this seemed like a nice place to rest. 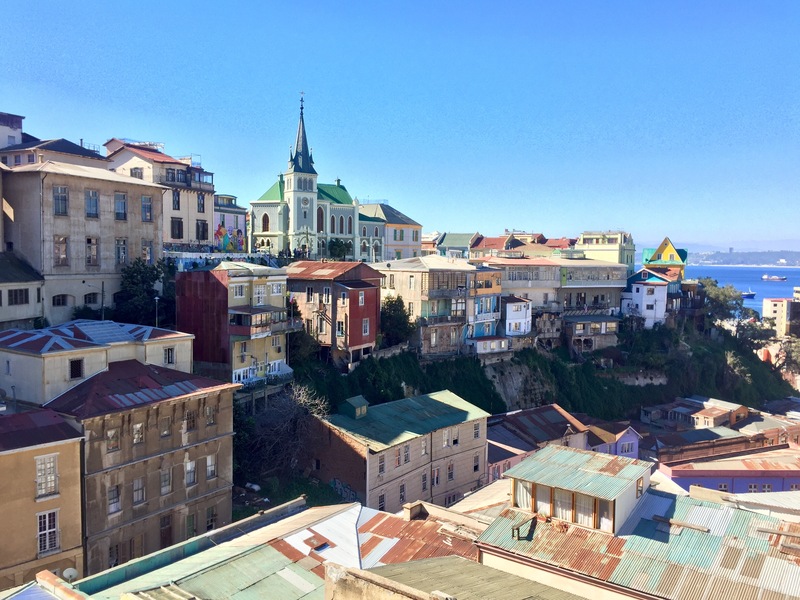 The architecture in Valparaiso throws a stark contrast on the colonial and sophisticated architecture of Santiago. The typical buildings are covered with corrugated metal sheets like you would expect to see used for make-shift roofs. The style is now protected by UNESCO and considered distinct to the city’s culture. 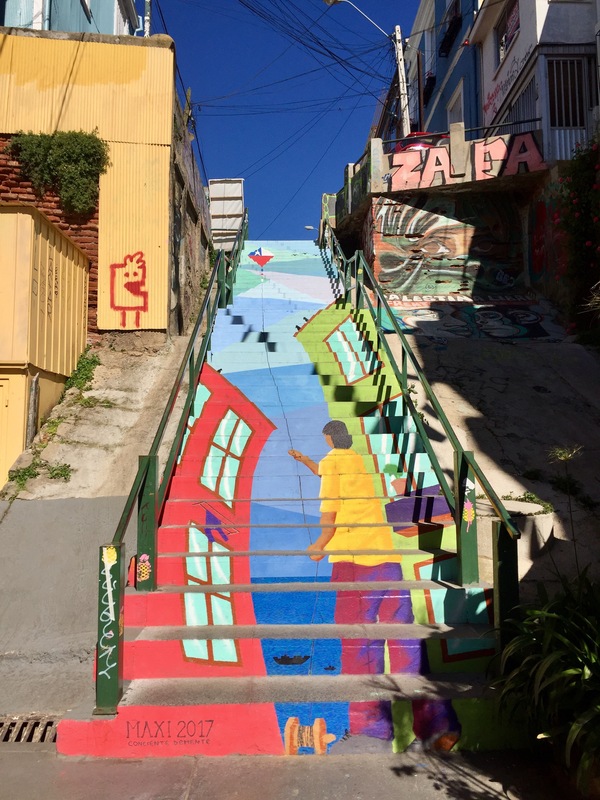 Valparaiso is a sprawling city build across more than 20 cerros (hills) and many have old elevators that you can ride to the top (only 5 are still in action). 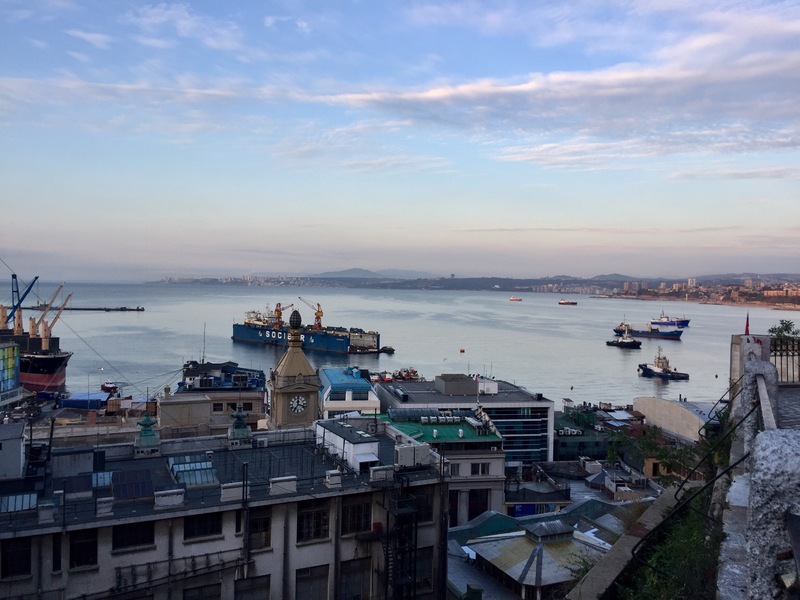 Made famous and rich as an important sea port for those on their way from Europe to California for the gold rush, Valparaiso is now quite a poor city struggling to recover from economic difficulties. The plan or flat area of the city by the port retains some of the early colonial buildings used during these stopovers and their antiquity is out of place now in comparison to the ‘modern’ bright and colourful residences. 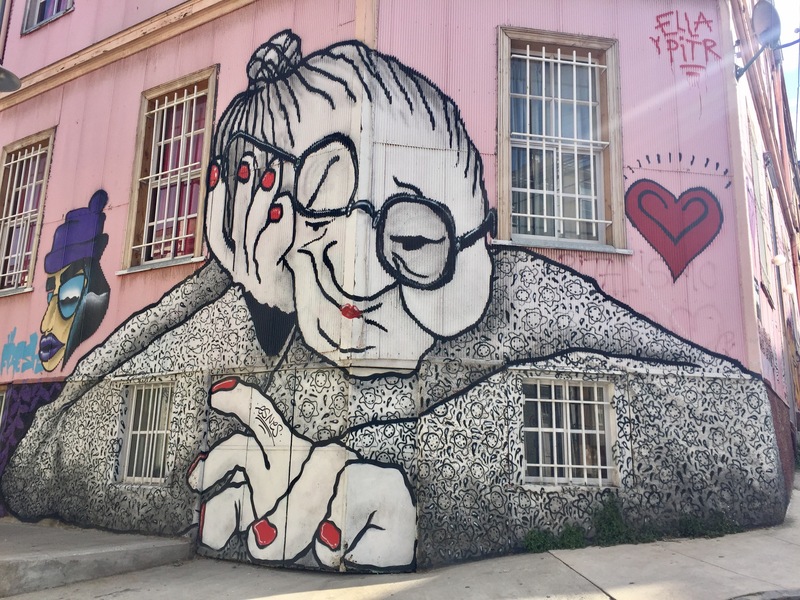 Art and graffiti are the most striking aspects of Chilean culture in these cities. This is perfect for me as I’d always choose an art museum over a science or history museum. 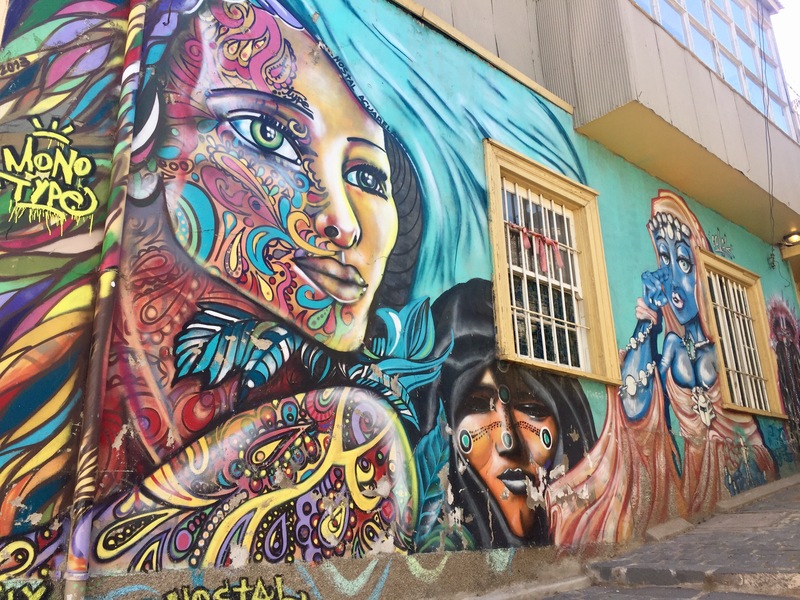 It’s almost impossible to avoid the art and it’s importance in Chile; graffiti and murals cover most large walls and available spaces. 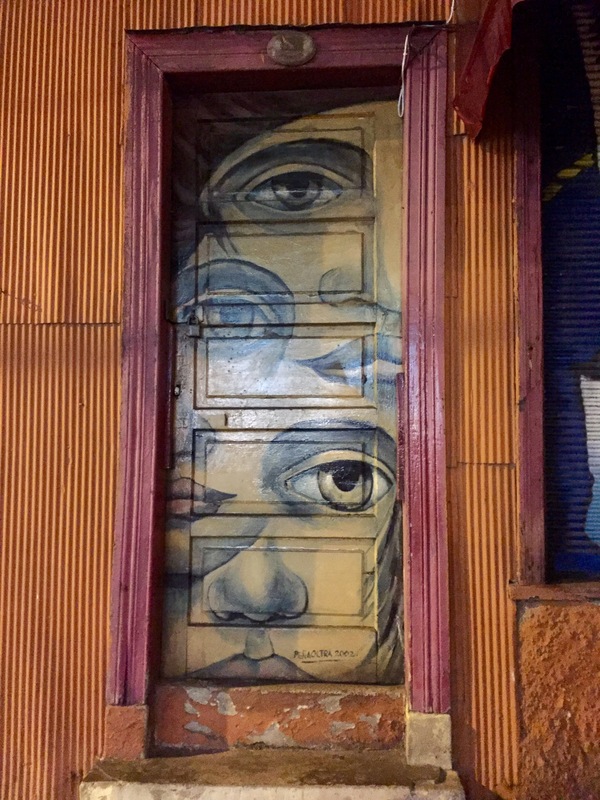 In Santiago I stayed in Barrio Bellavista, the new bohemian area of the city with graffiti on every street surrounding the hostel. 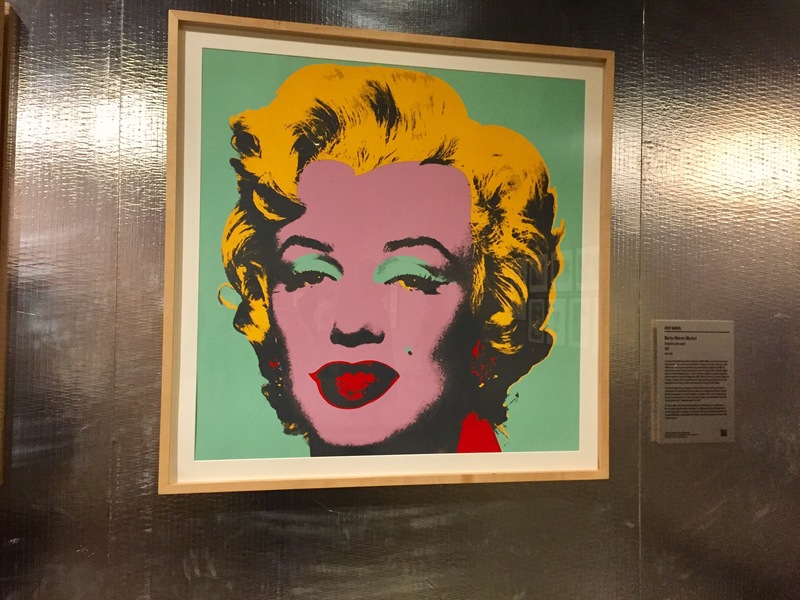 You only have to walk to the metro to see countless pieces and different styles. I had intended to search out more graffiti in Barrio Brasil but ran out of time as it was across town from my hostel. 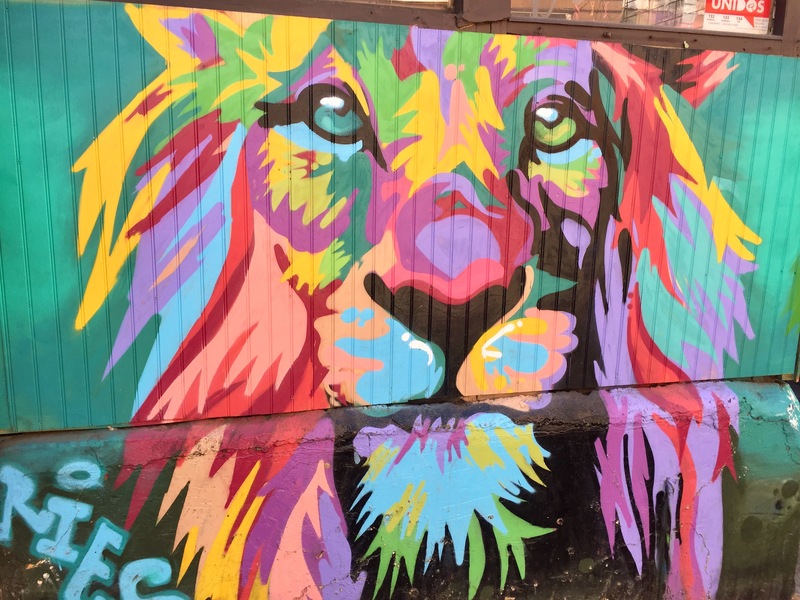 But even without trying I saw a lot of great artwork and whetted my appetite for Valparaiso. 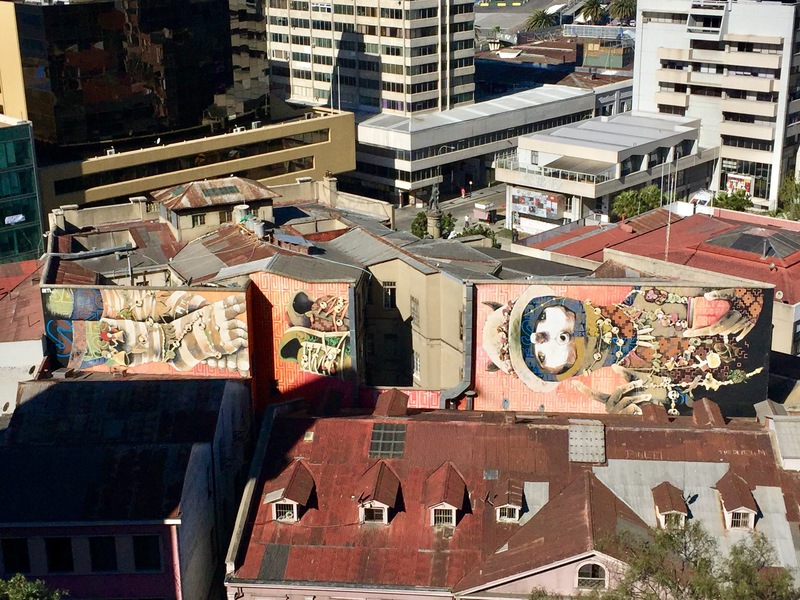 Valparaiso is famous for its graffiti and it rivals Bogota for its frequency when walking around the city. Almost every building and wall has some from of graffiti, from tagging to huge, world famous murals. It’s embraced by the city and used by many businesses as a way to attract attention and increase tourism. I went on another graffiti tour here and I was lucky enough to get a solo tour as no one else signed up that day. 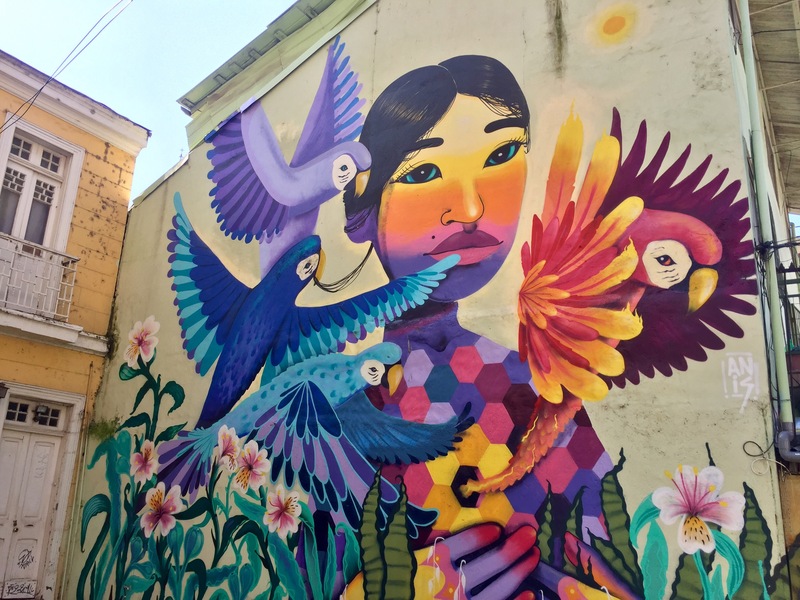 I don’t think the tour was as informative as the one in Bogota but it was still very interesting as the guide was an artist himself so he was able to explain some techniques and styles with a lot of detail. I’d definitely recommend this over some of the other walking tours and you get a lot more graffiti-specific information and context. 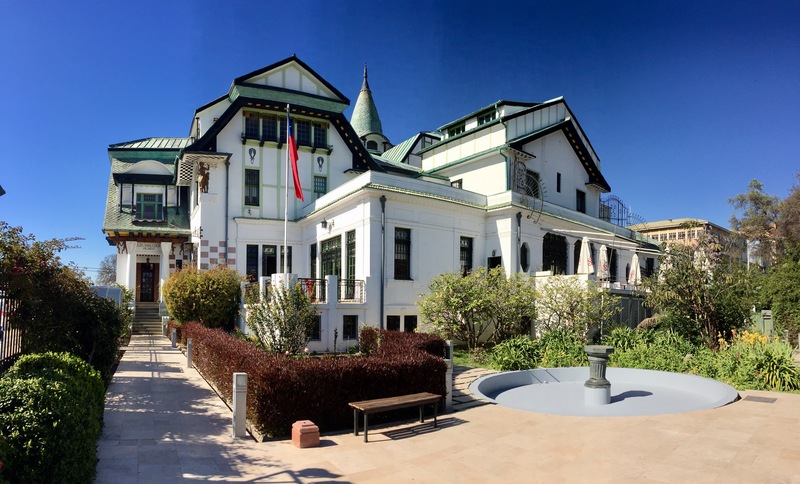 In both cities I visited art museums or exhibitions – there were more that I wanted to see in Santiago but I ran out of time. 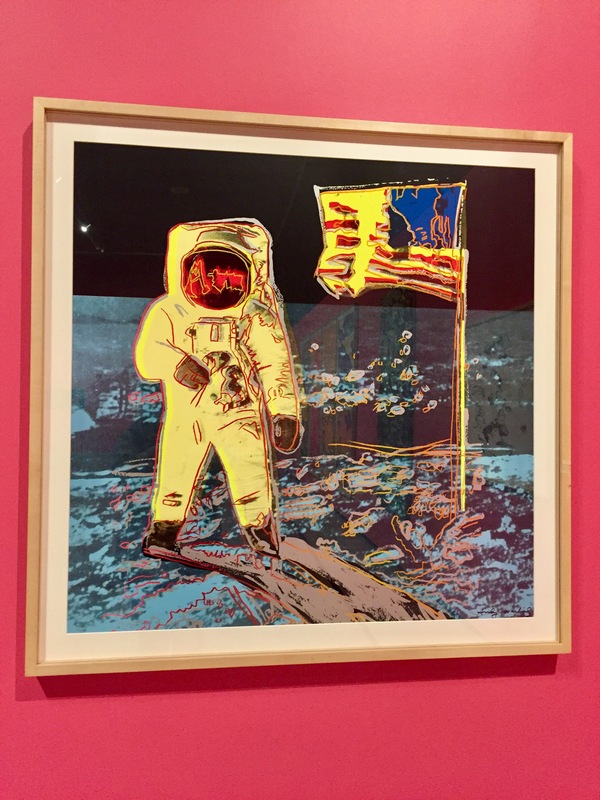 On Monday all museums are closed in basically all of South America (very annoying for tourists) but luckily an Andy Warhol exhibition was open and free before 12pm. 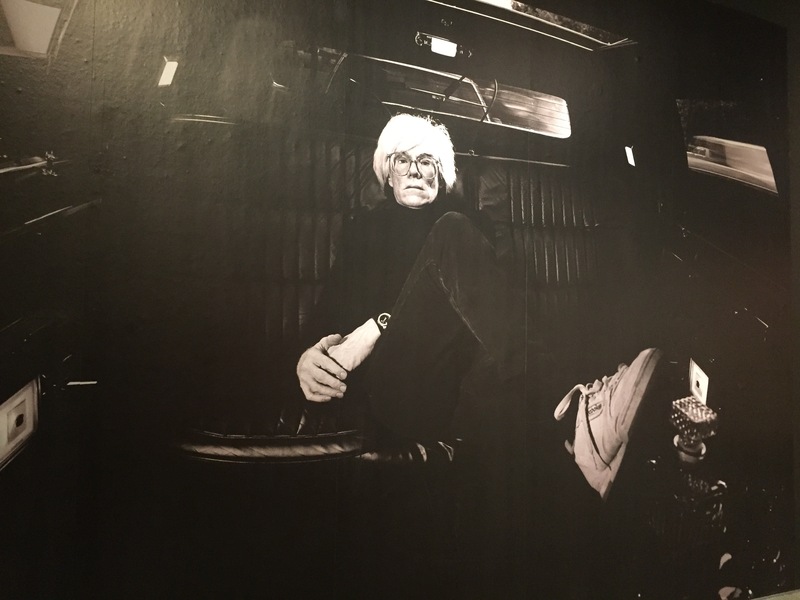 I’m not extremely knowledgable on Andy Warhol but I know his style and could name some of his works before entering the exhibition. 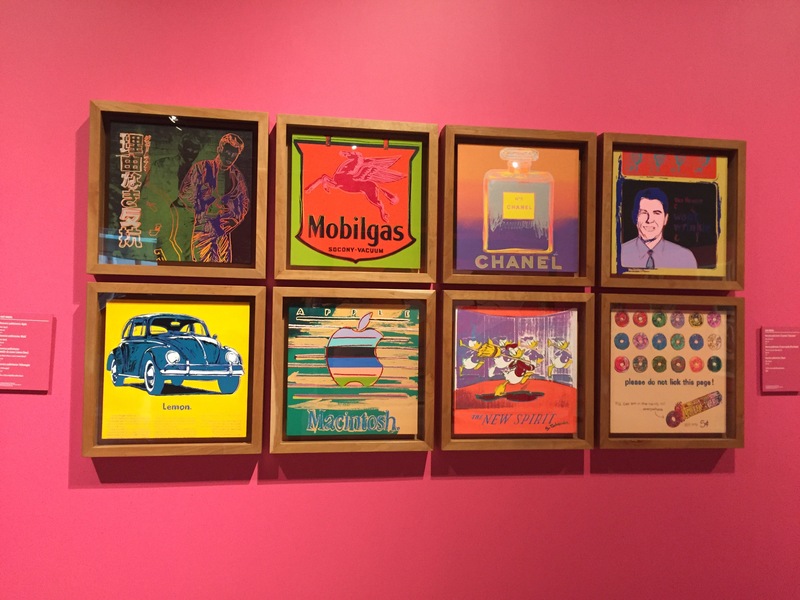 Although most of the signs were in Spanish, I learnt quite a bit from the few English signs and the development of his work over time. His use of colour is so popular and this especially appealed to me. 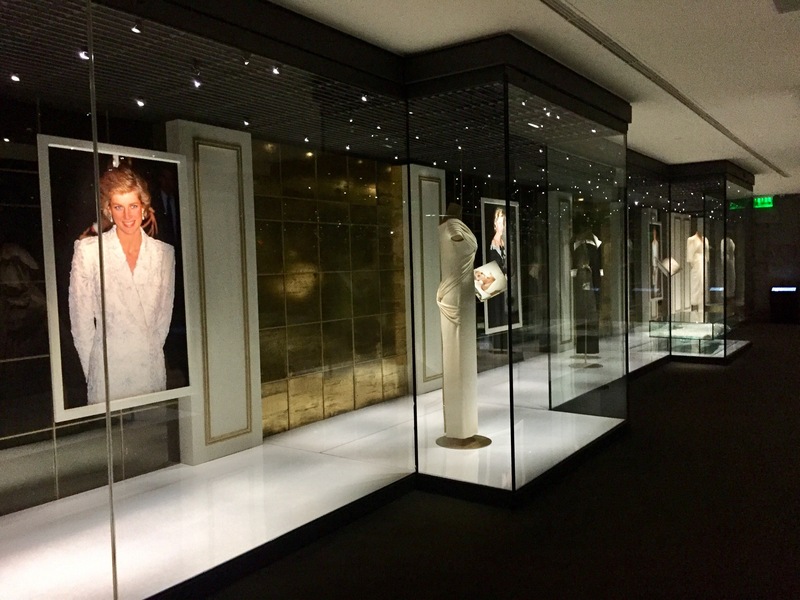 I also visited the Museo de la Moda in Santiago which, although in the guidebook, was very quiet, almost deserted, and not the easiest to get to. This was a fantastic museum held in a house that a stylish family used to own. 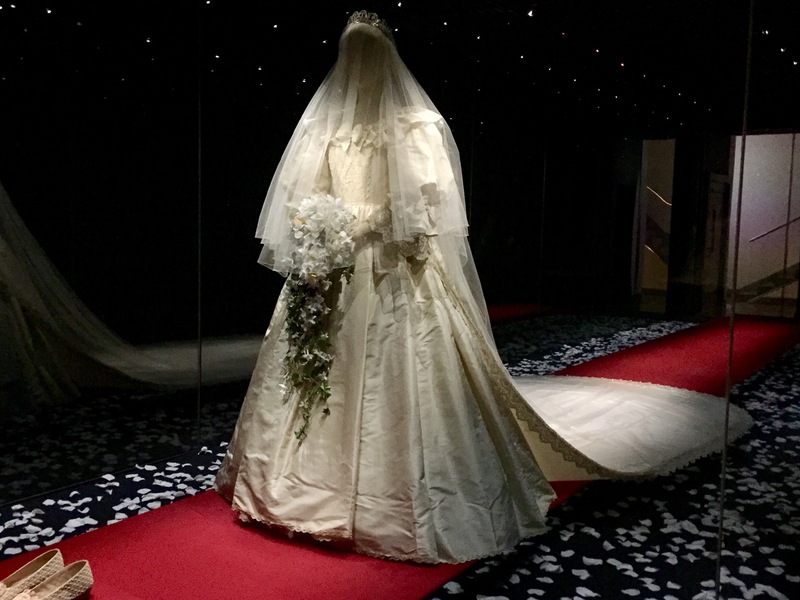 The museum was a mix of an exhibition from a Chilean designer, a showcase of the house as it was originally decorated and an exhibition of Princess Diana’s most famous dresses, including her replica wedding dress from Madame Tussauds in London. I loved this museum and I felt like I had uncovered a treasure many tourists don’t get to see. Perhaps it was because I felt like I had the museum to myself, but this was one of my highlights of Santiago. 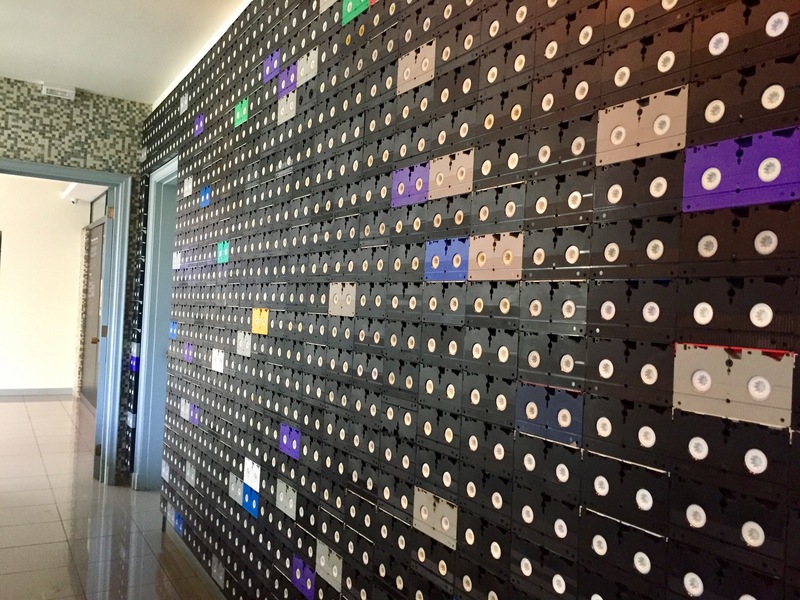 In the entrance hall there is a wall covered in video tapes and this really struck me as an innovative design idea – I’d love to try to recreate this in my own home. 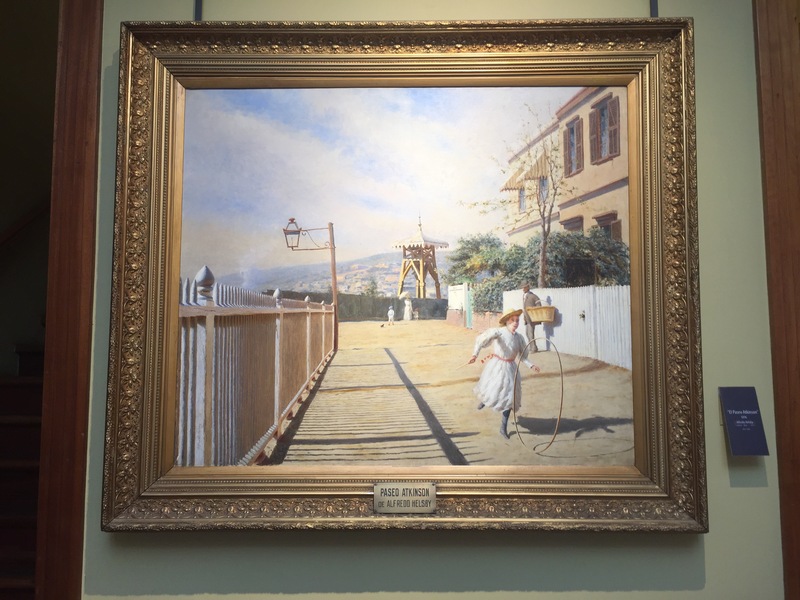 In Valparaiso, with my extra, unplanned time, I visited the Museo Municipal de Bellas Artes held in the Palacio Baburizza. 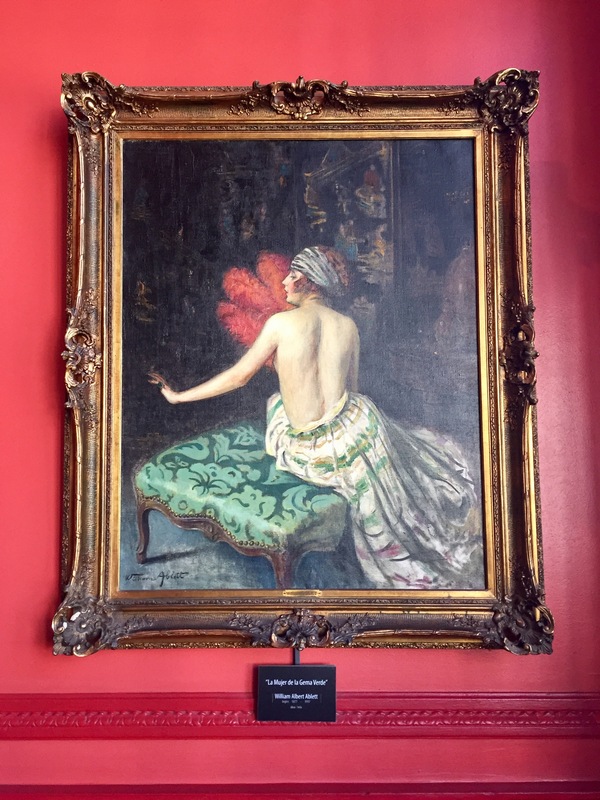 I had been told on a walking tour that the museum’s collection was formed by the second owner of the palace who had brought back art from Europe after each of his business trips and holidays. 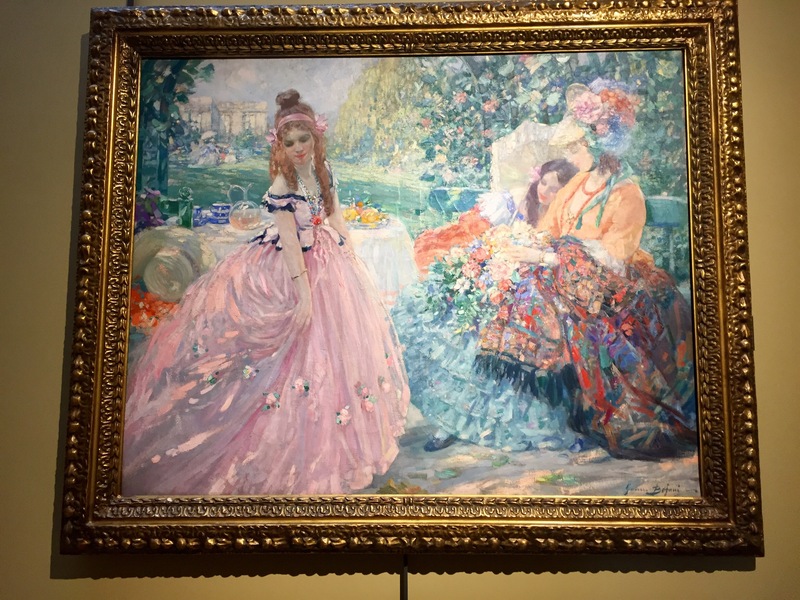 The museum has a large collection of impressionist and 20th century art which, although not mostly famous, is still very impressive. This museum was right up my street and I could have probably gone around twice the pieces were so good. Thankfully I was allowed to take lots of pictures though so I’ll be able to keep a good memory of them. 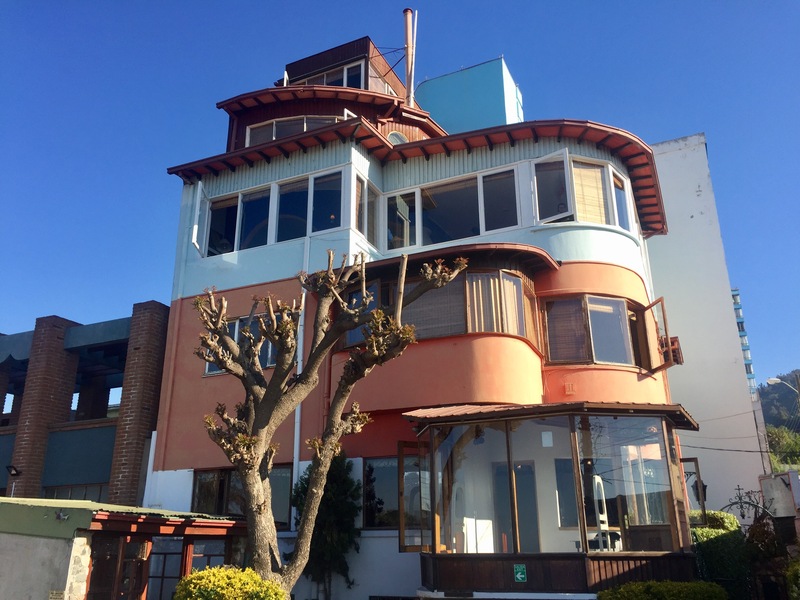 I did also visit the Noble Prize winning poet, Pablo Neruda’s house, La Sebastiana, but unfortunately I had a screaming child following me around the whole time who ruined the experience for me. It is quite small and very expensive to visit, and although it’s well-known, I don’t think it’s worth seeing. Perhaps save it for a rainy day. 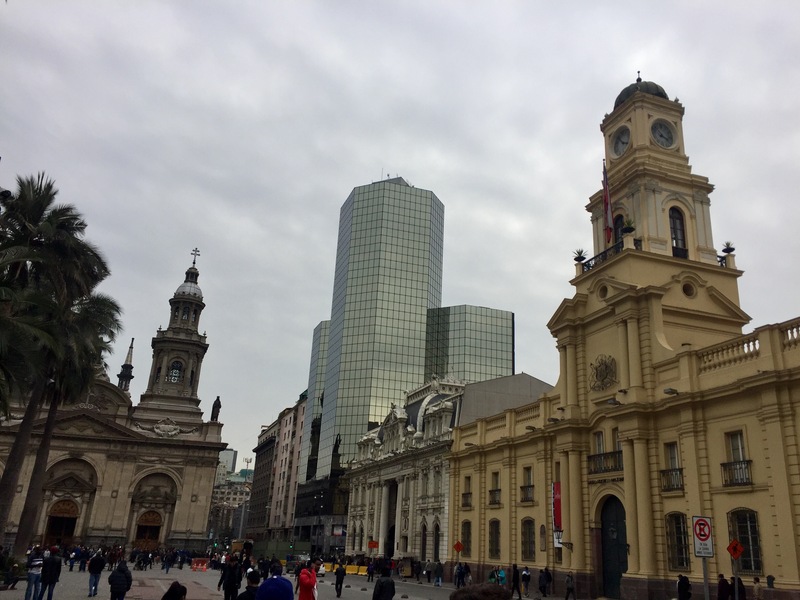 The culture of both of these cities made the extended period of time I spent between them worth it and if I had more time and money, I would have liked to have seen more of Santiago. I could see myself returning here in the future, perhaps to study or just to explore the city more. It’s metropolitan and yet the snowcapped mountains and city parks give you more than enough space to escape. A good thing I’ve had my fill of culture as for the next month of travel I’ll be in the countryside exploring Patagonia! 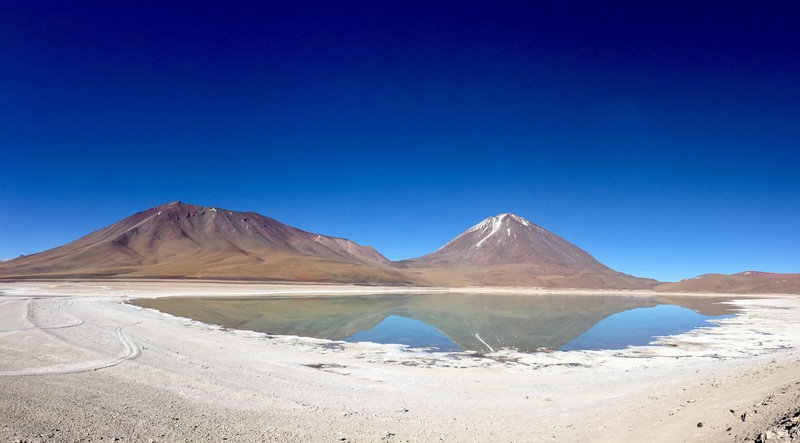 My trip across the Bolivian salt flats and lagoons led me to the border of northern Chile, just a short distance from Atacama de San Pedro – the driest desert in the world. Having been in the desert in Peru a few weeks before and really enjoyed my time there, I was looking forward to the warmer climate and obscure landscapes. I didn’t get off to the best of the starts after finding I had booked the wrong dates for my hostel and so was made to pay for the night before my stay as well as three more nights (in the most expensive town of my trip so far). But the hostel was at least a nice place with an eclectic style and friendly staff. More bad news came when I was told that the full moon was making it too bright to do the popular stargazing tour throughout the entirety of my stay. Bummer. Except for Chile turning out to be a very expensive country, this was the end of the bad news. My hostel had heaps of information on day trips and expeditions you could do from the town and fortunately some of them were half day trips so I could pack quite a lot into my three and a half days. 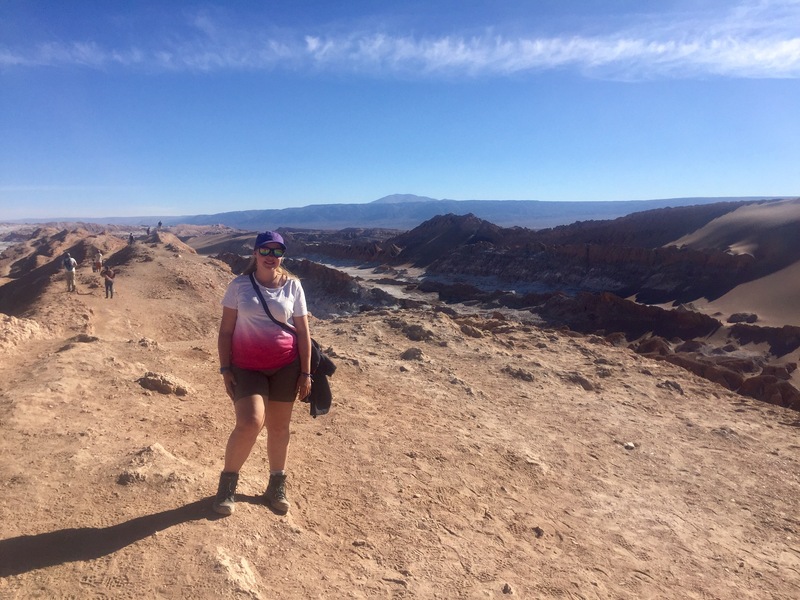 The first thing to note is the food is much better in Chile than Bolivia (and more expensive) and I ate really well the whole time I was in the desert – lasagna, pizza and a BBQ. It’s funny how in remote places like the desert you can easily find some delicious food but in big cities like La Paz it’s really difficult. 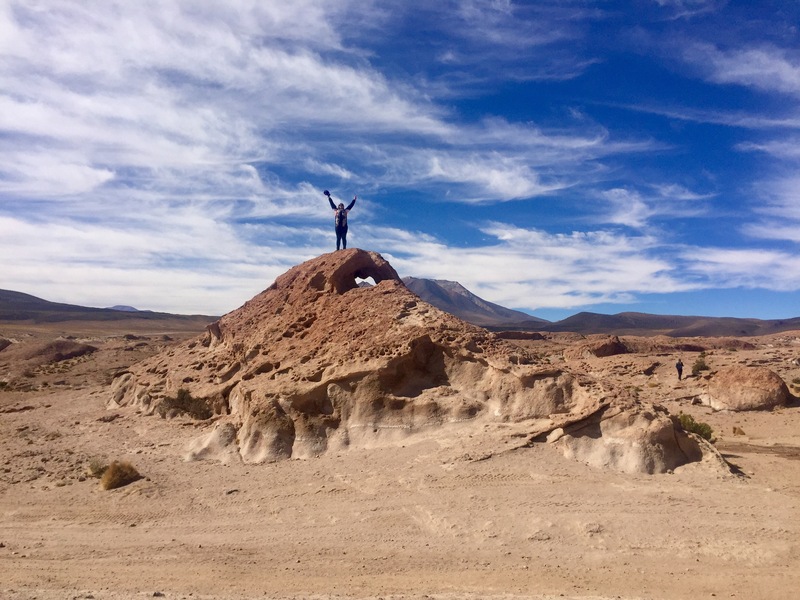 In the afternoon of my first day in the Atacama desert, I signed up to do the Valley de la Luna tour (it was highly recommended by the hostel and also the cheapest). If you’ve been following along closely you’ll know I have already visited a place with the same name in La Paz. I was assured that it was very different and that’s certainly what it was. 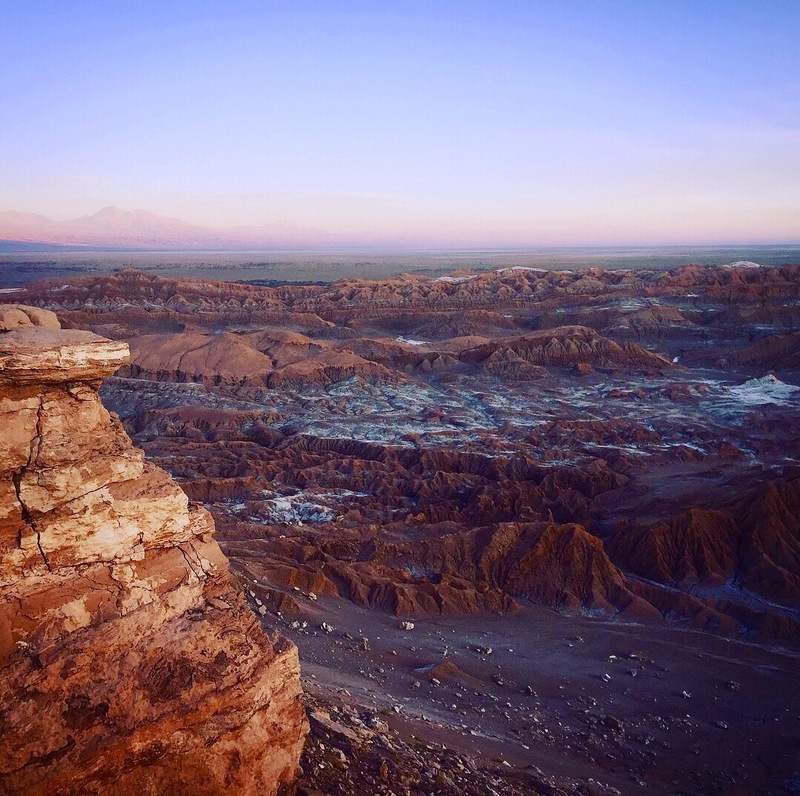 The Valley de la Luna (Moon Valley) in the Atacama is a magnificent range of rock formations and sand dunes surrounded by so many different mountain ranges. With the guide, we hiked up the ridge of one of the rock formations and walked along the top surveying the amazing panoramic views. It felt like a scene out of The Martian, if you haven’t seen the movie it’s about a man who gets trapped on Mars, with the deep orange-red sands and the desolate landscape all the time framed by endless mountains. I think they should rename it the Mars Valley. We also visited the Three Maria’s, a famous rock formation that looks like three Mary’s praying to God. It’s surrounded by a strange area of the national park which looks like it’s been dusted with snow, but it’s actually salt formations. 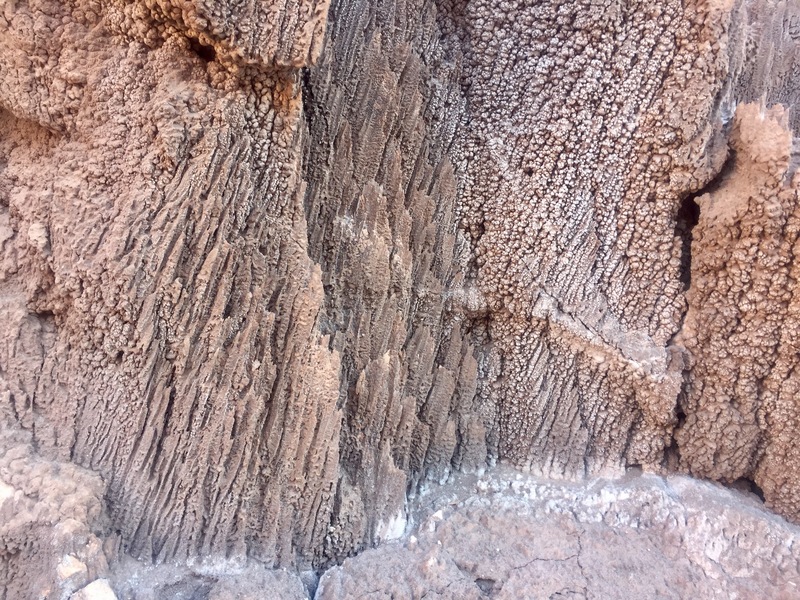 After that we visited a canyon where you can hear the salt stalactites being formed, like a ticking or crunching sound, by the thermic energy from the volcanoes nearby. The day finished with a stop at the Piedra Del Coyote lookout point to watch the sunset. I’ve watched more sunsets in this trip than I have in my whole life and some have been nothing too special but this wasn’t one of them. 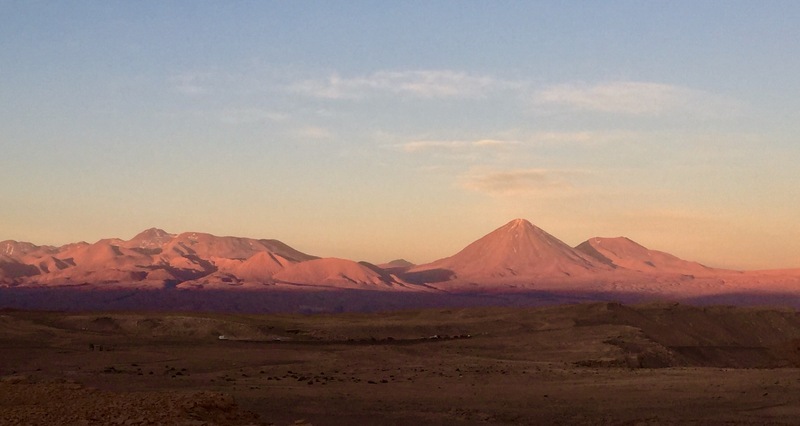 The pinks and peaches thrown across the horizon in the shadows on the mountains and volcanoes surrounding the canyon were beautiful and the perfect way to finish my first day in Chile. 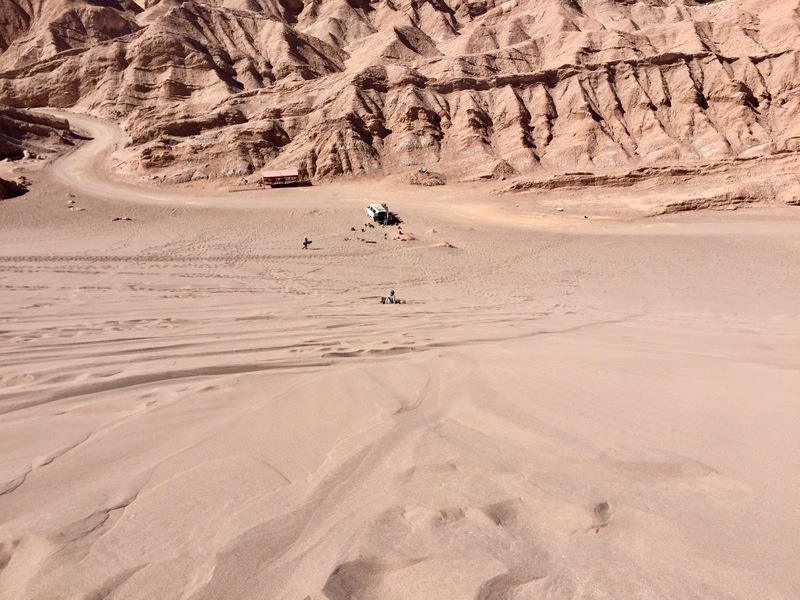 The next day I was up early, ready to tackle my nemesis from Huacachina, the illusive sandboarding. Yes, I signed up to have another go at the activity I had least enjoyed in Peru, not because it wasn’t fun but because we weren’t given a proper chance to try it out. I was determined not only to have another go, but to master it. In San Pedro you don’t have a buggy ride included in the package, just an instructor, a helmet, proper boots and an actual snowboard/sandboard. This was exactly what I wanted. To safely learn how to actually sandboard. You are driven to a place called ‘Death Valley’ (very reassuring) and helped to choose a board and learn how to mount it. You’re then made to climb the sand dune with your board in hand – this was the only bit I didn’t like. Once you finally reach the top, the instructor explained some basic techniques and then one at a time you take your first ride (or slide in most cases) down the sand dune. Although a little tentative at first, I soon got the hang of it and people were even beginning to ask me if I had been snowboarding before! I got more and more adventurous, going from steeper and steeper parts of the sand dune. I was disappointed to be coming to the end of the session all too soon (time flies and all that) and tried to really enjoy my last go down the dune. Relaxing just a little too much near the bottom I had a massive wipe out that later caused me a lot of neck pain – thank God for the helmet! I think it’s fair to say that sandboarding take two was much more successful, despite the big crash at the end. 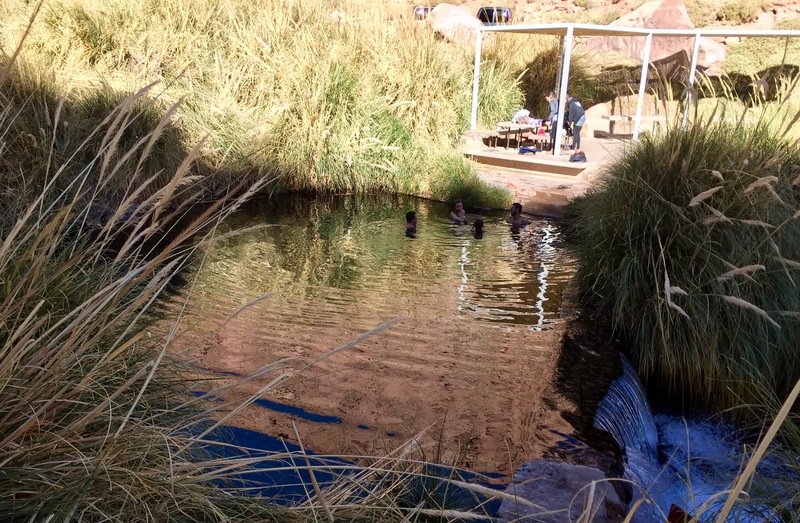 In the afternoon I had booked to go to the hot springs which was definitely necessary after repeatedly walking up the sand dune and crashing at sandboarding. The hot springs were in a really nice location, in the bottom of a volcanic valley, and they had several different pools you could try out. Unfortunately at this time of year they weren’t very hot and the cold wind outside the pool meant I ended up staying in the same one for the whole time (nearly two hours – I was very wrinkly at the end). It was kind of like being in a wam natural swimming pool, very relaxing but not like the hot tub I was expecting and hoping for. Still I enjoying floating about there and I was glad of the excuse to do nothing else. 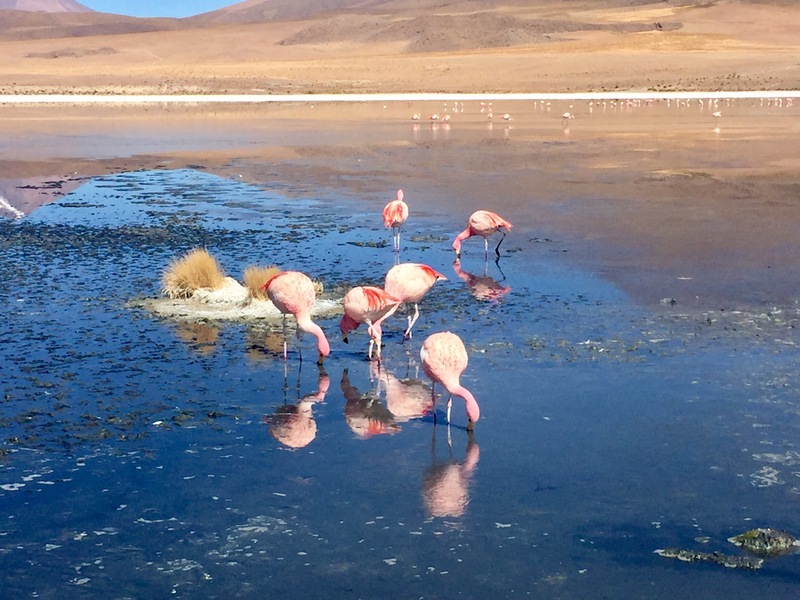 The next day I was up early again for a full day trip to see the Piedras Rojas (Red Stones) which also included seeing some other landscapes such as more lagoons, salt flats and mountains. You’d think I’d had enough of seeing them but the hostel staff had also really recommended this tour so, after seeing some pictures, I booked it too. It was quite a long day trip starting with smelly, sulphurous salt flats before breakfast which looked completely different to Bolivia’s. They were dark in colour and if I remember correctly formed by the volcanic matter instead of an evaporated sea like Bolivia’s. 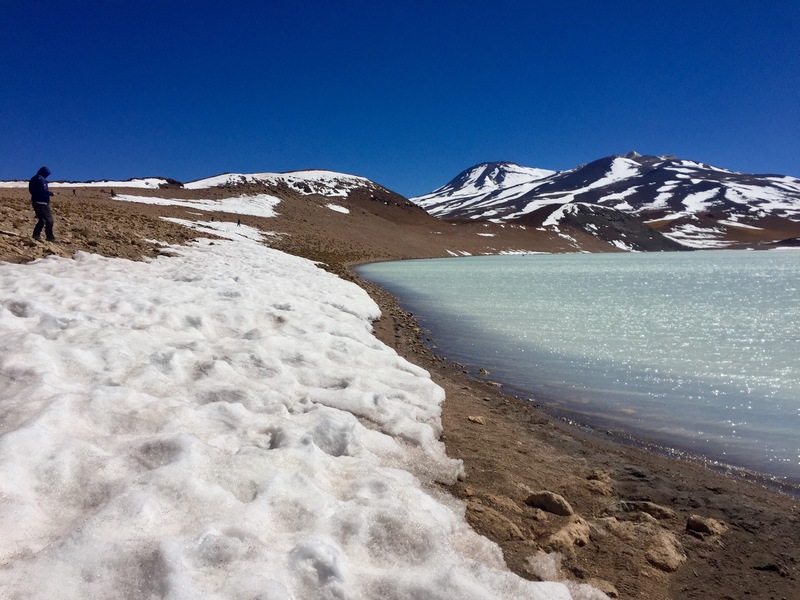 Next we drove on to a lagoon that had snow around its edges. It was extremely windy which meant that the water’s surface that was normal like a mirror was rippling instead of reflecting. It was a very light blue in colour but still pretty to see even when it wasn’t at its best. On to the main attraction, next we went to the red stones lagoon. This was without a doubt the best lagoon I have ever seen. The water was a bright blue with touches of turquoise in the light. It was actually a salt water lagoon so that’s why it was so blue and the crusty salt shore formed amazing crystals. The red stones themselves were great but not as fantastic as the pictures I had seen. Apparently this is not the best time of the year to see them. I mean, they were red, but also a bit salty and dusty. 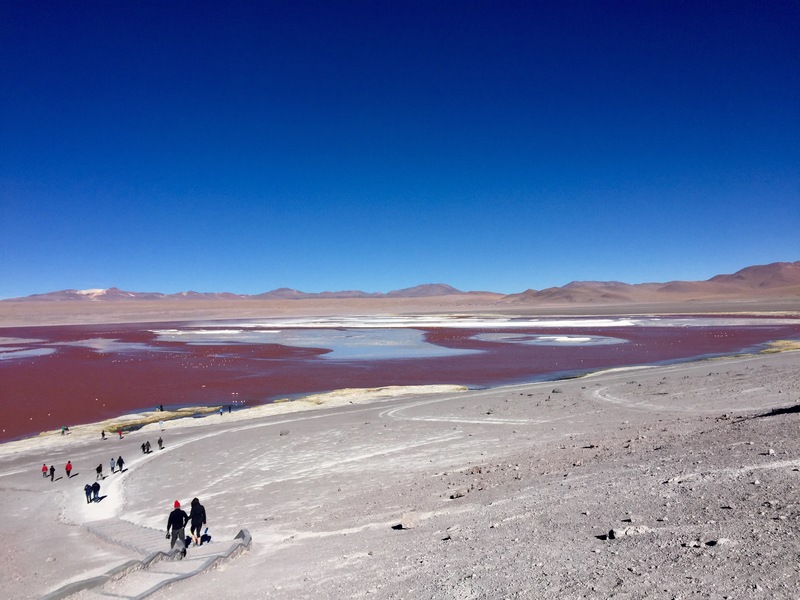 The mountains that were the backdrop to the beautiful lagoon and red stones were amazing too. They looked like they were taken straight from a chalk drawing, with smooth lines that faded into nothingness. If you imagine the most ragged rocks imaginable, then these were the complete opposite. It was worth the whole day trip, just to see the mountains almost. After this is was finally lunch time in a local village and we were shown how the local community uses cactus wood for building – I didn’t even know there was wood inside a cactus! 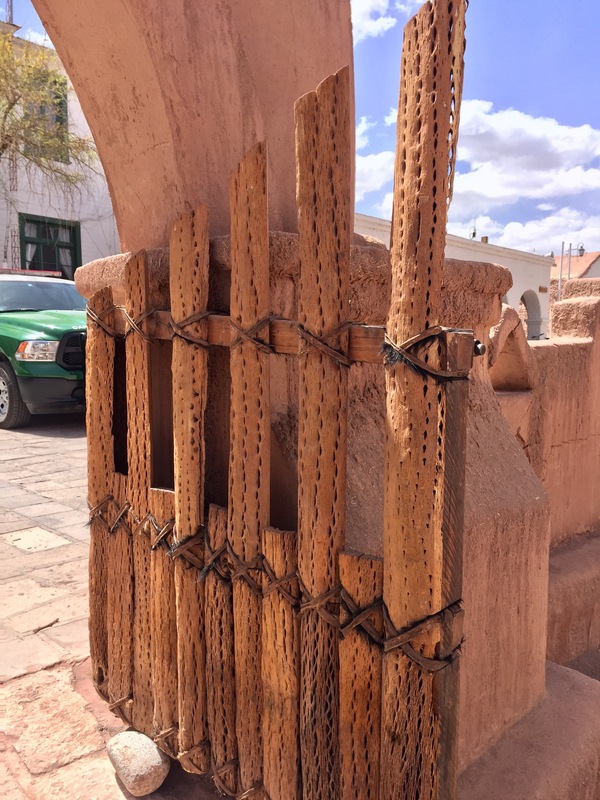 There is so much more to see in San Pedro de Atacama but as it was so expensive, I couldn’t afford (time or money wise) to stay there any longer. 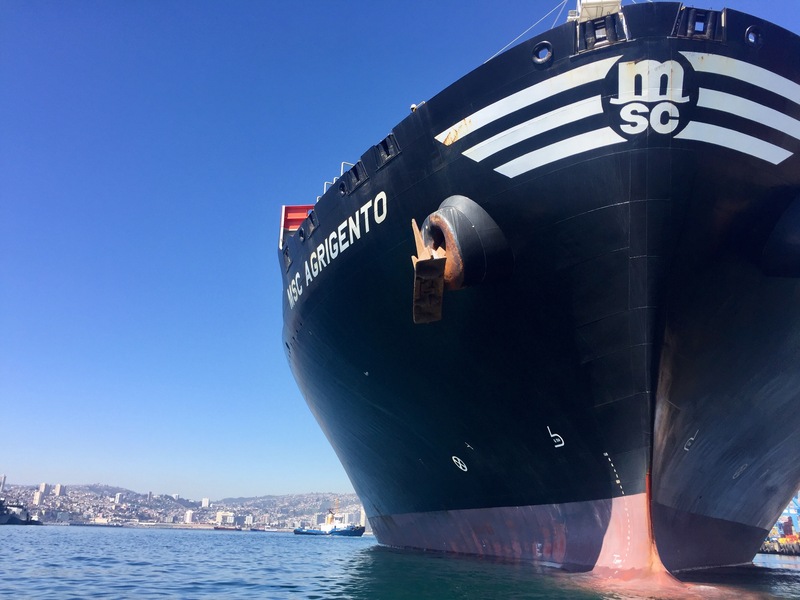 Next stop, big city time in Santiago and Valparaiso! 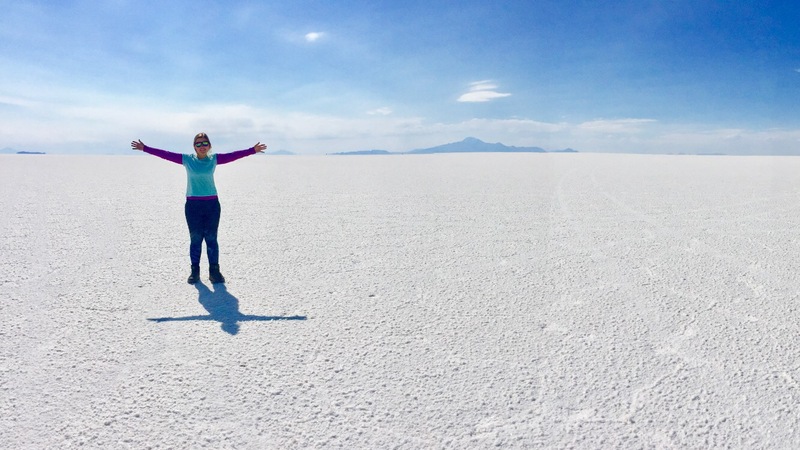 For the entirety of my trip, even during my planning before I left the UK, I’ve been excited about going to the epic Salar de Uyuni, the world’s largest salt flats and Bolivia’s most popular tourist attraction. Just from searching the name on Google images you can see how awe-inspiring the landscape is. 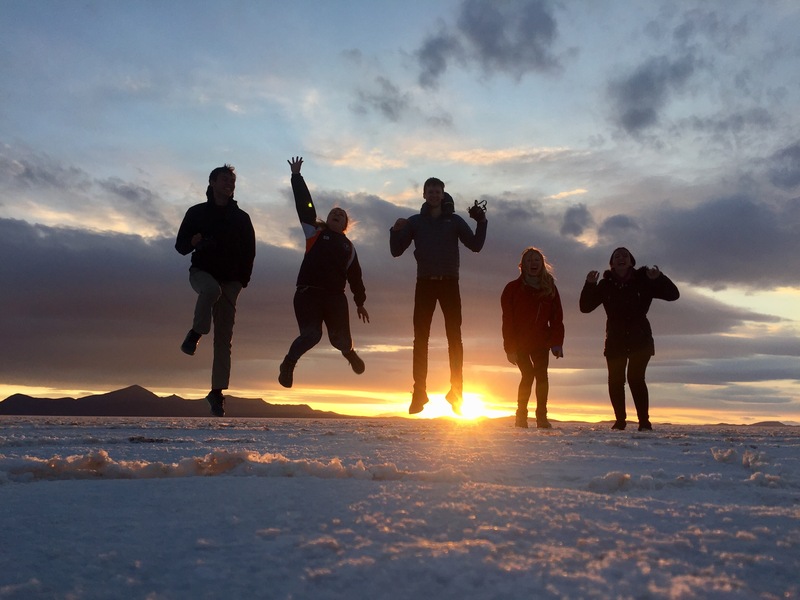 I’d been quizzing each traveller I’d met who had already been there on what it’s like and which tour company they went with to make sure I had a truly amazing experience when I reached the salt flats myself. 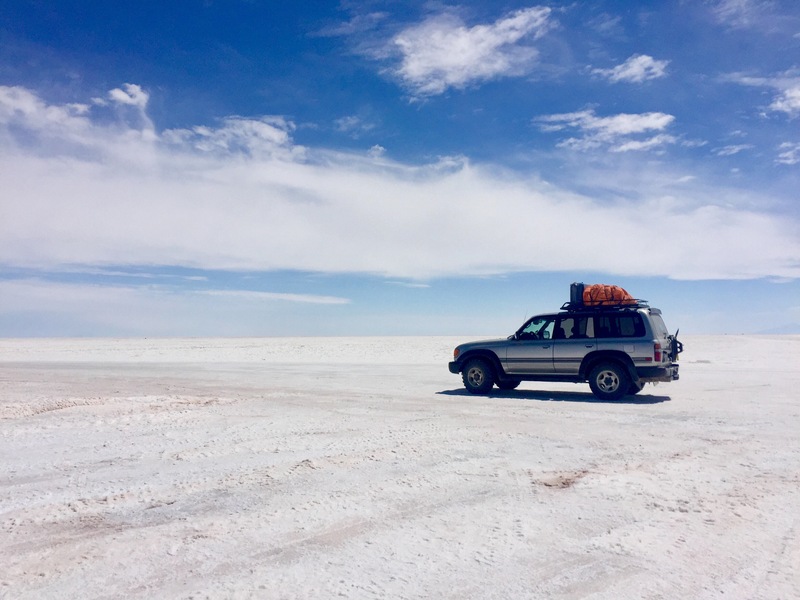 Catching a bus from Sucre was the start of my adventure to Uyuni. 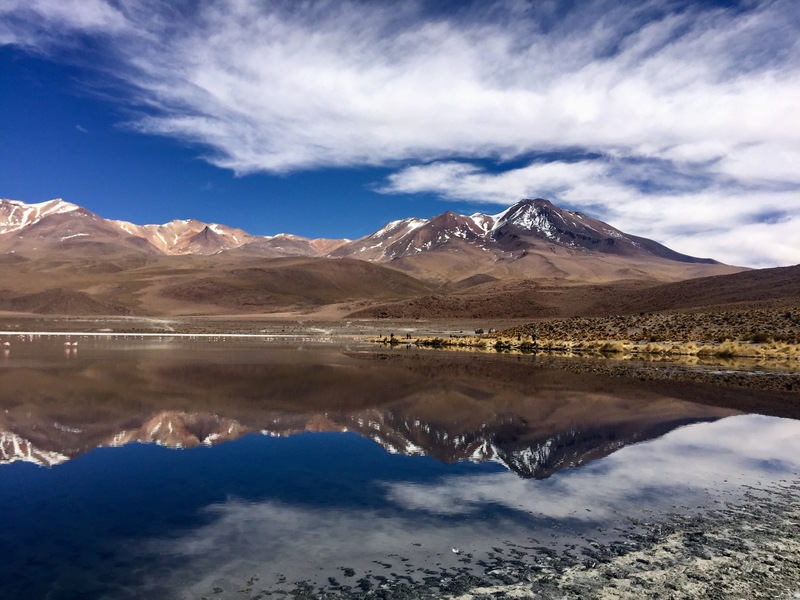 Bolivia has a national holiday which basically translates as ‘no cars day’ – due to high pollution levels, one day a year there are no cars, buses and lorries on the roads in all the towns and cities across the country for 24 hours. This day was planned for a Sunday that I had intended to use to travel so I was forced into getting a night bus the Saturday before. I was on the second bus leaving Sucre at 8:30pm and was lucky that my bus was practically empty, giving me two seats to spread out on. I had expected the journey to take about 10 hours, arriving around 6:30am so it wouldn’t be worth booking a hostel for the night. I fell asleep without much problem and hardly realised when we’d stopped around 4am. I assumed this was a toilet stop as we didn’t have one on the bus, little did I know we had already arrived in Uyuni and I needed to vacate the bus asap. I wandered around in the freezing cold ghost town wearing thin cotton trousers and flip flops thanking God I’d downloaded a map and had my Lonely Planet bible on hand to find a hostel nearby. After lying in until just before 10am, I ate the hostel breakfast and made some plans for finding the right tour provider to suit my needs. 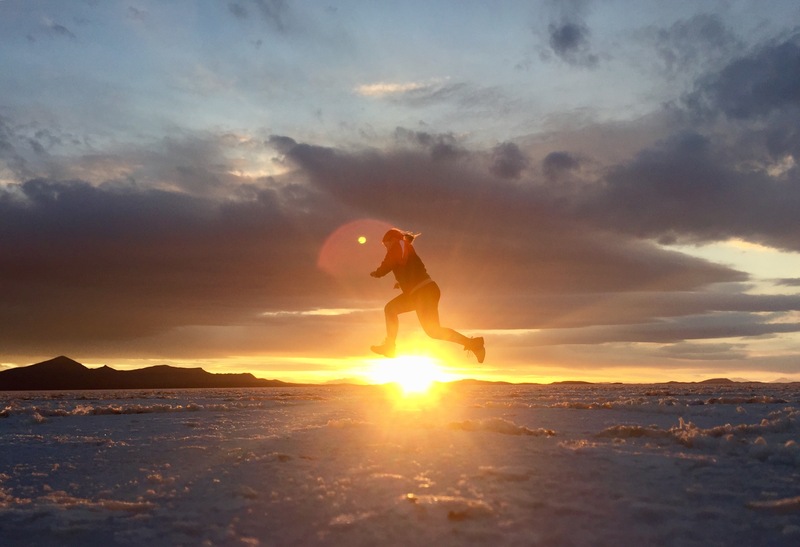 Uyuni is a very small town in the desert where most tours of the salt flats start from and consists of hostels, restaurants and hundreds of tour operators all offering variations on the same trip. So I did some research and made a list of my requirements. With the help of the LP bible and TripAdvisor I set out with a list of four operators to talk to, but seeing and it as a Sunday and a national holiday, this was harder than I thought it would be. My first stop, Cordillera Traveller, had a charismatic sales attendant and a good price (1220 bs) but no English speaking guides available so I unfortunately had to rule them out early on. Next I spoke to Red Planet, a high-end tour operator. They only did 3 day trips but had everything else on my list for 1450 bs. Next up on my list were Esmeralda Tours but their office was closed all day so I couldn’t get a quote from them in time to compare them with the rest. Finally, Salty Desert Aventures, number 1 on TripAdvisor, offered the same as Red Planet for 1250 bs. I wasn’t as convinced by their sales advisor but the reviews were really strong so I decided after comparing them with Red Planet to go with them. This took up most of the day and wasn’t an easy choice but I hoped I had made the right one. The trip started at 10:30am the next day when I met my group for the next 3 days who I’d be sharing a jam-packed Toyota Land Cruiser with. My group was made up of a Belgium couple, a French girl and a British guy – we were all aged between 21 and 26 years old. Thankfully they turned out to be a great bunch of people and we all got on really well, mostly bonding through our dislike of the tour guide. This was probably the only negative of the trip for me – our guide was an idiot – but at least it kept us laughing for most of the trip and we had a great driver so we could fact check his information at least. The route for the tour is pretty standard and you soon realise that all the cars go the same way and stop off at the same places for the majority of the three days. The first stop is a train graveyard which was really interesting to walk around and people were climbing on top of rusty trains in all directions. We only spent a short time here before driving to Colchani where the local community manufactures salt from the salt flats. 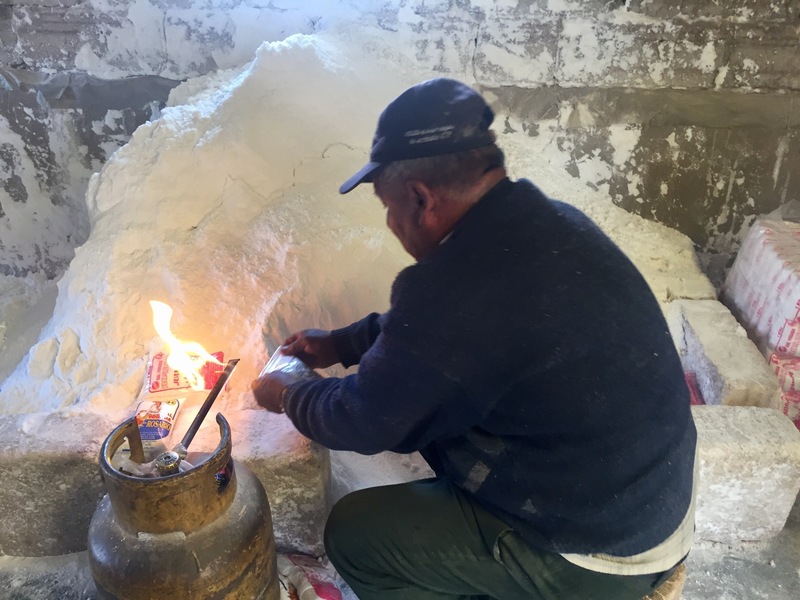 We were briefly explained how the process works and watched a local man package salt. I would have liked to know more about this but the manufacturing isn’t done on a industrial level so perhaps there wasn’t that much more to know. After lunch in Colchani, we headed off to see the salt flats themselves. I was so excited to finally see them after months of anticipation and they did not disappoint. 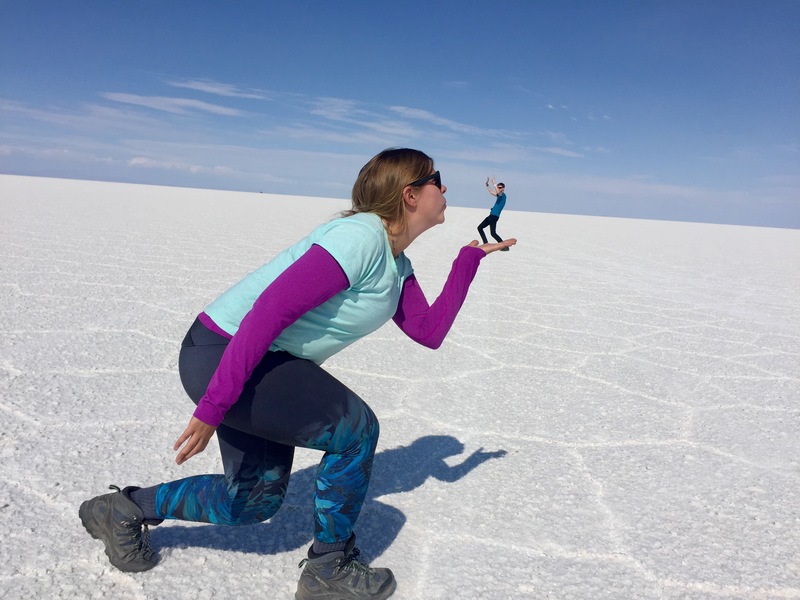 It’s dry season in the salt flats at the moment so we could see the amazing polygon shapes formed by the salt crystals and had ample opportunities to take lots of fun perspective pictures. I could have spent hours taking pictures here and not gotten bored of looking of the amazing salt planes. I can’t describe how truly spectacular they were but hopefully some of the pictures managed to capture their magic. 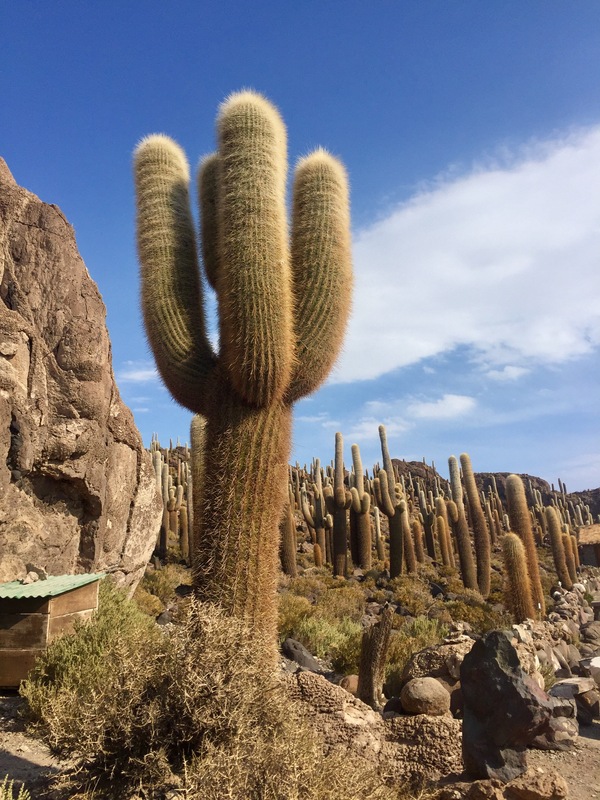 Next we went to Incahuasi Island which I would rename cactus island because it was covered in hundreds giant cacti – apparently they grow 1-2cm a year so they must have been hundreds of years old. 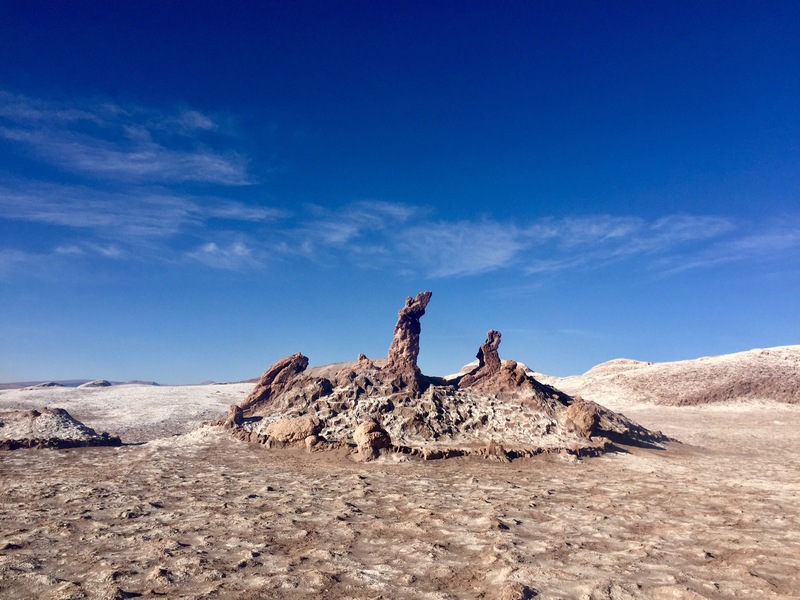 The salt flats are caused by the evaporation of what would have been a sea within Bolivia so although not technically an island now, Incahuasi is surrounded by the salt flats like an island. We had plenty of time here to enjoy the amazing views, take pictures and relax in the warm weather before heading off to take sunset pictures on the salt flats. Although it was cloudy, I took some great pictures here and I was sad to leave the salt flats so soon; the day had felt like a matter of seconds for me. Too soon we drove out of the salt flats and onto our accommodation for the first night, a hotel made out of salt with salt bricks and a crumbly, salty floor. The next day we were back into the car and off driving south, away from the salt flats and towards Chile. 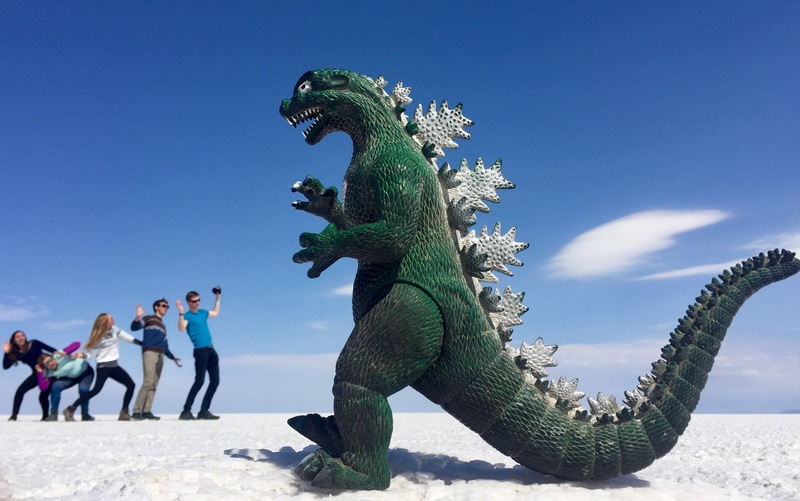 I was disappointed to only get one day, basically half a day, in the salt flats but that’s just how it is unless you book a bespoke tour and I don’t think I would have enjoyed this on my own. Now we were driving through high-altitude desert to lagoon after lagoon and rock formation after rock formation. The scenery was really impressive and like nothing I’d seen before on my trip or in my life. Although it did feel repetitive, they were all as amazing to see as the last and the novelty didn’t really wear off as they all had their own distinct differences. If I’m honest I can’t remember the names of all the lagoons but looking online, I think, we went to Laguna Cañapa first and saw loads of flamingos which we were able to get really close to. The lagoon was highly reflective and I could take some beautiful pictures of the surrounding mountains and volcanoes. At this point I wished I had my proper camera with me. Next we went to Laguna Hedionda (I think) which was similar but a much lighter colour of water so the reflection was different and the lagoon was larger. We had lunch here and the views were so tranquil that I almost forgot about missing the salt flats. More lagoons followed after lunch with Laguna Honda up first and this was an even paler blue lagoon. The light sandy coloured shores made the lagoon look different to the previous two and I think this one was close to my favourite, despite or because of the lack of flamingos, I can’t decide. 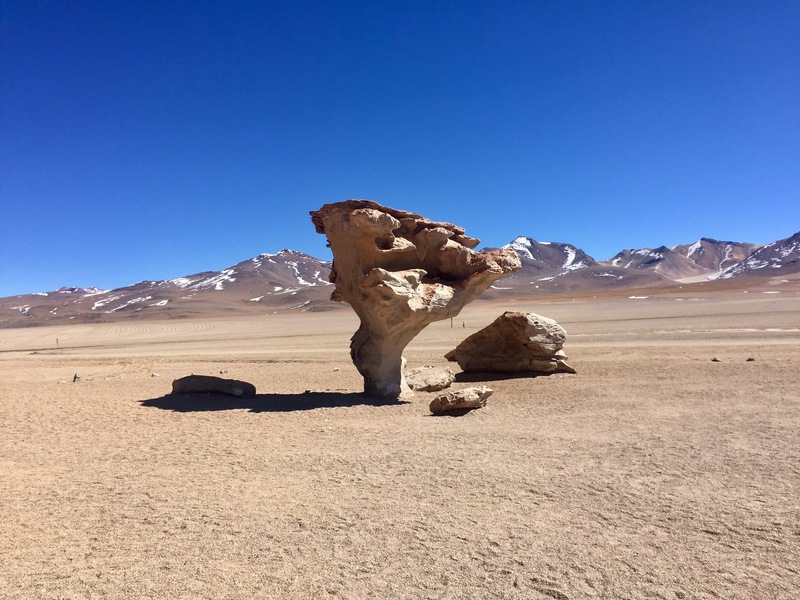 Next was a quick stop at the Rock Tree, basically some rocks in the Desert of Siloli that look like a tree, but I thought the bigger rocks formations were more impressive. 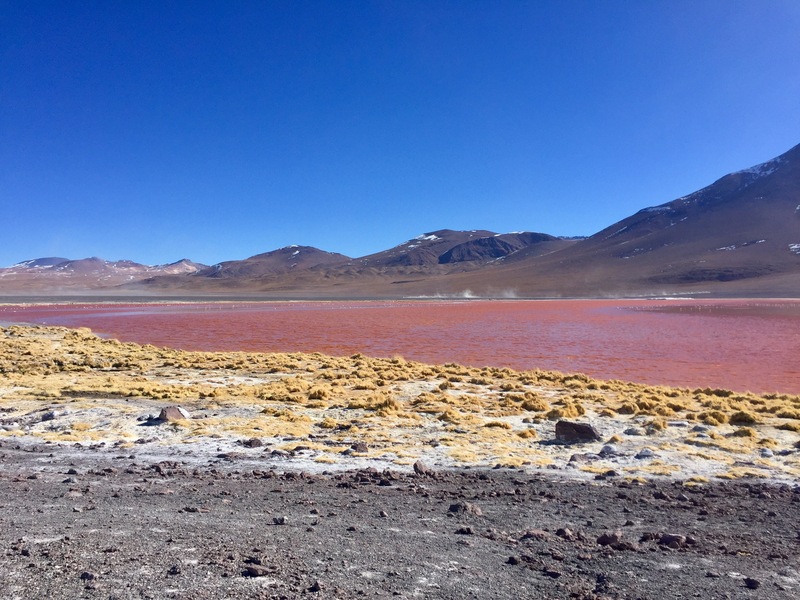 Then we went onto the Laguna Colorada or Red Lagoon (much more helpfully named) and spent an hour walking around the large lagoon in the strong wind. The red colour is caused by the high concentration of red algae and sediments. It was distinctly different to the other lagoons and the offset of red with the surrounding yellow-green shrubs bordering the lagoon made the colour stand out beautifully. 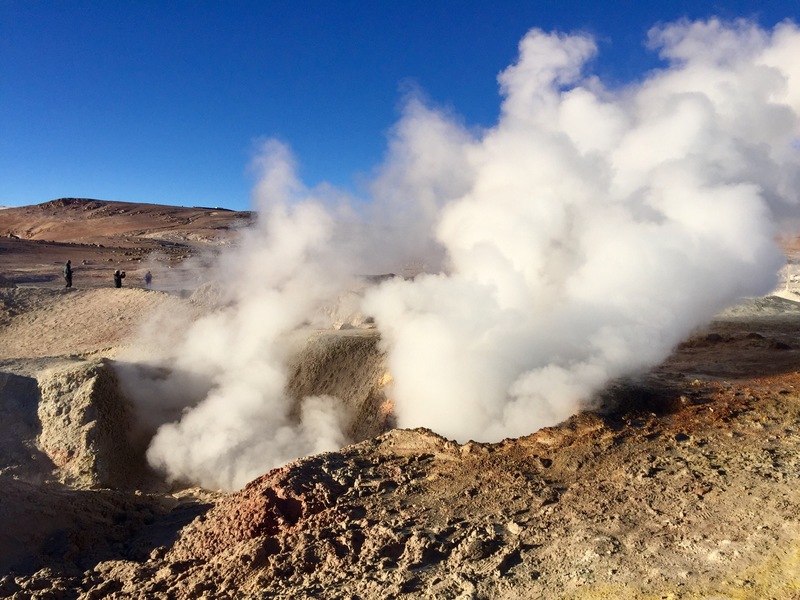 The last stop before our accommodation was the Sol de Mañana Geysers. I’ve never seen geysers before and despite their being quite small, they were still quite impressive. We were free to walk around them however we pleased and I was quite nervous of tripping and falling into one. It was around this point that I realised I’d broken my Kindle, a generous donation from my brother for the trip. I was gutted but it is as least seven years old and had made it all the way around Russia and Asia, and now most of South America so it’s had a good life. Near our accommodation there were hot springs which we went to at night in the brightest full moon I’ve ever seen. This soothed the loss and my aching knees from being cramped in a car boot for two days. On the last day, which turned out to be a couple of hours really when you’re getting a transfer to Chile included in the trip, we went to see the Dali desert, named after Salvador Dali. The barren landscape was quite beautiful so I can see why people thought it had inspired his work. Our final lagoon and my final stop before heading across the border to Chile was the Green Lagoon, only it wasn’t green. It was pretty but apparently there needs to be a wind creating a current to see the green colour and the colouring more obvious between 11am and 3pm, not 9am when we visited. It was just a short trip to the border after this, where I said goodbye to my fellow travellers and joined a bus to the Chilean border. 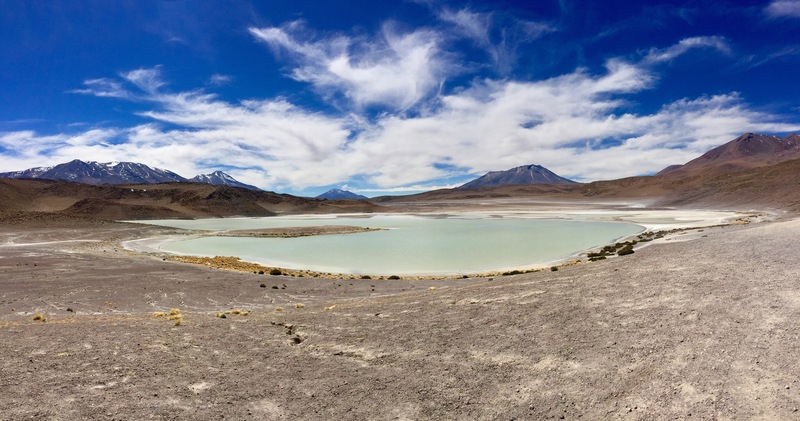 I gave my remaining Bolivianos to the driver instead of the guide – he deserved them more – and waved goodbye to Bolivia, five days ahead of schedule. In my eyes yes it was, and more. 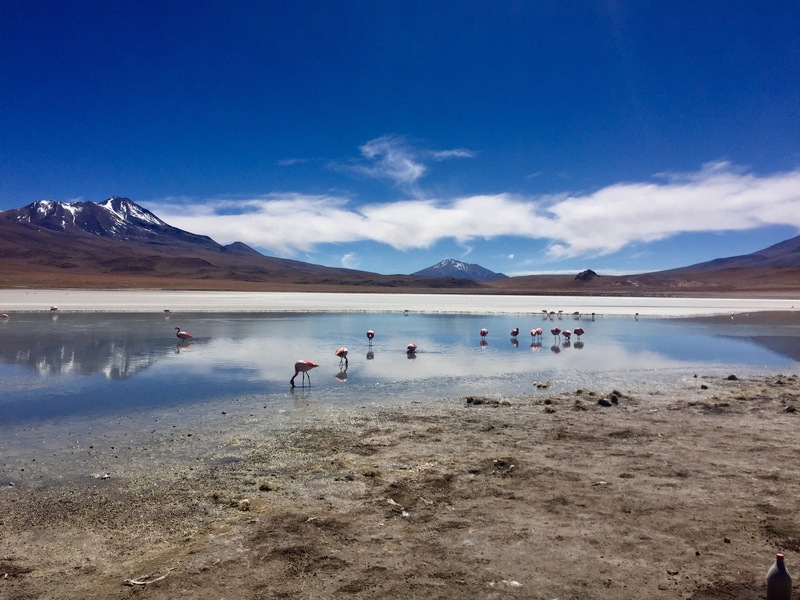 I hadn’t expected to see all the lagoons, flamingos, volcanoes, deserts and geysers, as well as the amazing salty landscape. I’d like to go back in the future with my family to see the salt flats in more detail for a couple of days and learn more about the origin, formation and composition. But at least I’ve left something to come back for. Now onto my last three countries of South America: Chile, Argentina and Brazil – the most expensive places on my list!